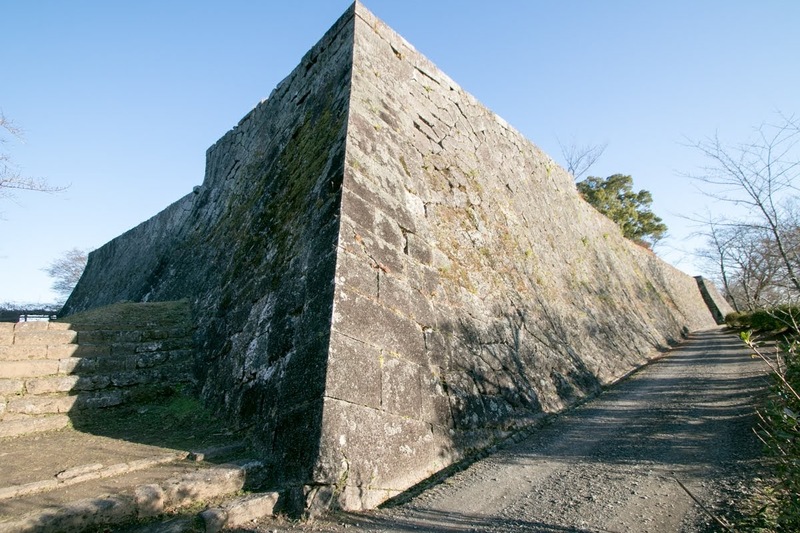 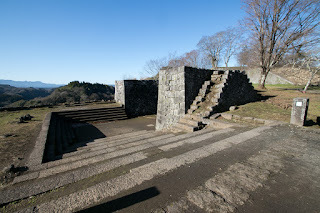 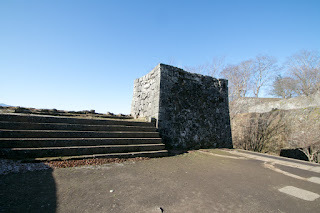 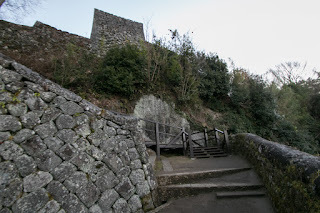 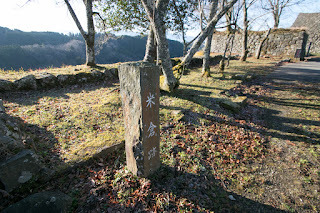 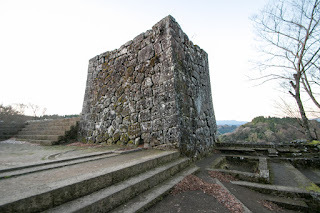 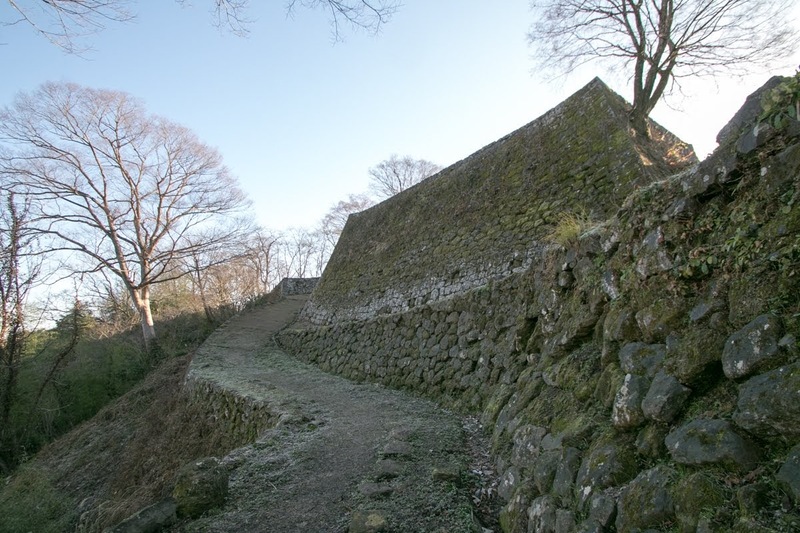 Oka castle (岡城) is located over a long hill of 50 meter height from hillside at the east of Bungo Takada city. 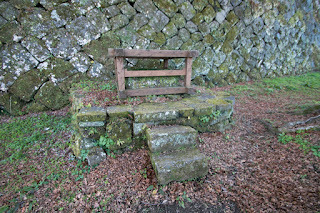 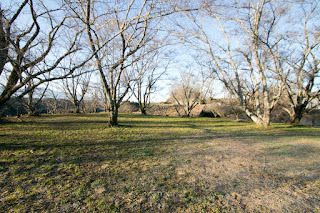 Takeda area is a small basin in the southwestern part of Bungo province (Oita prefecture), and is a connecting point of various roads from Oita city at northwest direction, Saeki city at southwest direction, South part of Fukuoka prefecture at northwest direction through Hita area, and Kumamoto area at southwestern direction passing Mt. 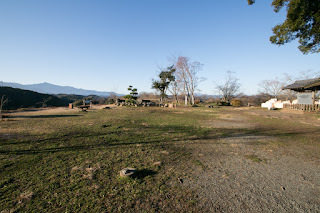 Aso. 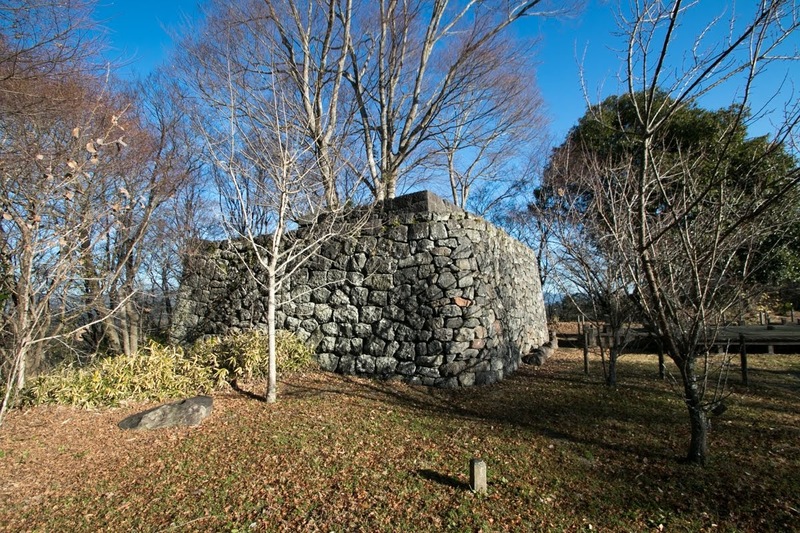 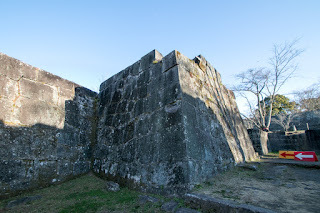 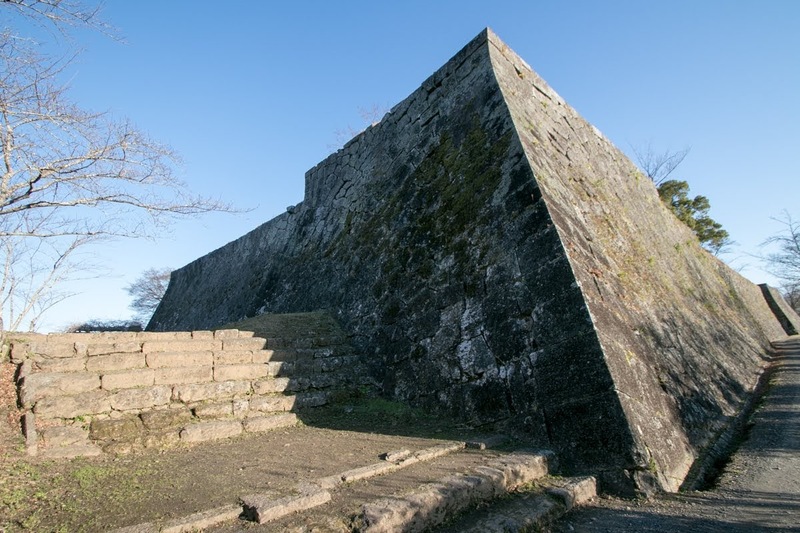 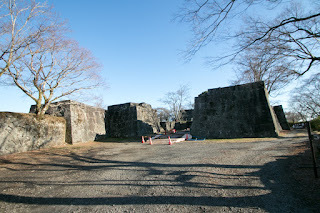 Because of its geographical condition, Oka castle had been an important strategic point of Bungo province for both of defense and offenece. 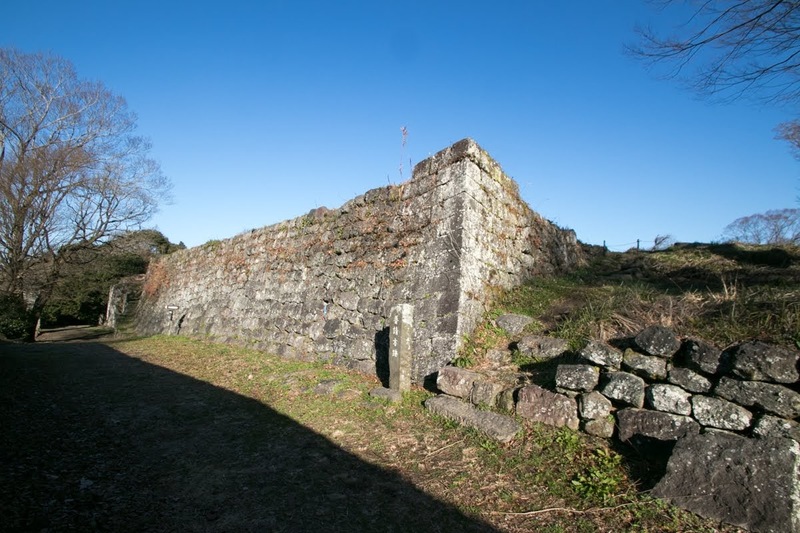 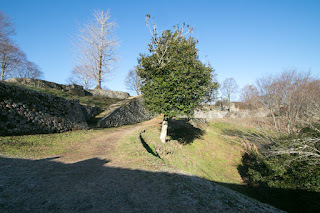 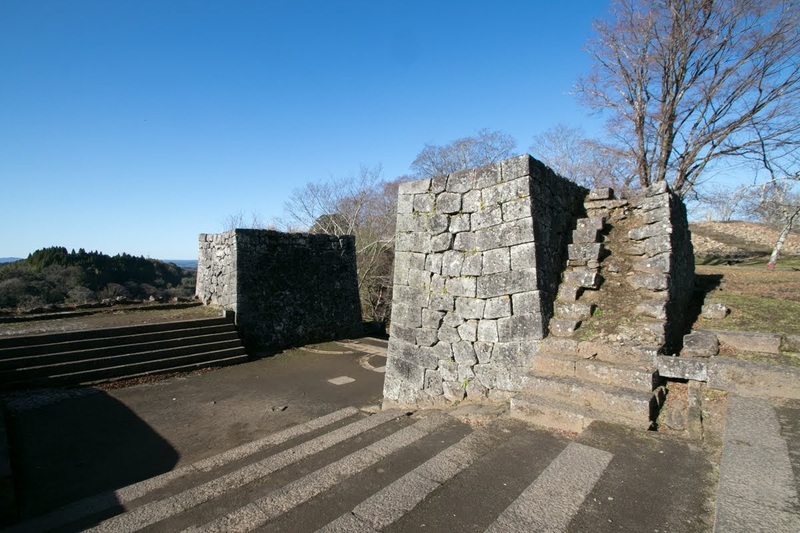 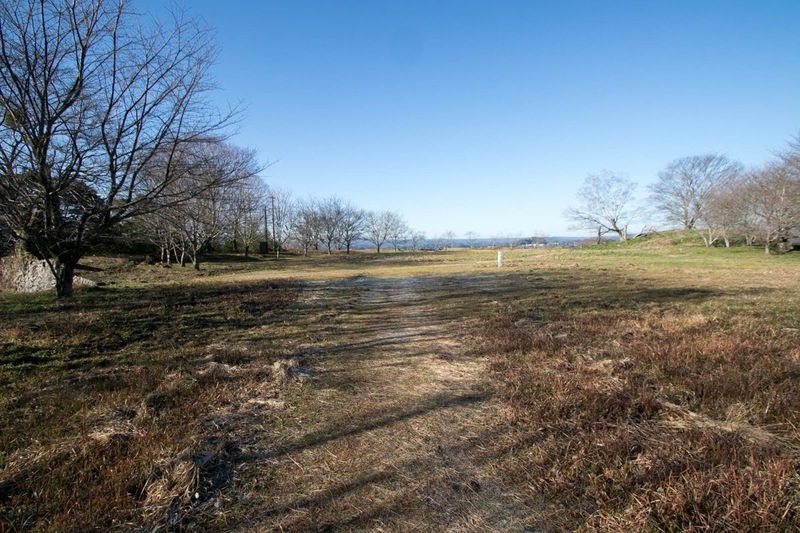 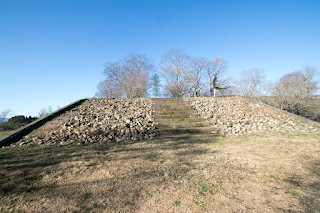 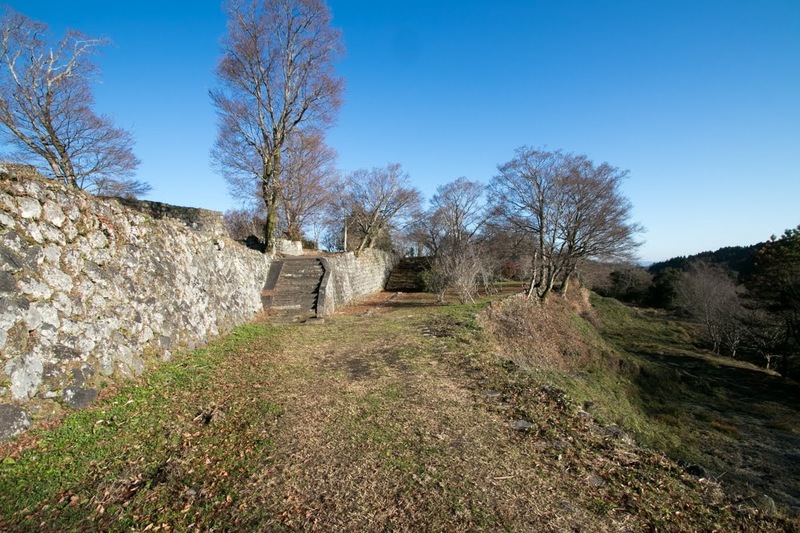 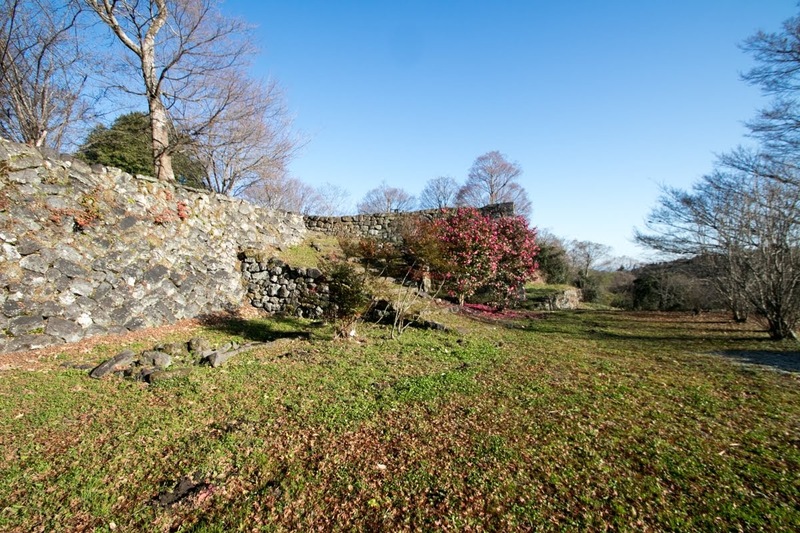 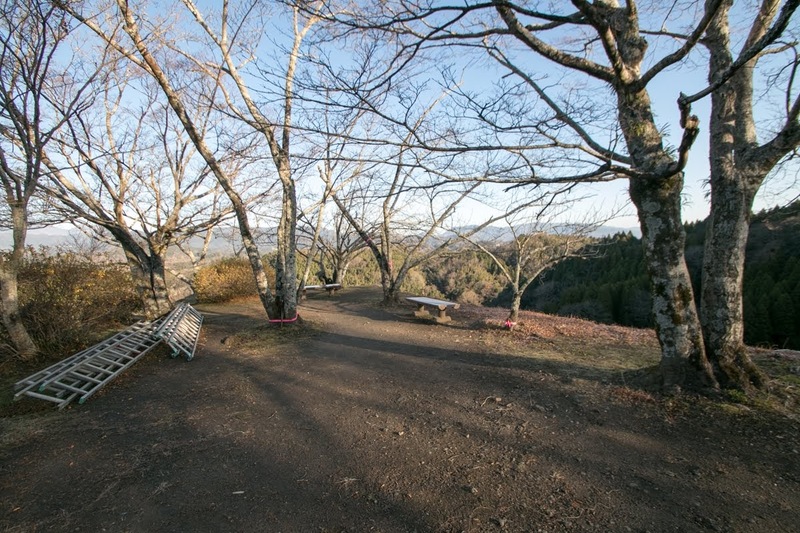 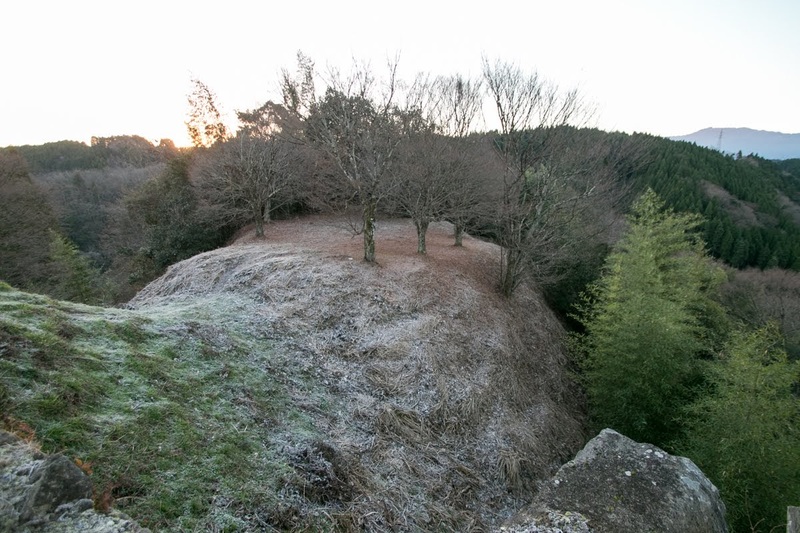 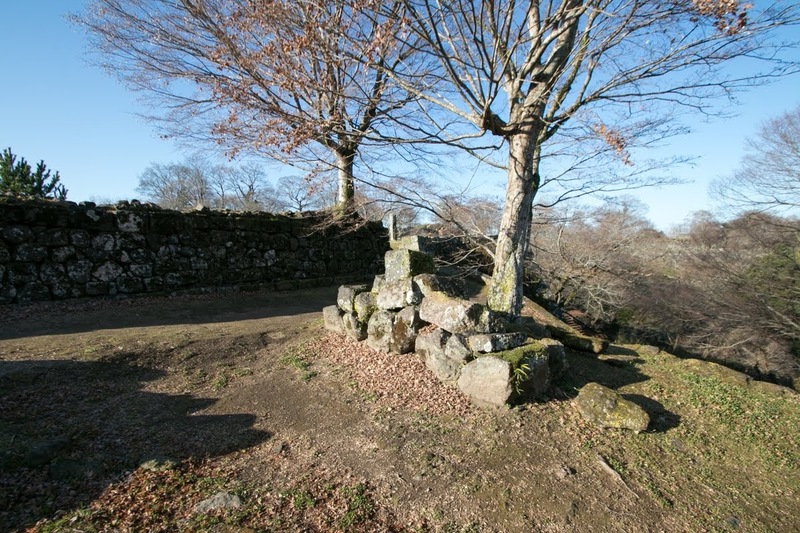 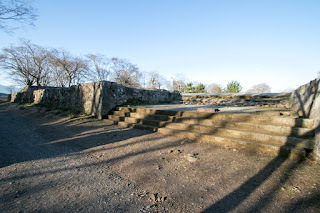 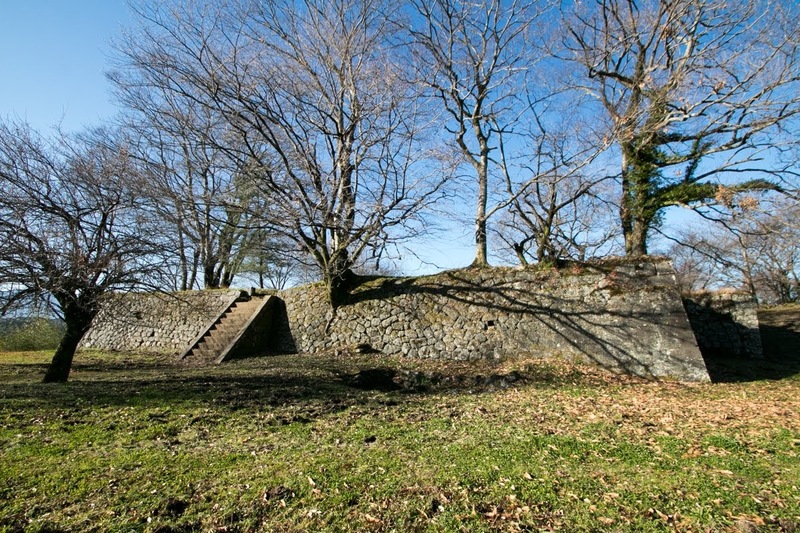 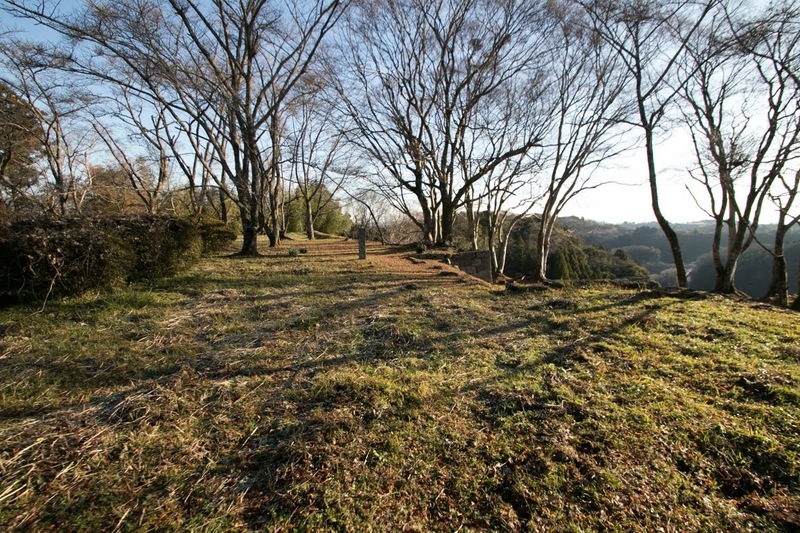 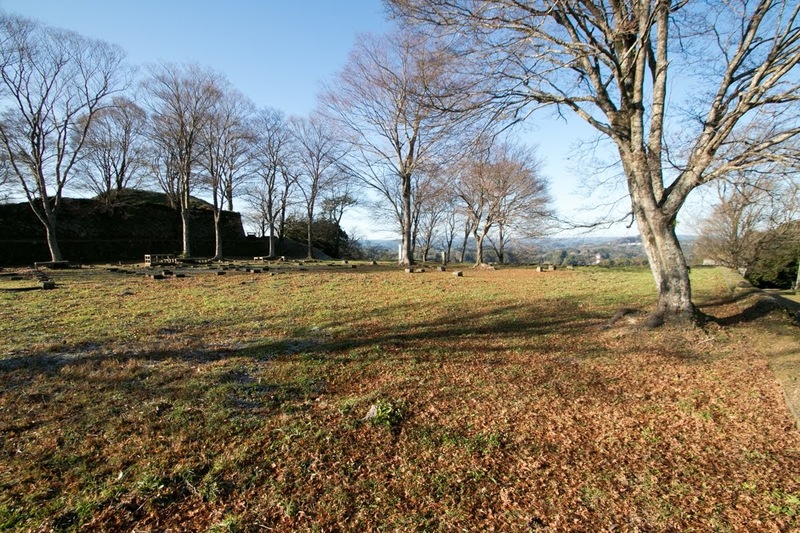 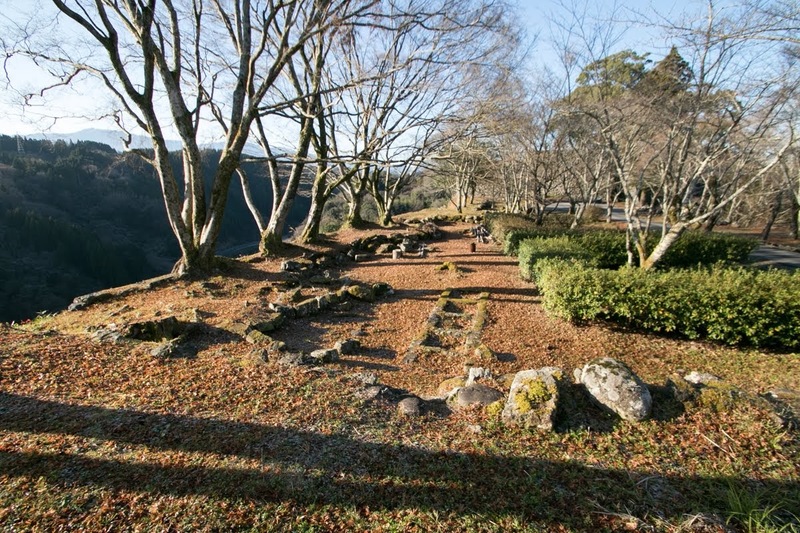 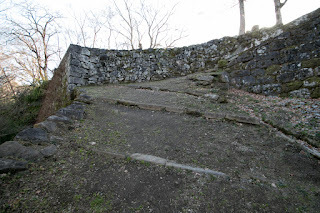 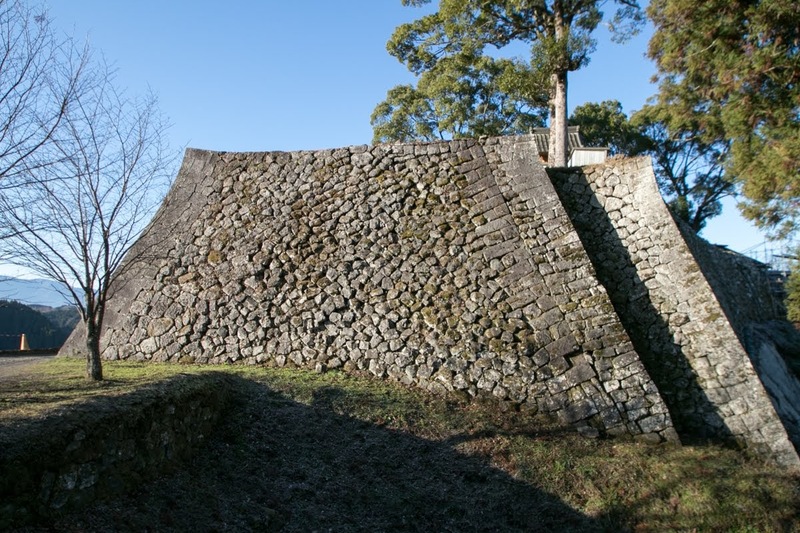 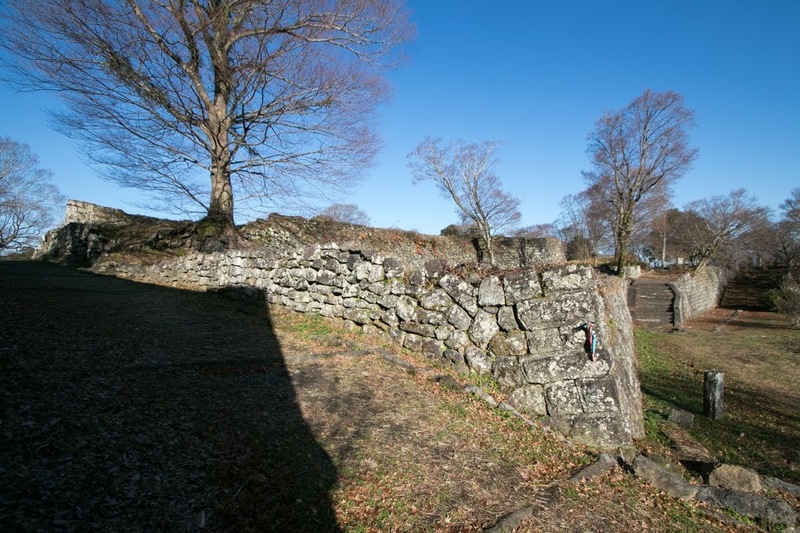 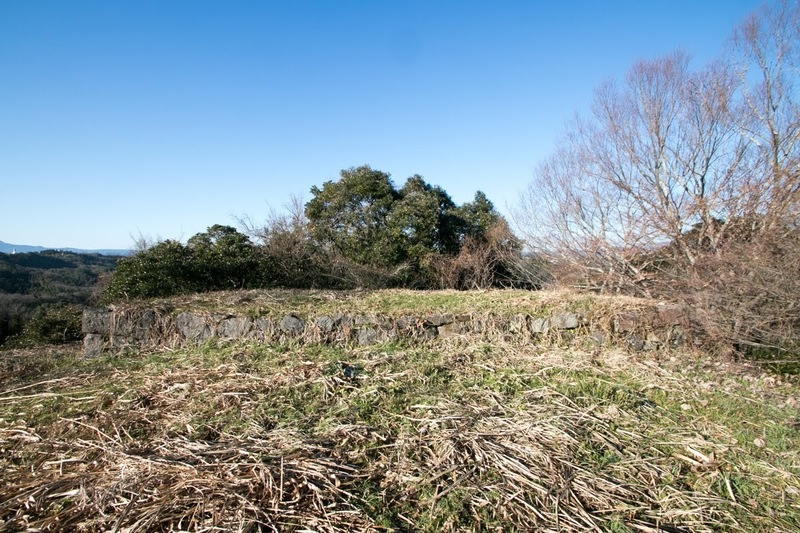 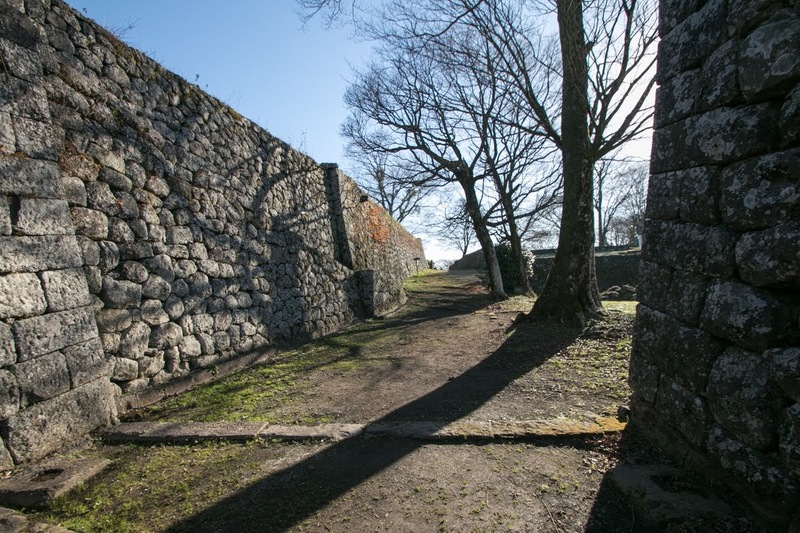 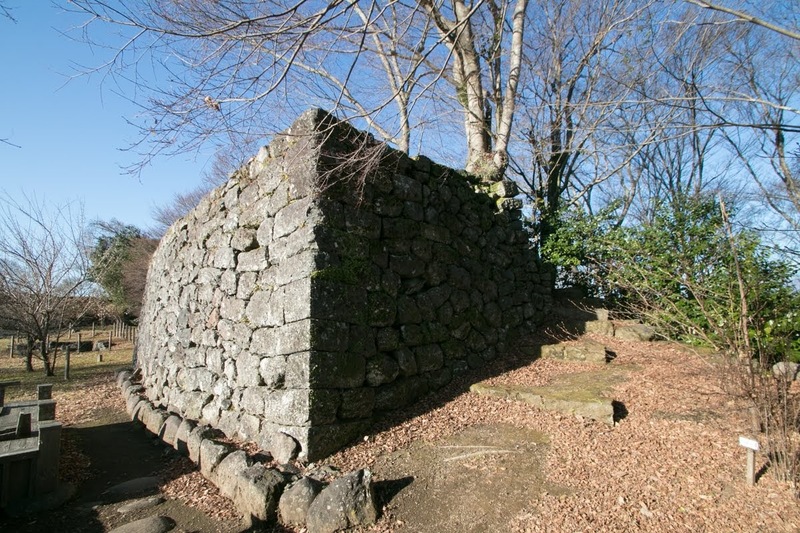 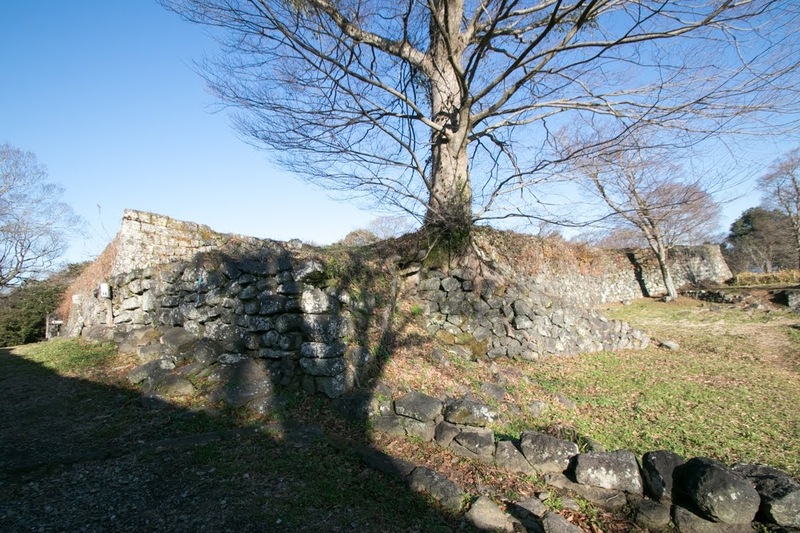 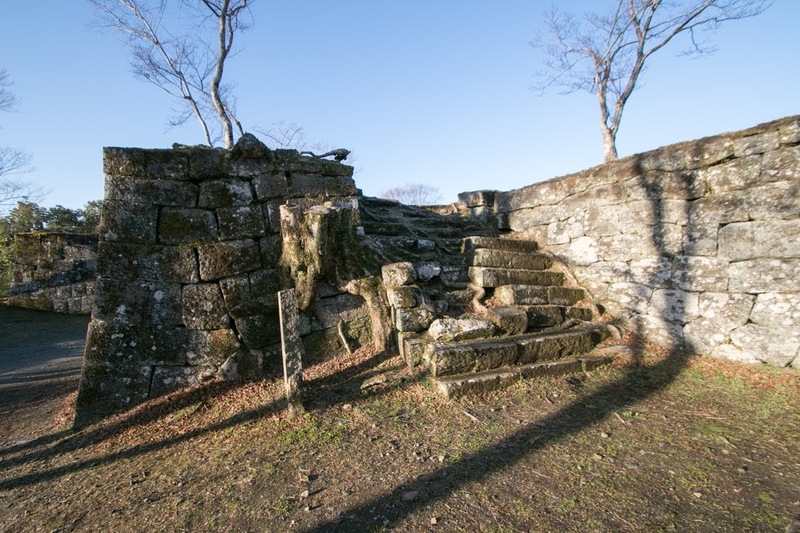 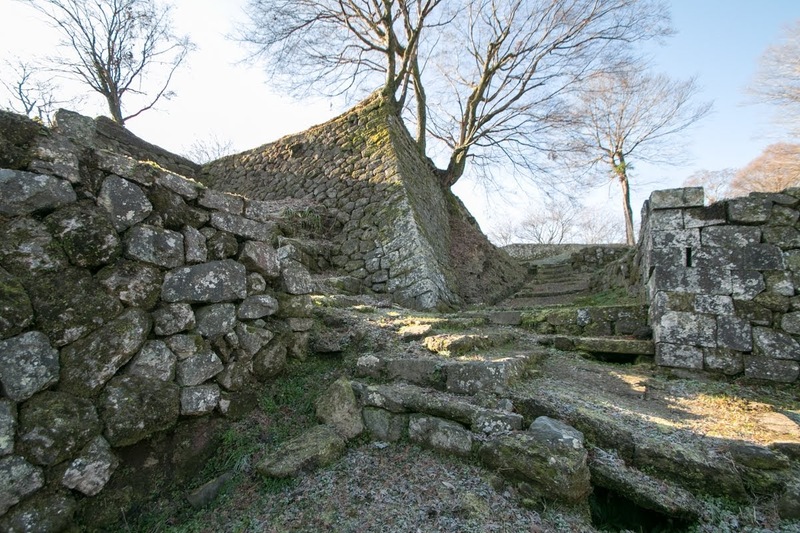 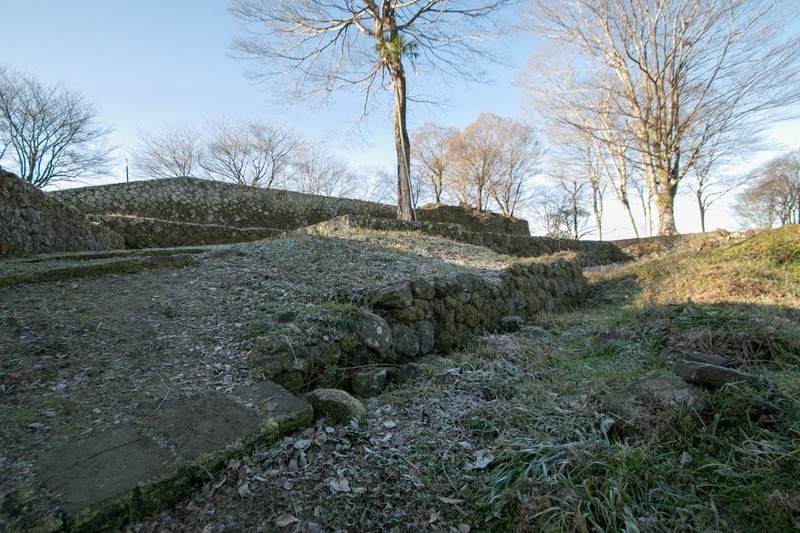 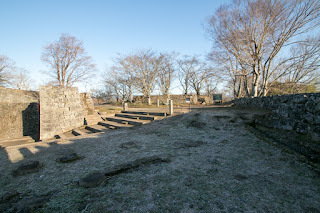 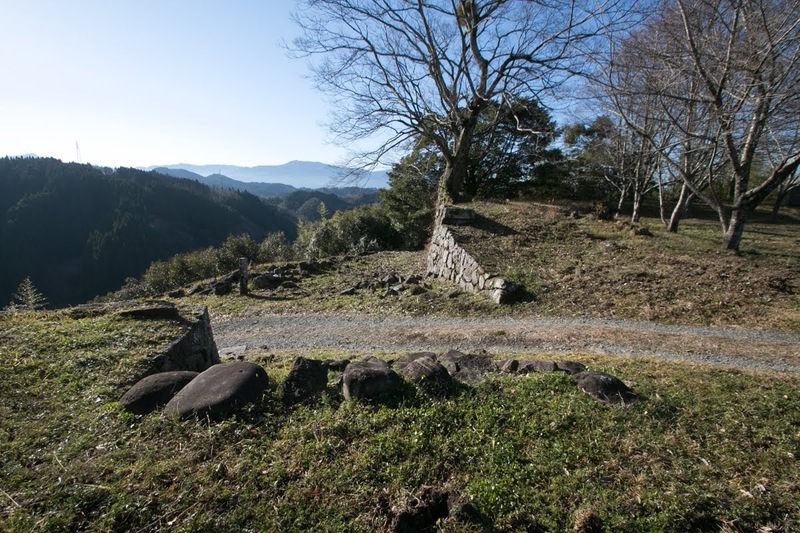 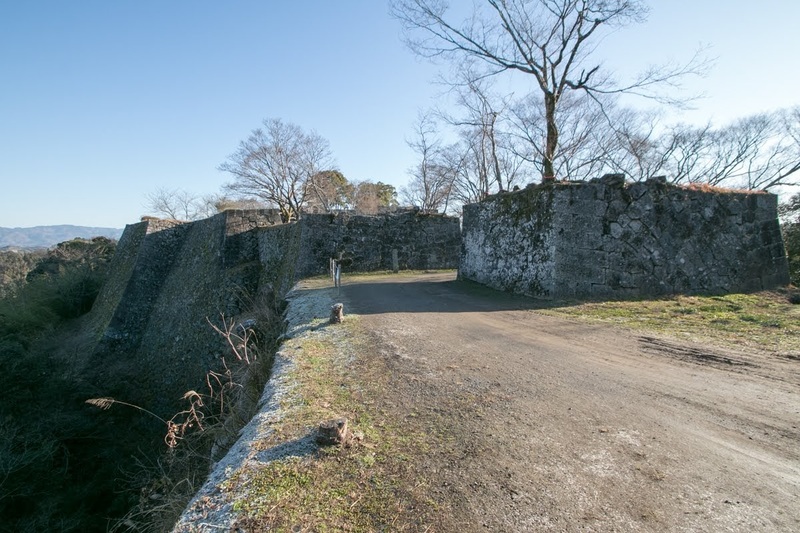 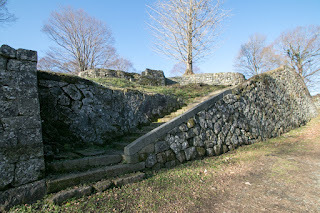 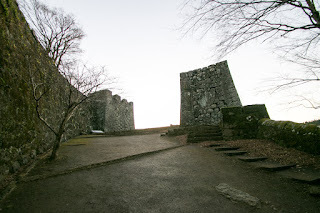 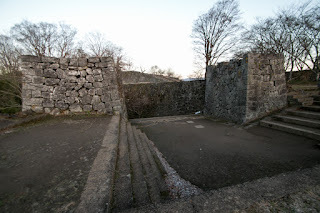 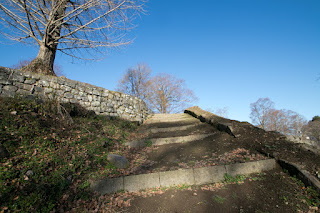 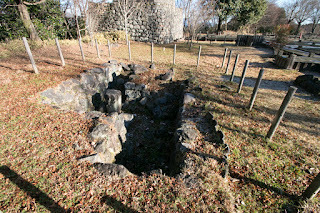 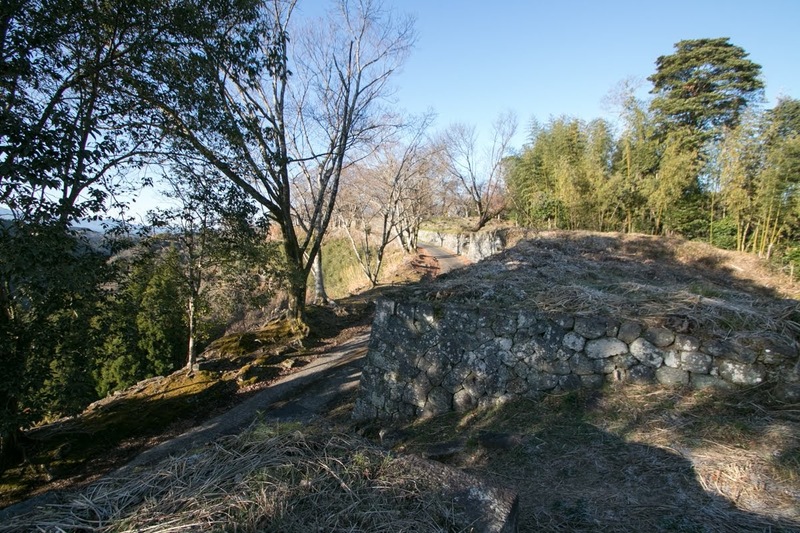 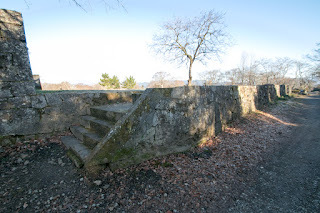 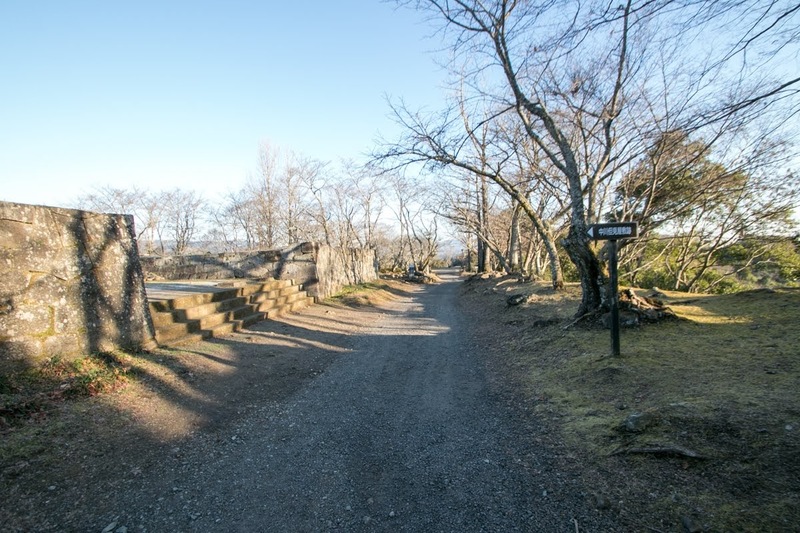 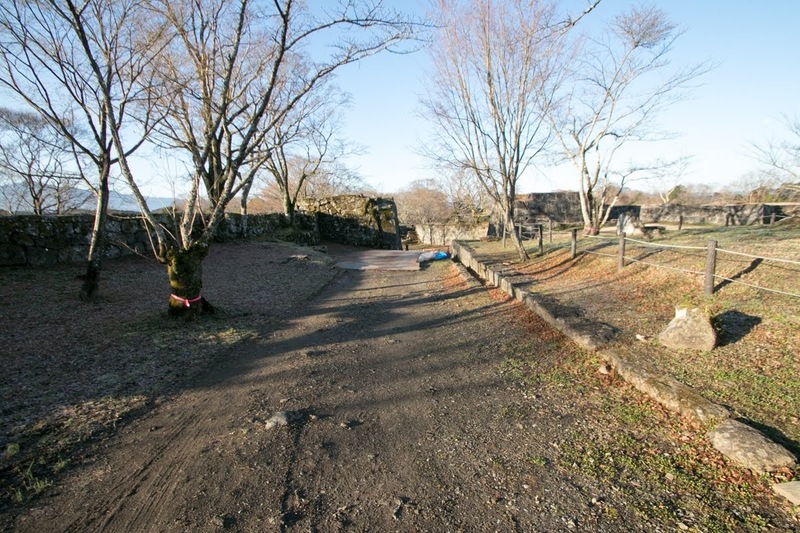 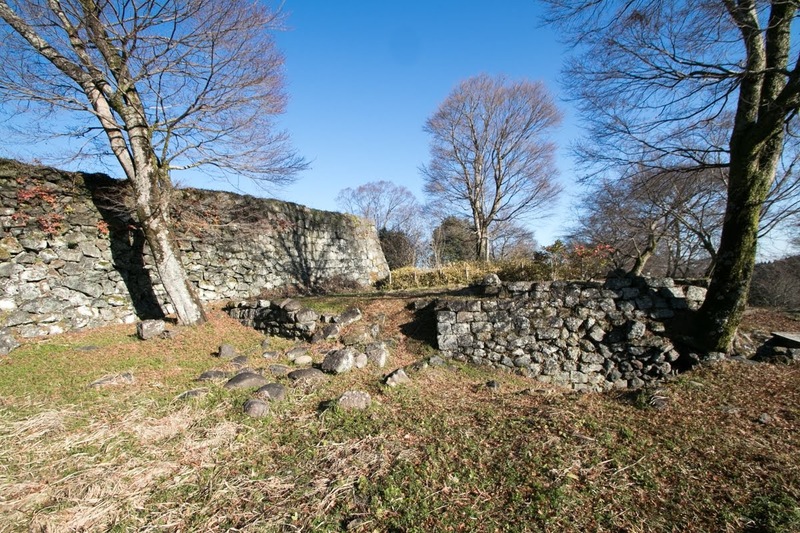 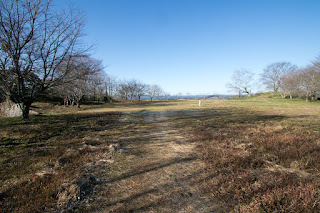 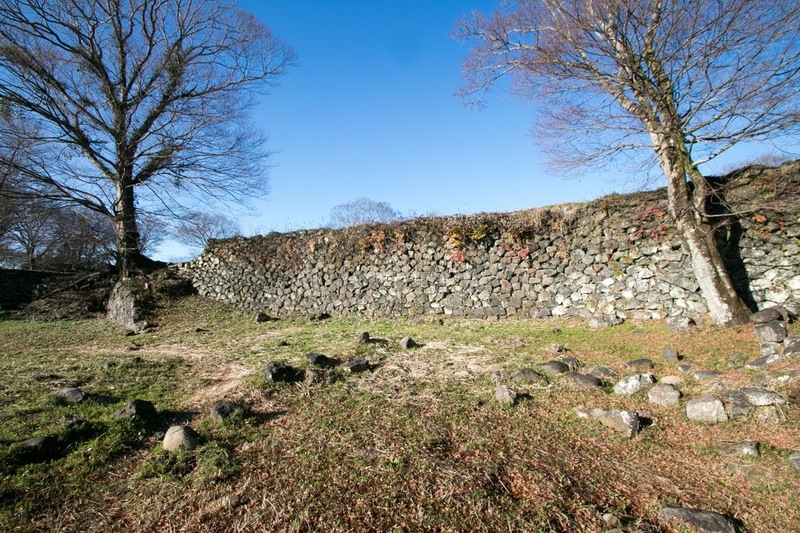 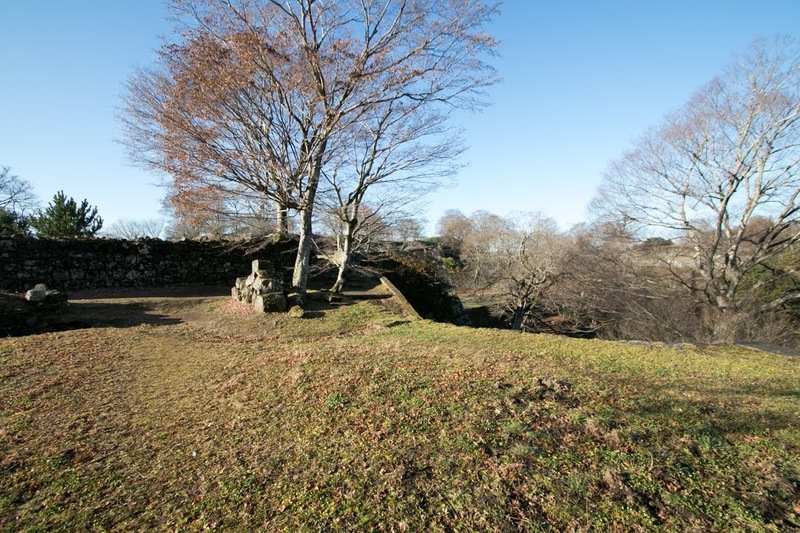 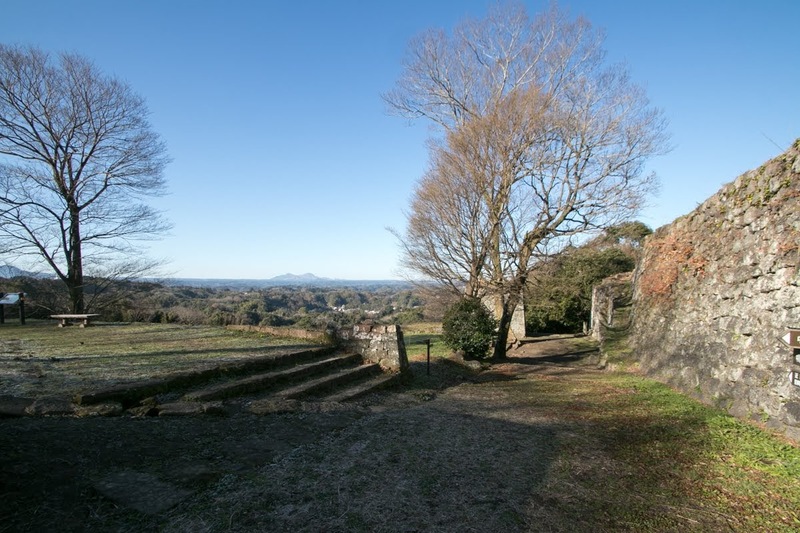 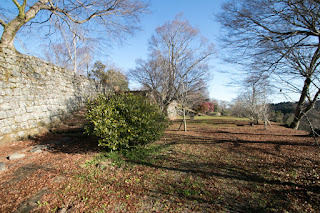 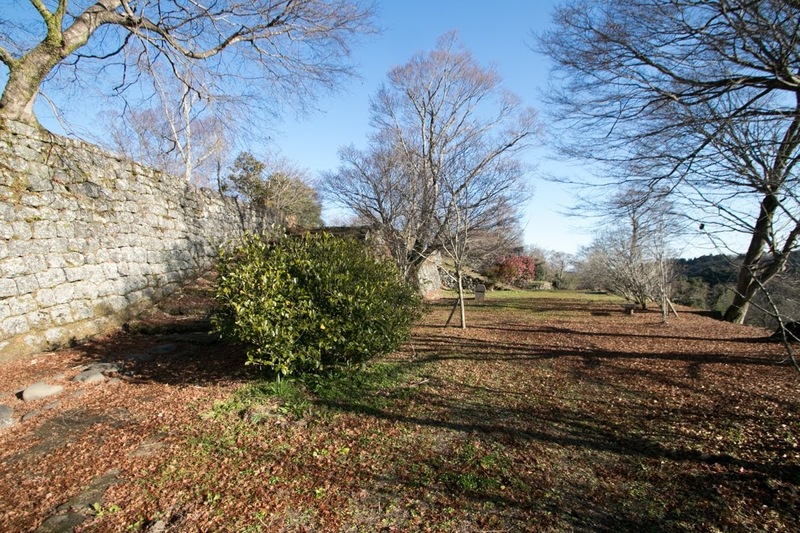 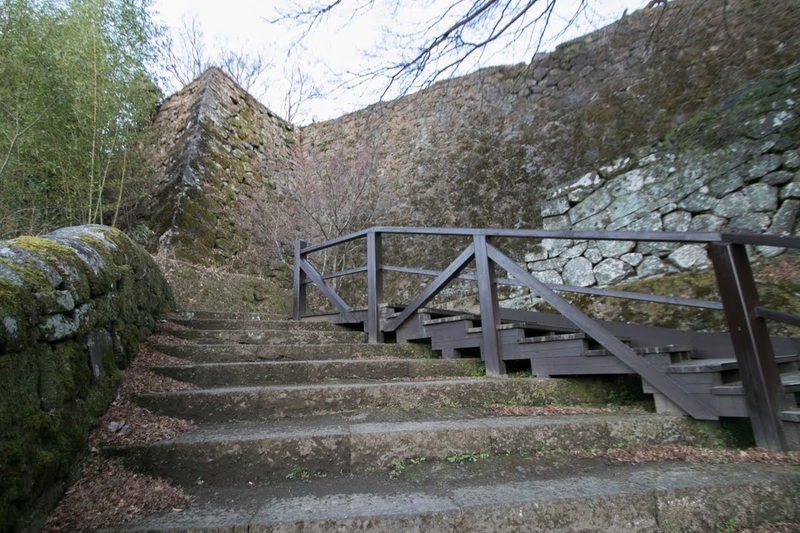 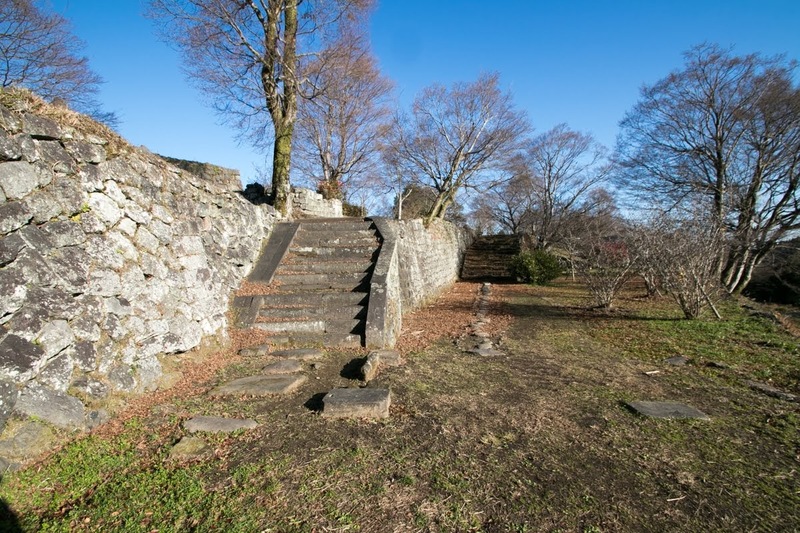 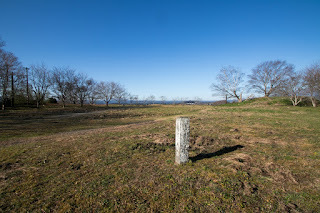 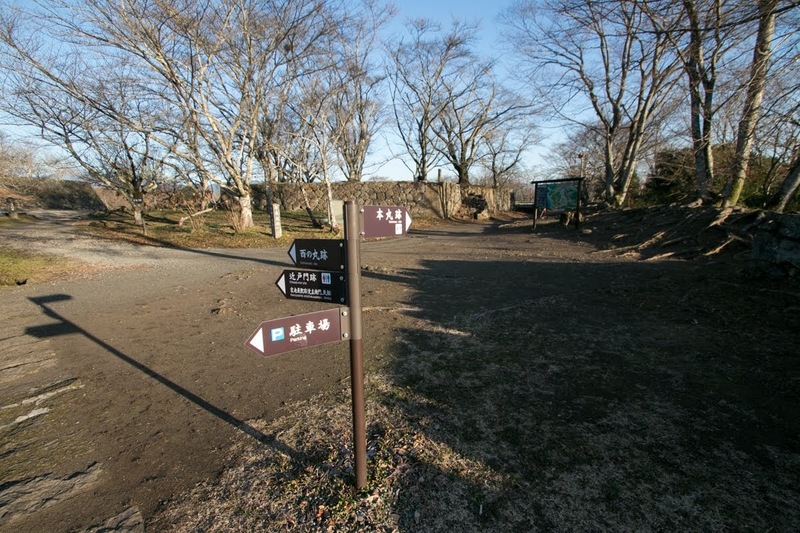 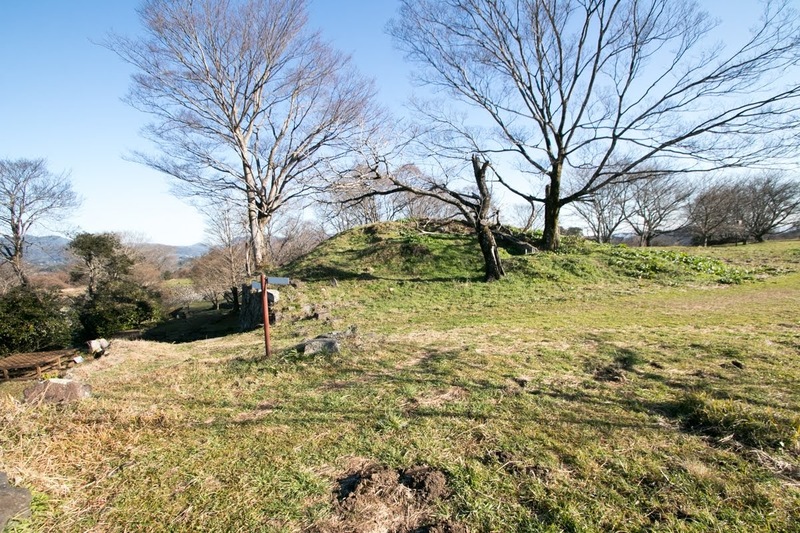 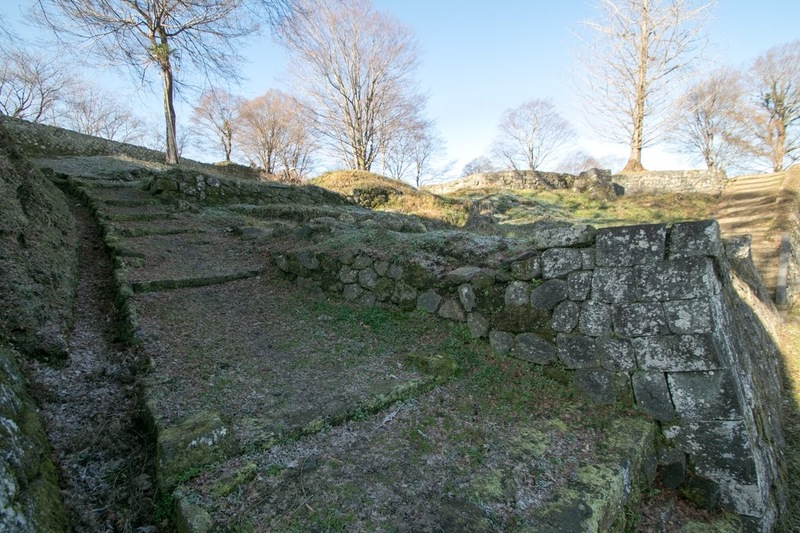 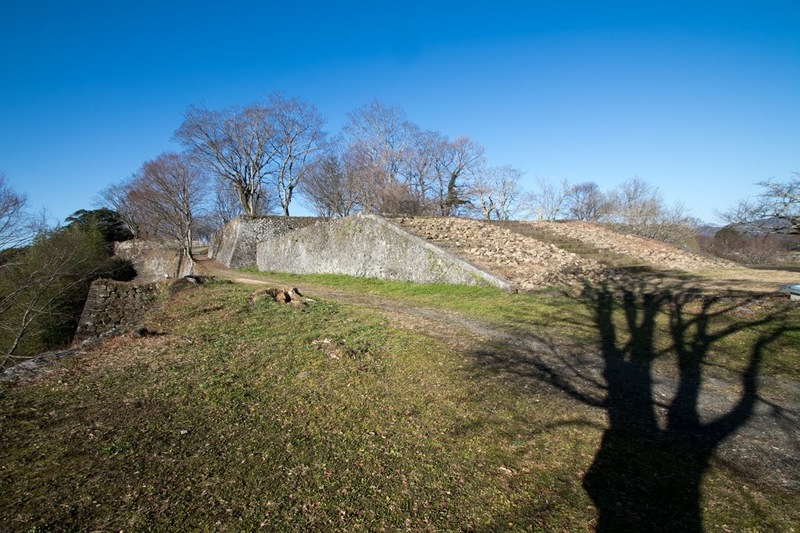 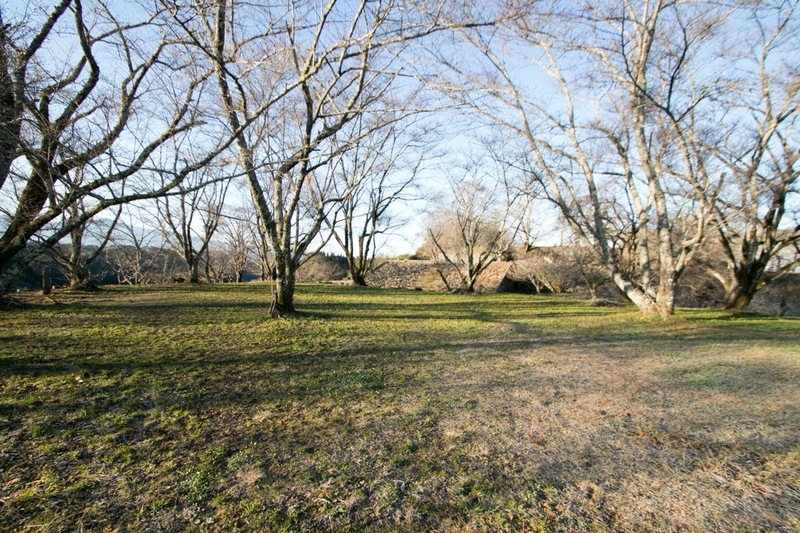 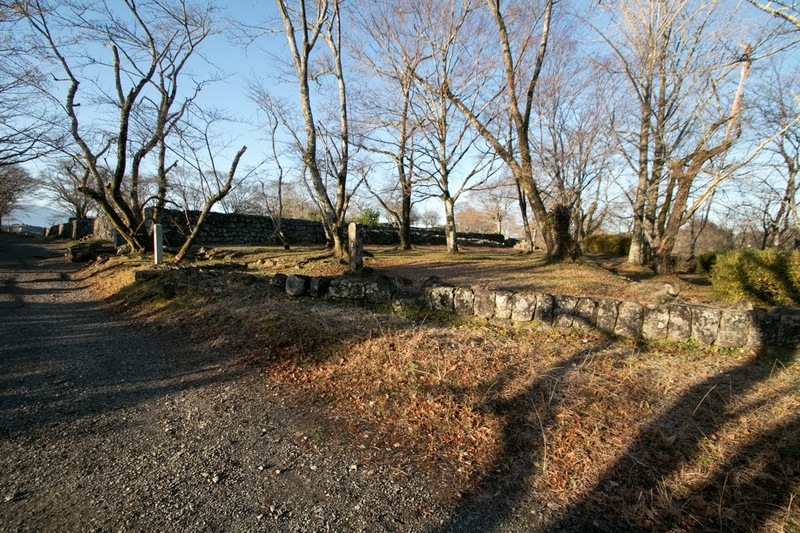 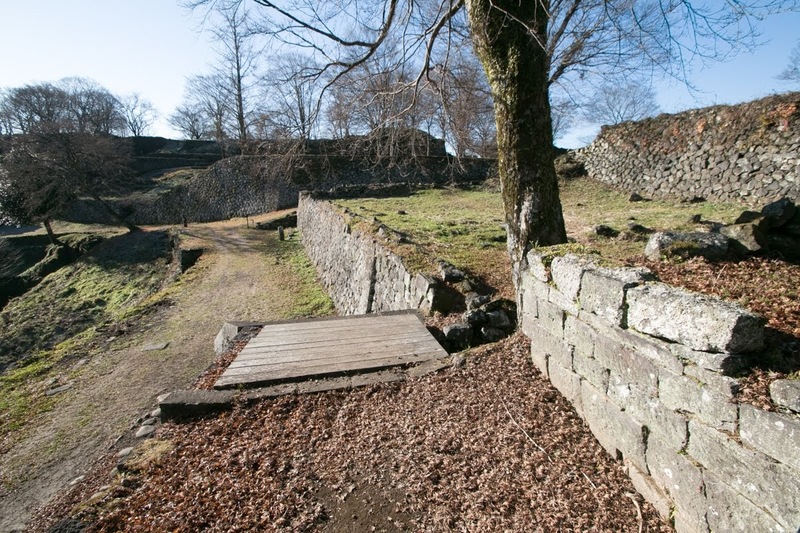 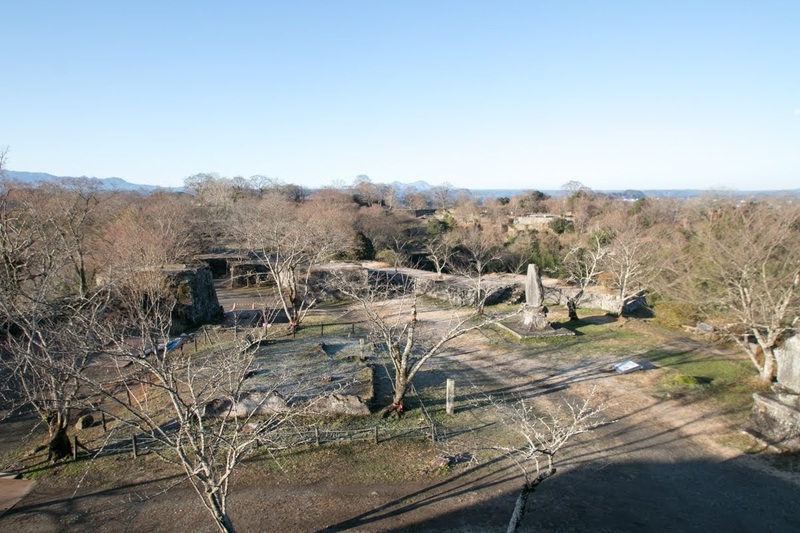 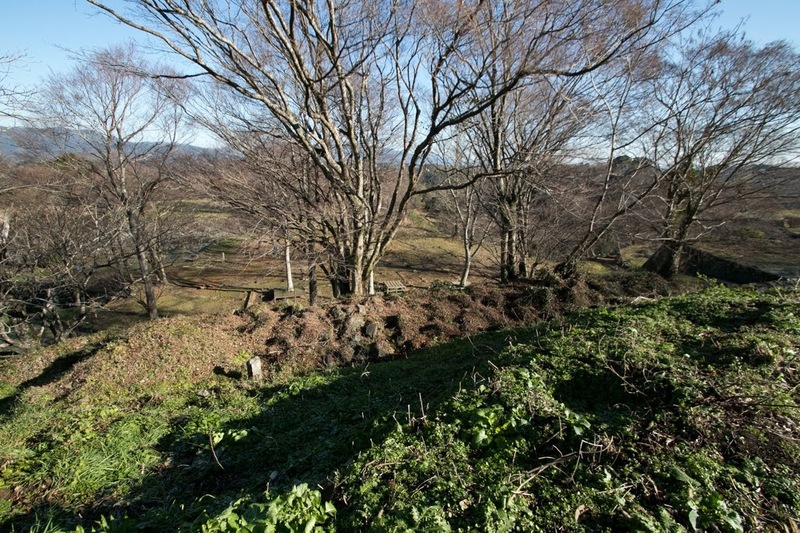 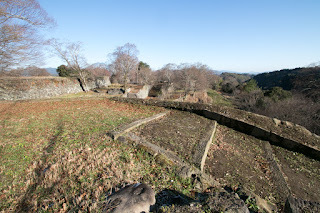 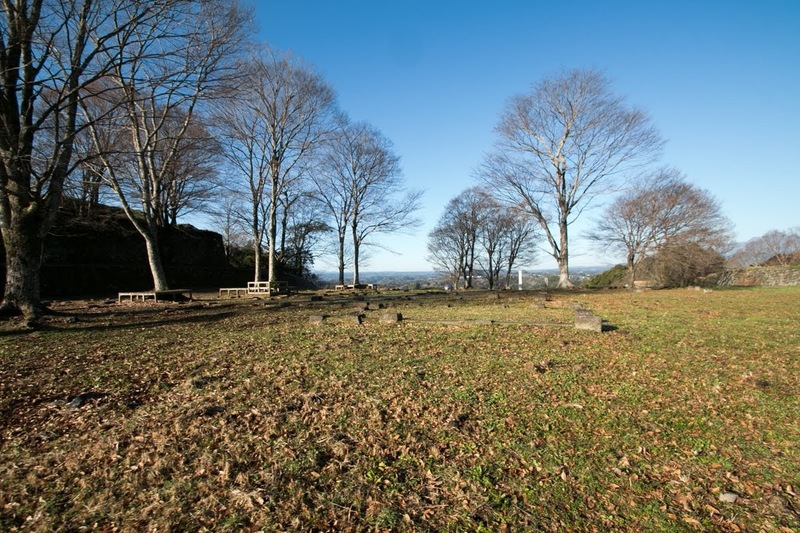 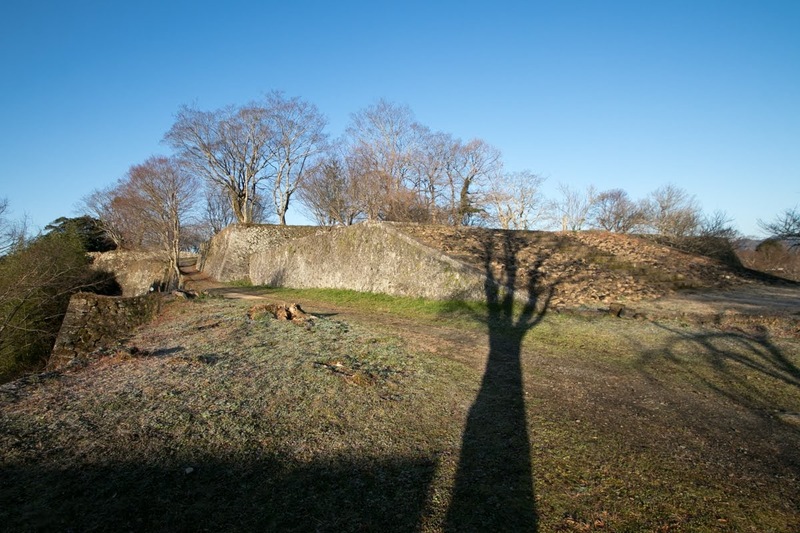 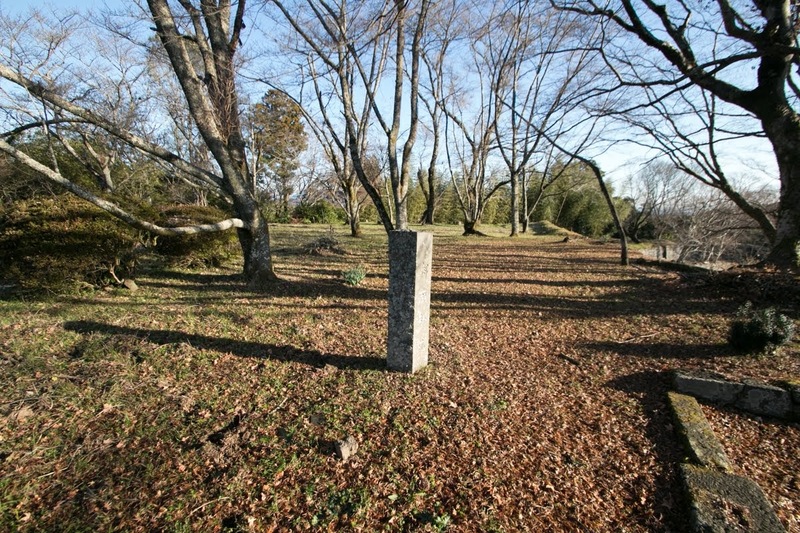 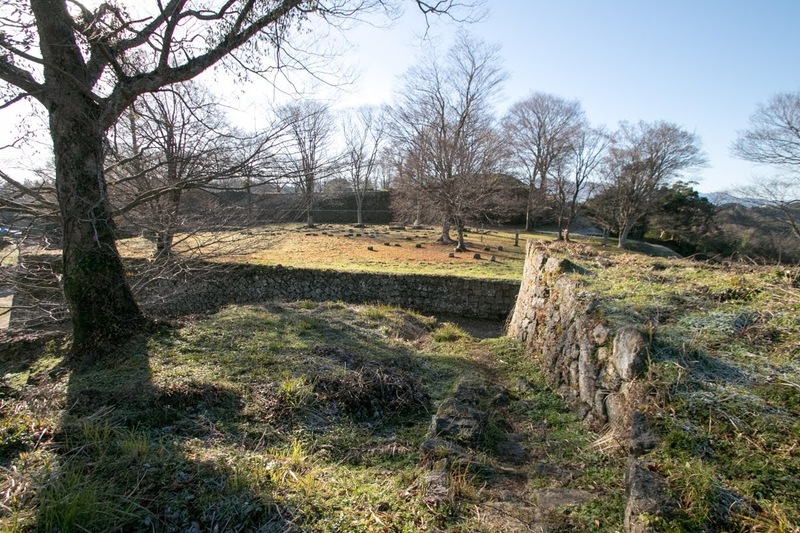 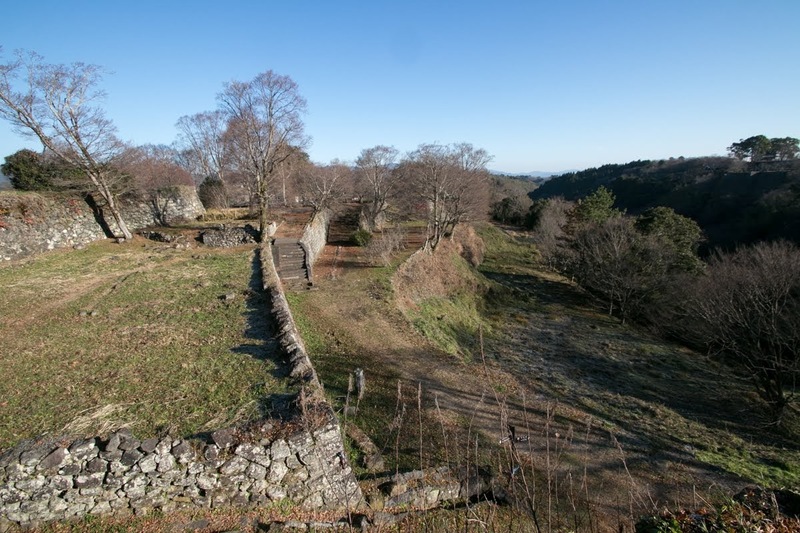 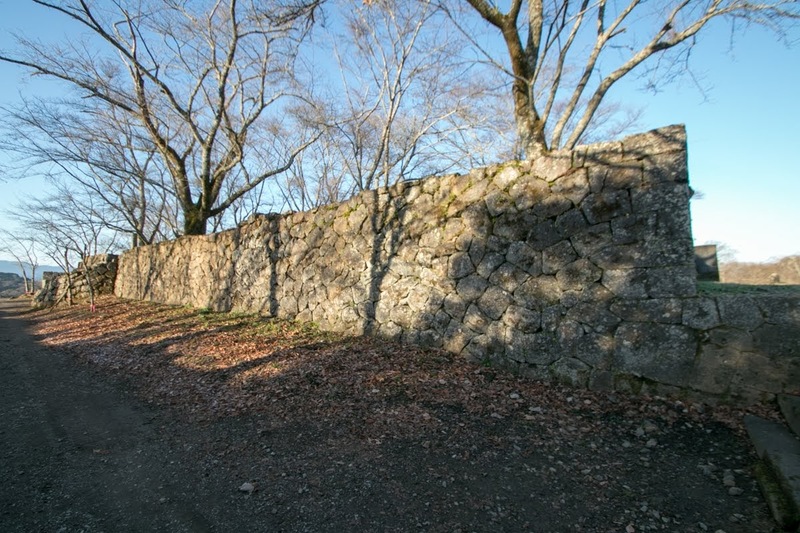 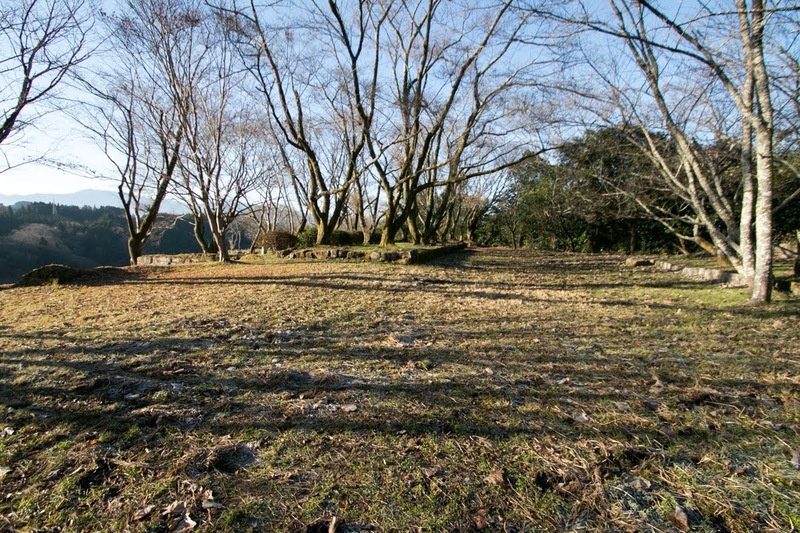 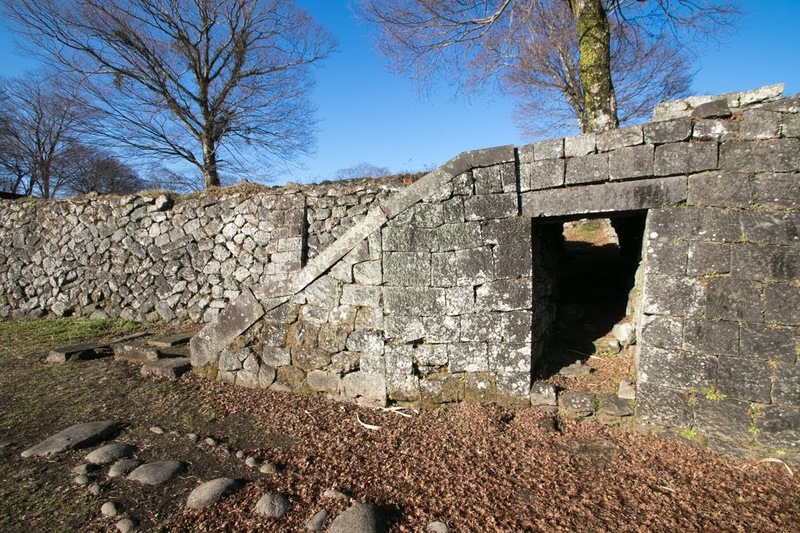 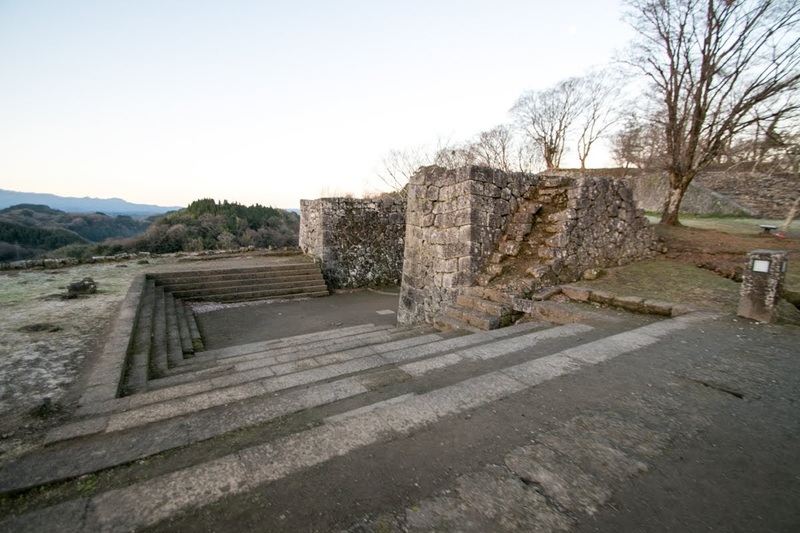 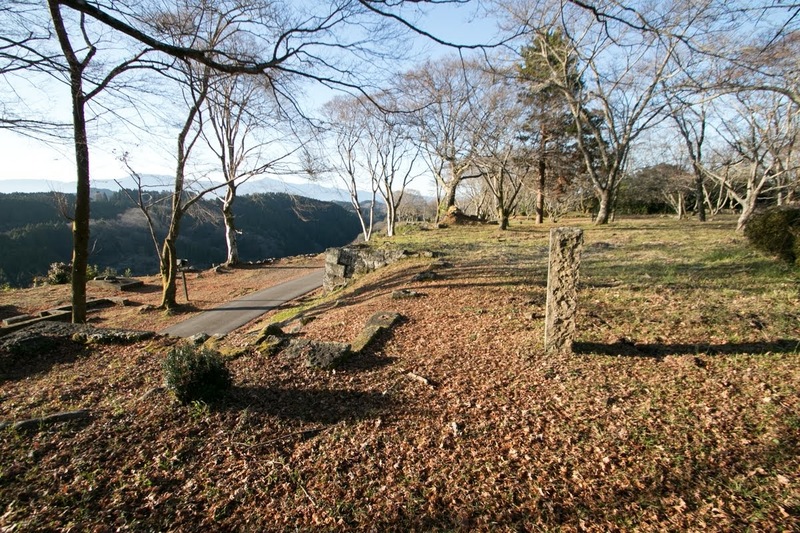 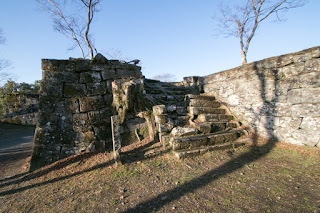 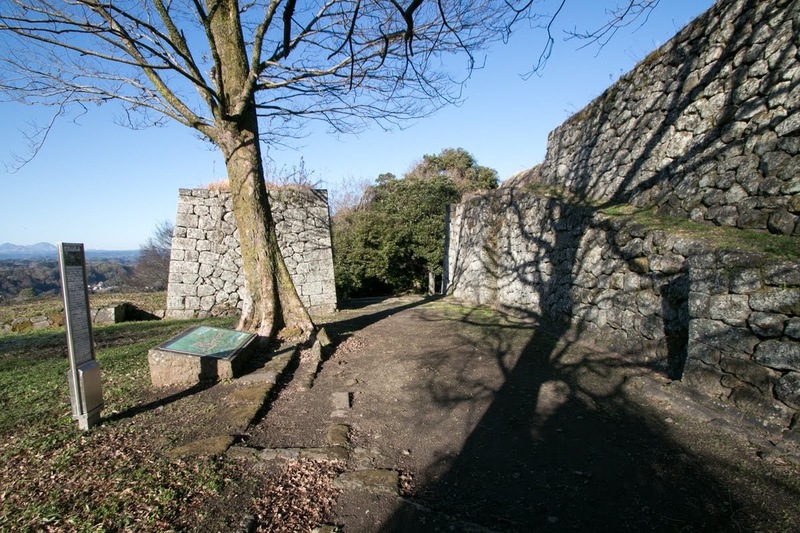 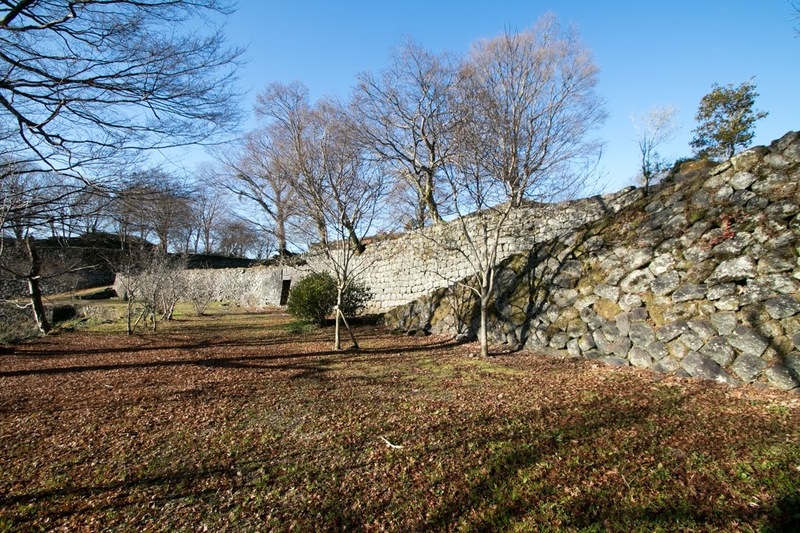 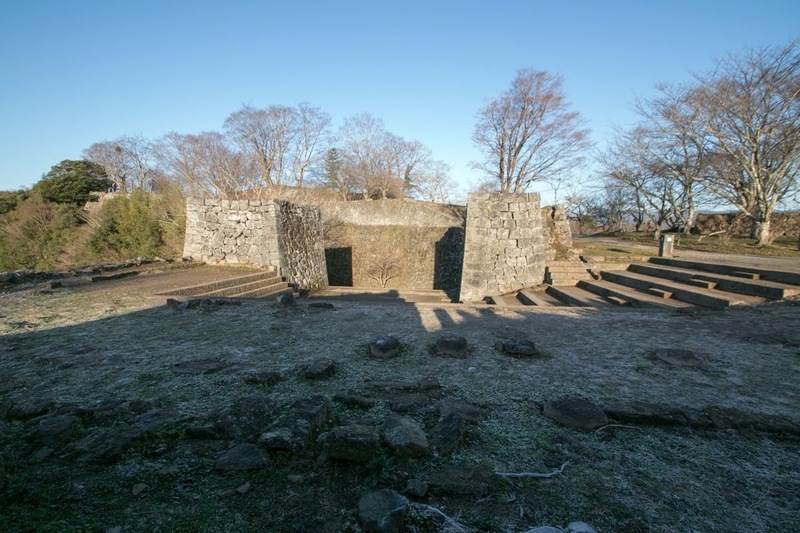 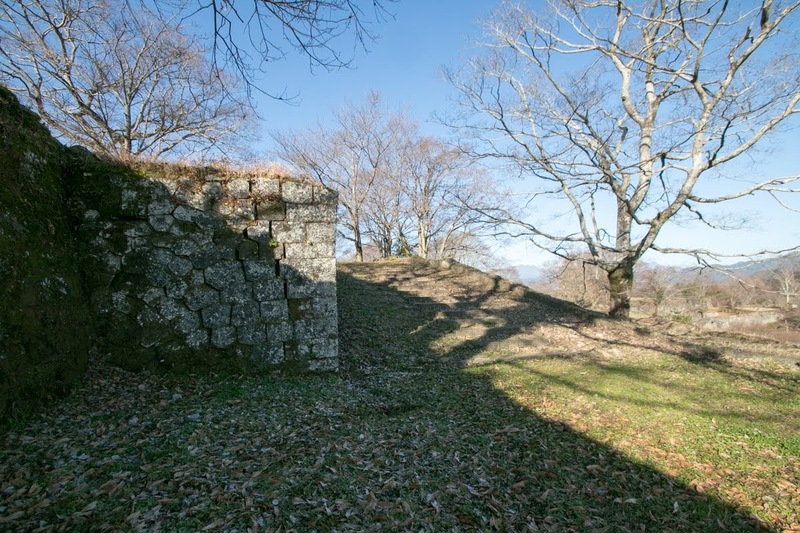 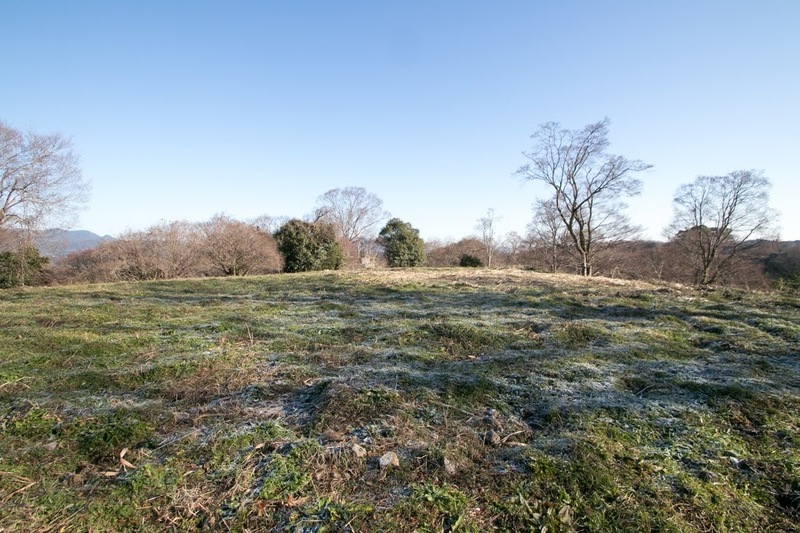 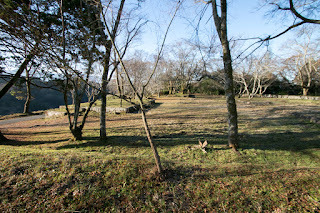 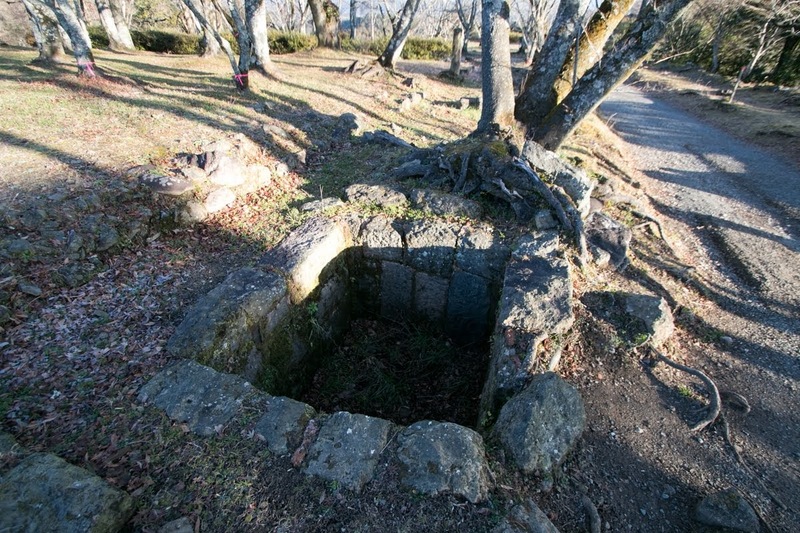 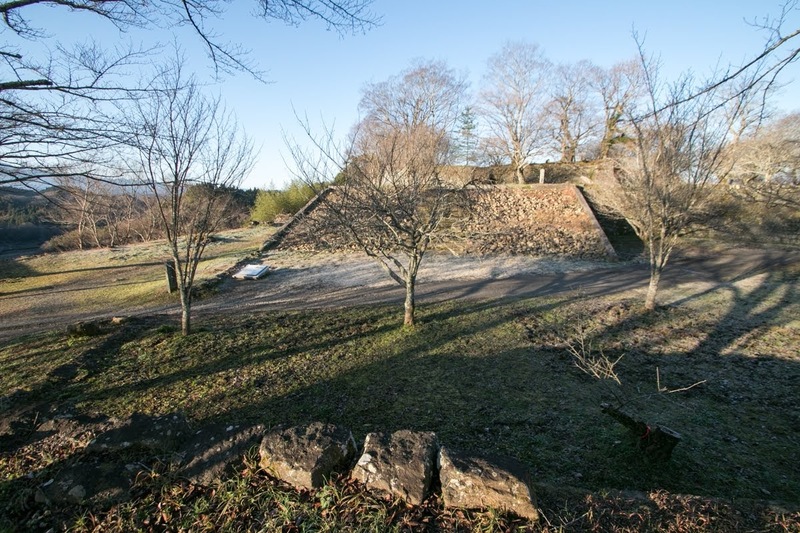 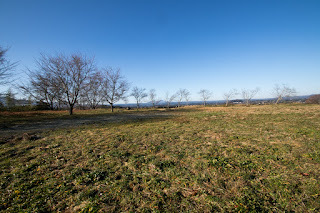 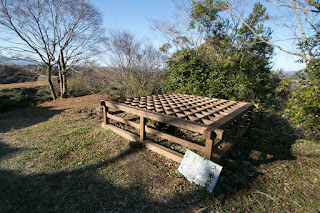 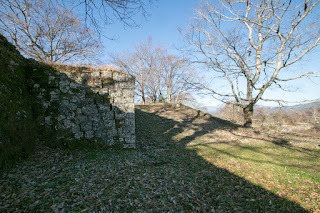 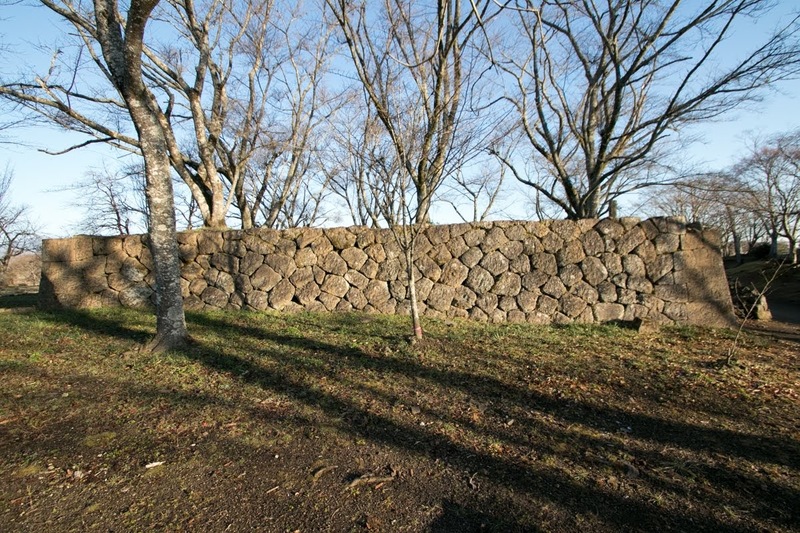 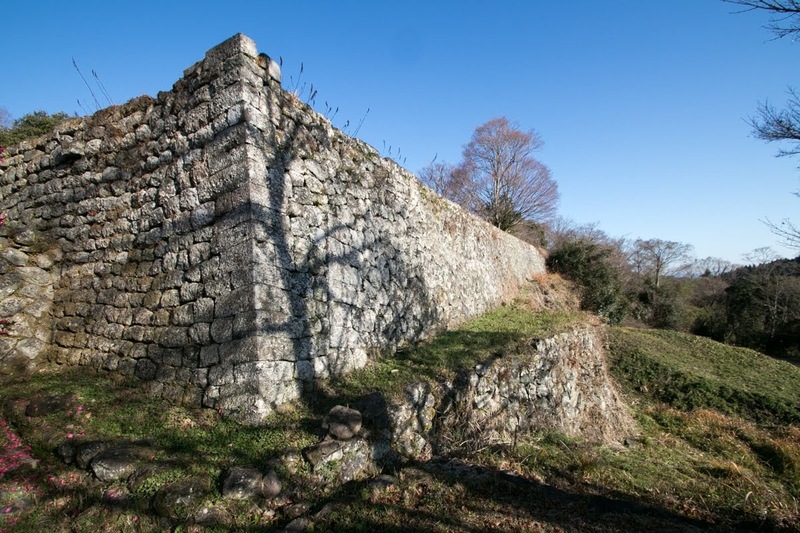 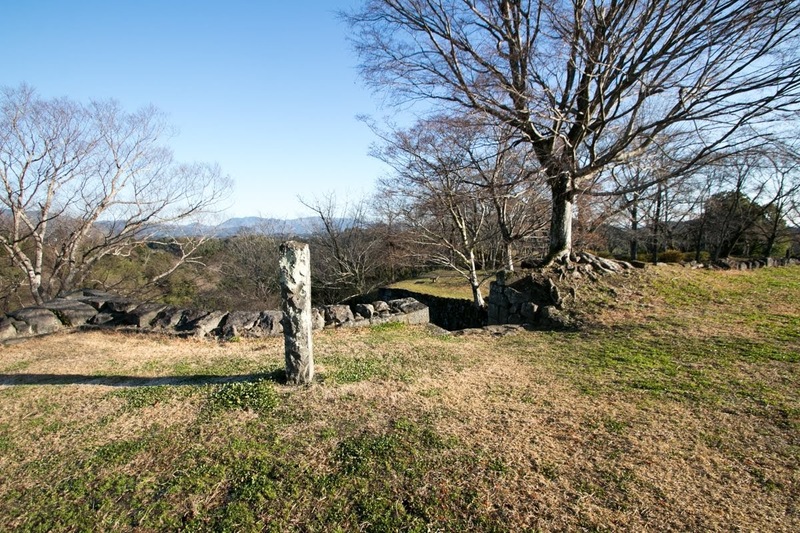 The site of Oka castle is a natural stronghold and an ideal place to build a castle. 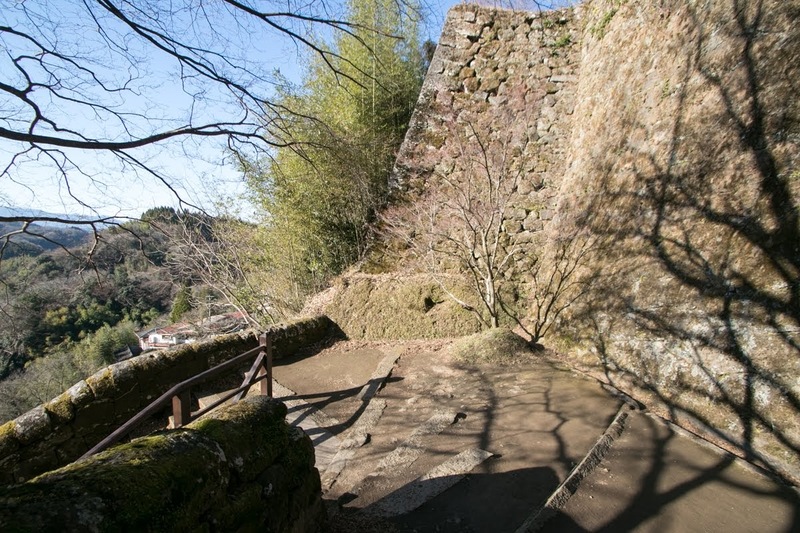 The castle stands on the slope separated by deep valley of Inaba-gawa river and Tamaki-gawa river, tributary of Ono-gawa river merging at the east of the castle. 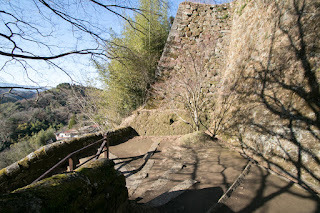 Two rivers flow side by side along the hill, and approaches at the western hillside of the castle like a pincet. 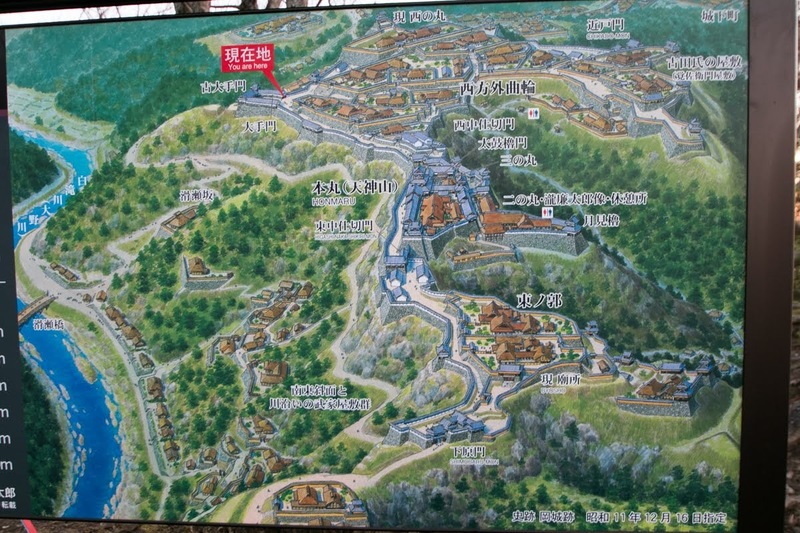 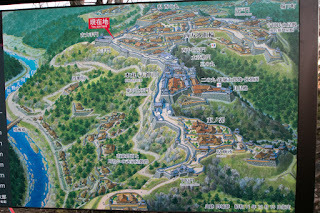 Castle area spread at the narrow east part of the hill, and castle town was built at the wider hillside area at east part and outer barrier was built at the approaching point of two rivers. 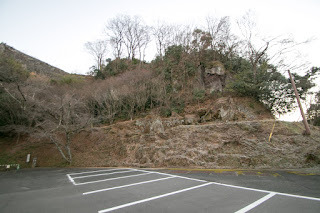 Furthermore, as it is originally flat slope engraved by water, hilltop area is relatively and suitable for dwelling. Precise year is unknown but Oka castle was built by local lord Ogata clan by the end of 12th century.There is a tale that Ogata clan originally built Oka castle to invite Yoshitsune Minamoto (1159-1189), the younger brother of Yoritomo Minamoto (1147-1199) who was the founder of Kamakura Shogunate. 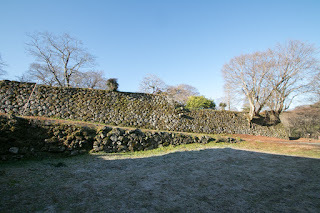 Yoshitsune had a brilliant tactical skill and activated at the battle against Taira clan, but later became discord with Yoritomo and tried to fight against Yoritomo. But Yoshitune failed this attempt and escaped to Ohshu Fujiwara clan at Tohoku region, and Ogata clan was also exiled. 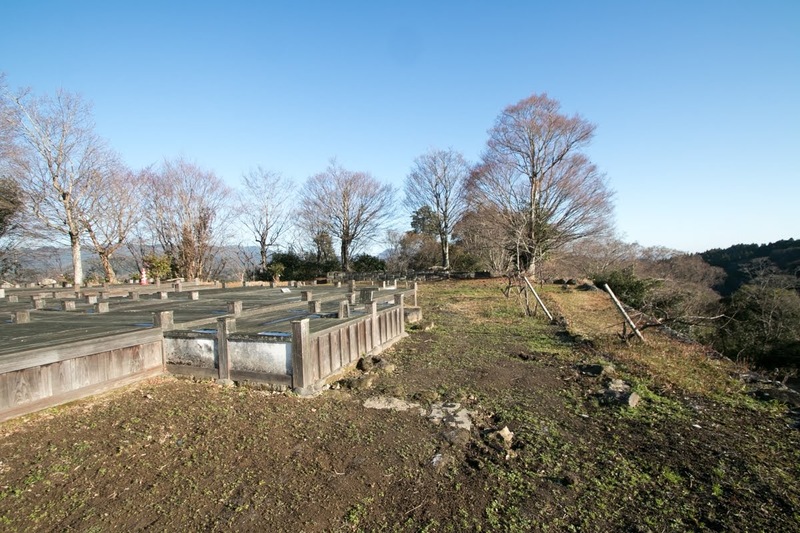 Under Kamakura Shogunate, Otomo clan who was the close retainer of Yoritomo Minamoto was appointed as the governor of Bungo province. Otomo clan activated at the invasion of Chinese Yuan Empire and Koryo Kingdom in 1274 and 1281, and secured their position as a feudal lord. 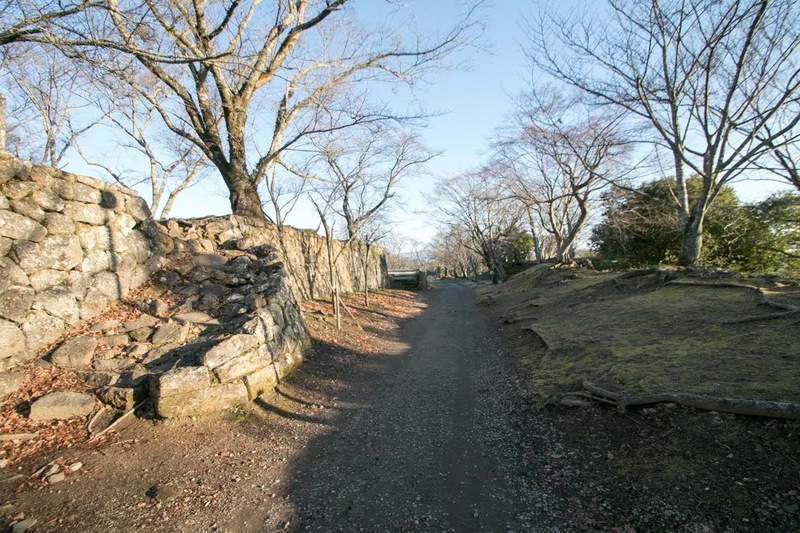 In Muromachi Era, Otomo clan suffered severe internal conflict but overcame it and grew as a warlord since the beginning of 16th century. 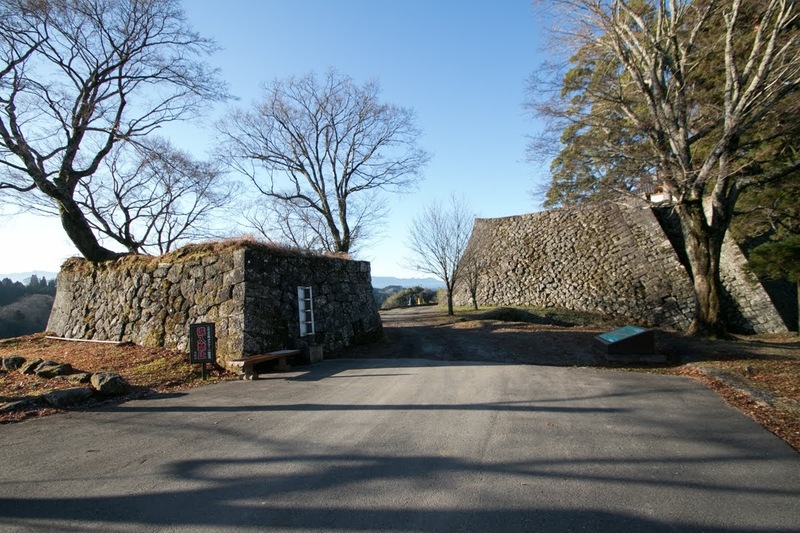 Under Otomo clan, Oka castle was held by Shiga clan which was a branch family of Otomo clan. Shiga clan was one of the three major branch family of Otomo clan along with Takuma clan and Tabara clan, and activated at the battle against Kikuchi clan which held Higo province (Kumamoto prefecture) then held the inner part of the province at the border to Higo province. In the middle of 16th century, Otomo clan became its peak period under Yoshishige Otomo (1530-1587, famous as his Buddhist name Sorin). Otomo clan directly or indirectly controlled north half of Kyushu province, and rejected Ouchi clan or Mouri clan which were the lords of Honshu mainland from prosperous Hakata port. Shiga clan became the Kabanshu, the signing retainers of Otomo clan, and Oka castle was strengthened as a base toward westward. But in 1578, Yoshishige sent a large army to save Ito clan which was the governor of Hyuga province (Miyazaki prefecture) but lost their territory before the invasion of Shimazu clan, a rising warlord of Satsuma province (Kagoshima prefecture). 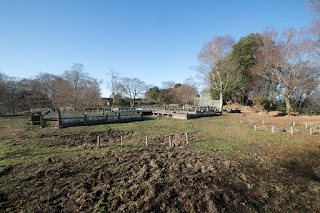 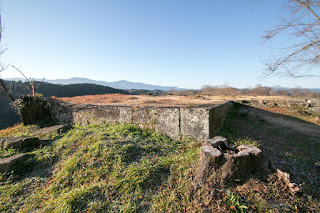 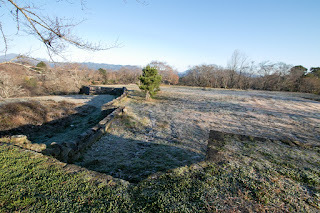 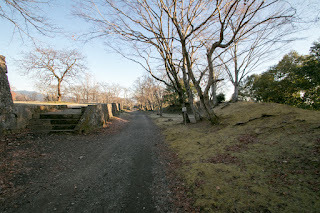 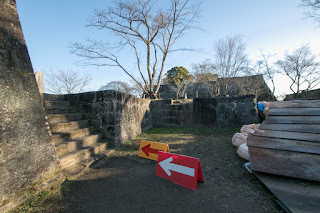 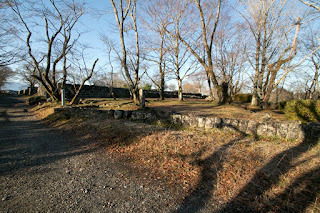 Both army fought near Takajo castle at the side of Omaru-gawa river in the middle part of province. Otomo army suffered fatal defeat by ambush tactics of Shimazu army called as Tsurinobuse at this battle of Mimikawa. Local lords followed to Otomo clan such as Ryuzoji clan or Akizuki clan left Otomo clan all at once, and Otomo clan suddenly fell in tough situation. In 1586, Shimazu clan which already beat Ryuzoji clan at the battle of Okitanawate started total attack against Otomo clan. 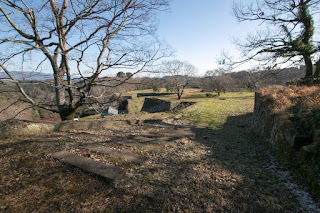 Before detached army of Shimazu army lead by Iehisa Shimazu (1547-1587), Otomo clan lost its main base Funai city (current Oita city), and Sorin barely besieged at Funai castle surrounded by dominant Shimazu army. 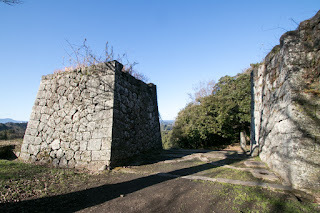 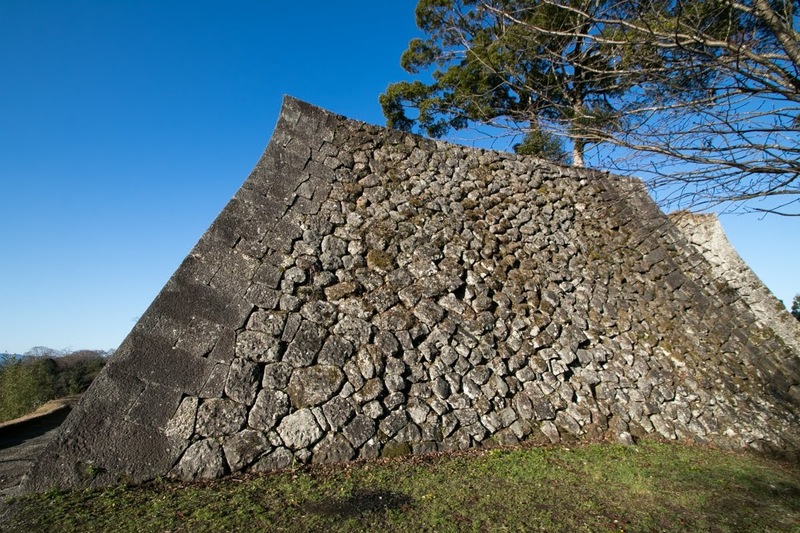 Otomo clan lost many castles and only kept several mountain castles such as Tsunomure castle or Kitsuki castle. 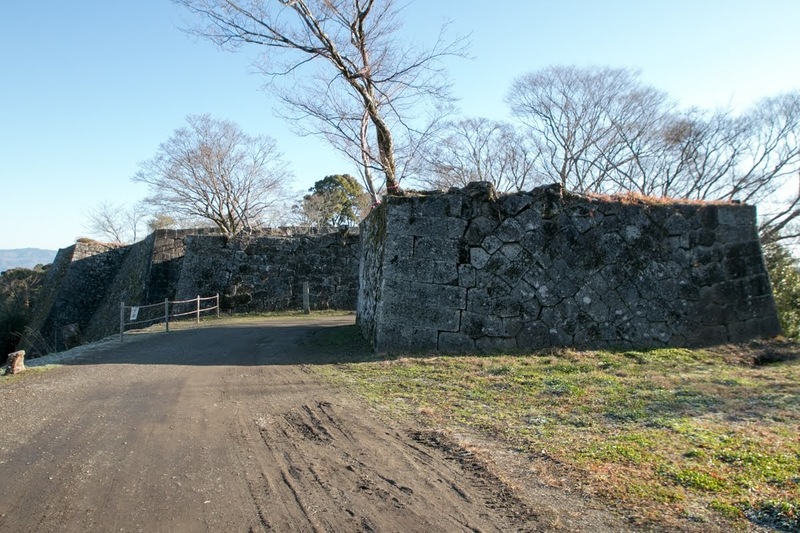 A main force of Shimazu clan lead by Yoshihiro Shimazu (1535-1619), one of the strongest general in Sengoku era and feared as “Demon Shimazu”, also marched toward Oka castle from Higo province in October 1585. 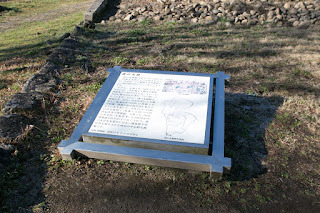 Shimazu army entered Bungo province under the guide of Chikazane Irita (1533-1601) who turned to Shimazu clan, and Chikanori Shiga (1535-1587), the ex-leader of Shiga clan, also changed to Shimazu side. 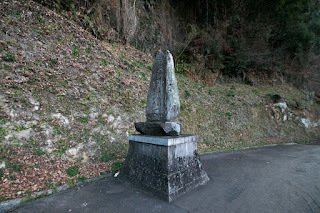 But Chikatsugu Shiga (1566-? 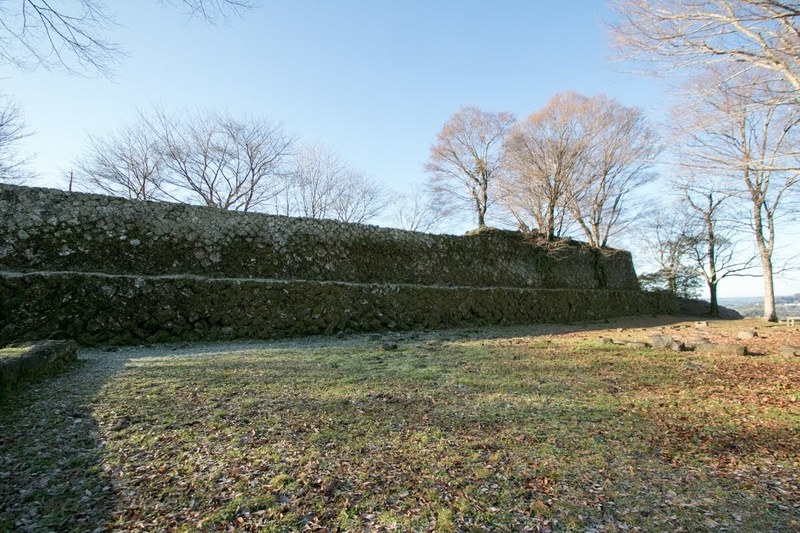 ), the young leader of Shiga clan, decided to resist against overwhelming Shimazu army of 30,000 soldiers at Oka castle with his army of 2,000 soldiers. 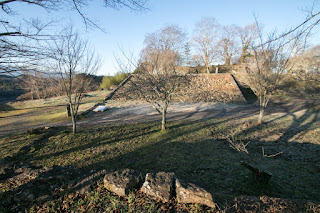 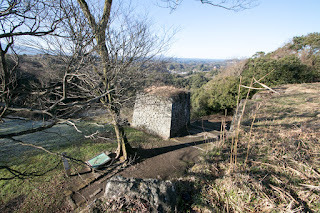 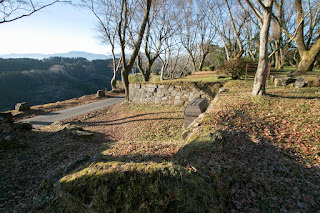 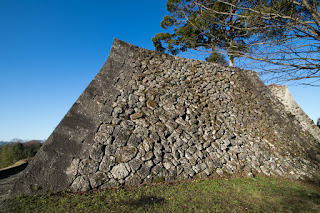 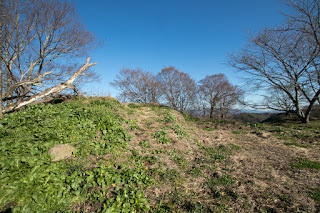 Although several branch castle fell before the attack of Shimazu army, Chikatsugu firmly kept Oka castle. Furtuermore, Chikatsugu and his force made various guerrilla battles against Shimazu army. When Shimazu army attacked the main gate of Oka castle, Chikatsugu hided matchlock gunner at the backside, and ambushed the vanguard of Shimazu army fell into trap. 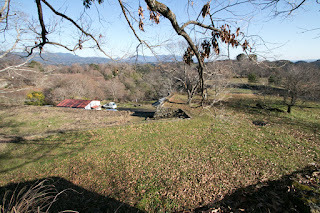 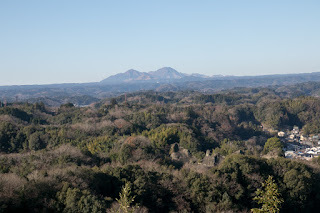 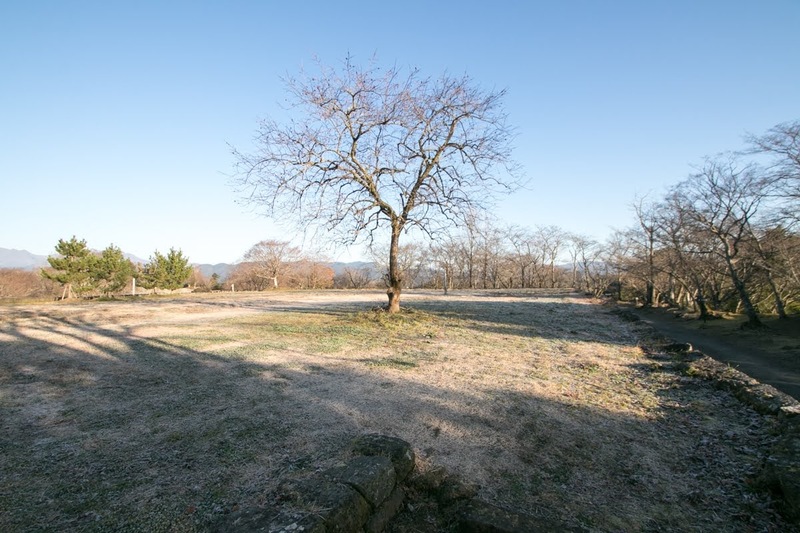 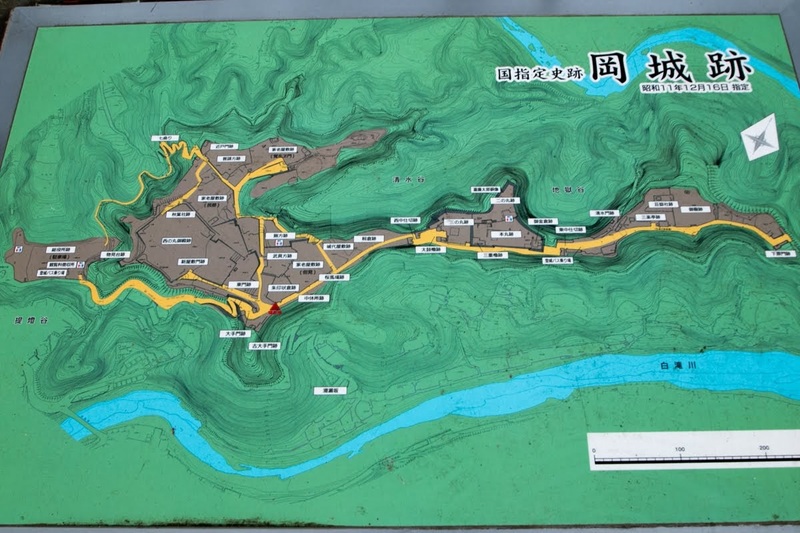 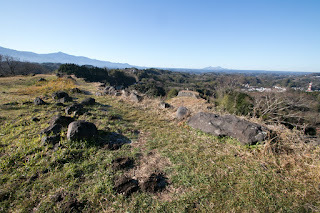 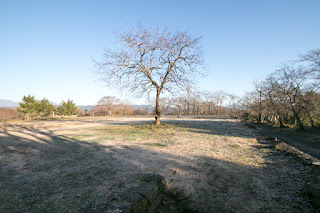 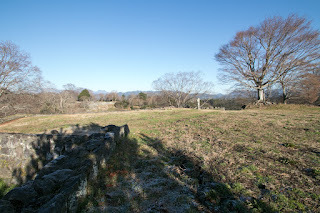 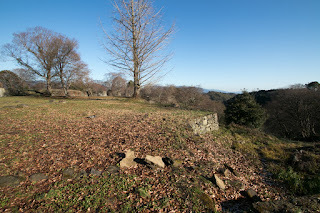 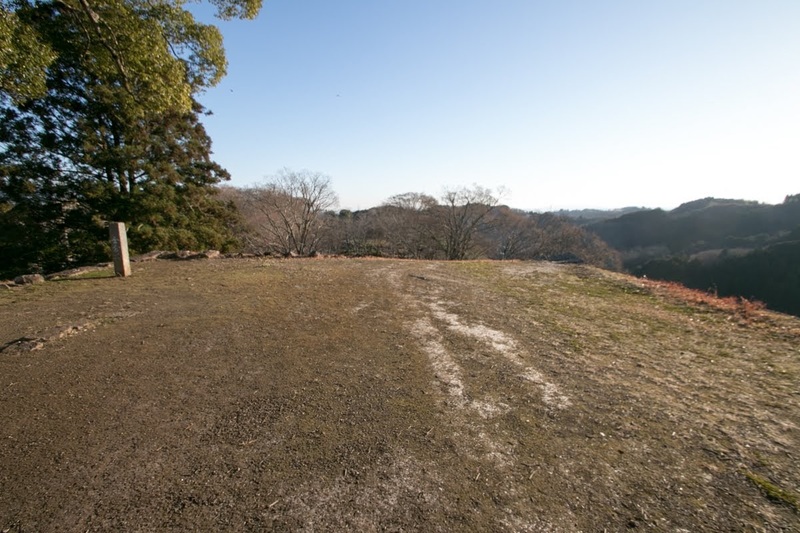 Looking at this, Shimazu army avoided direct attack to Oka castle and surrounded branch castles of Oka castle. 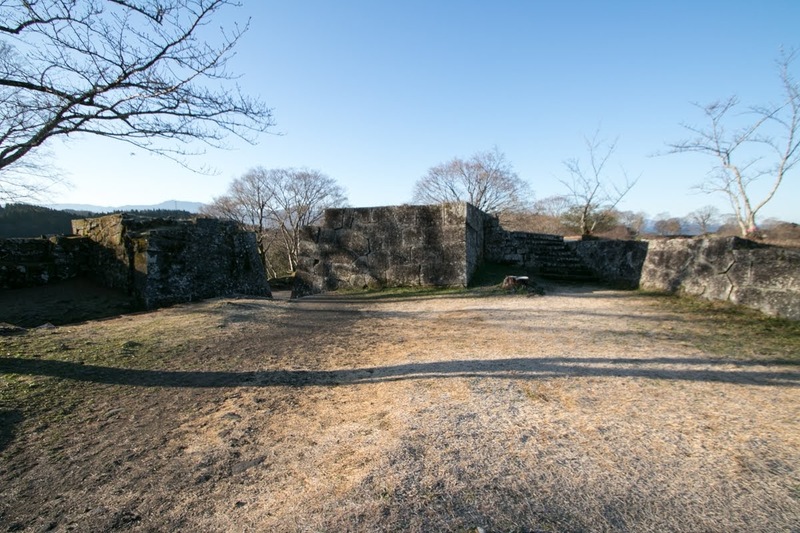 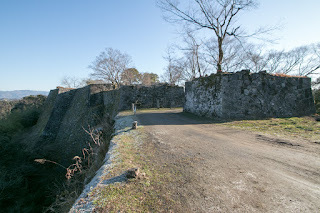 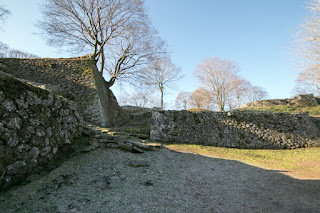 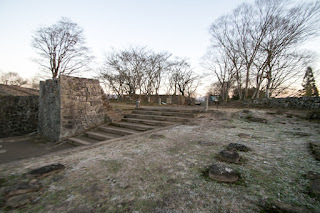 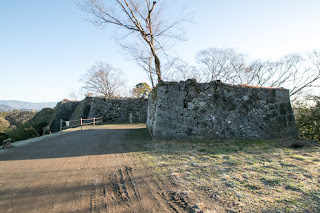 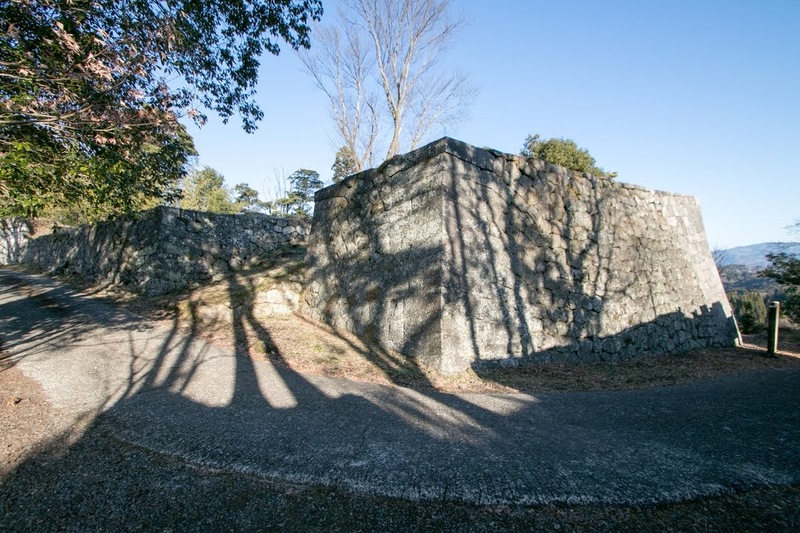 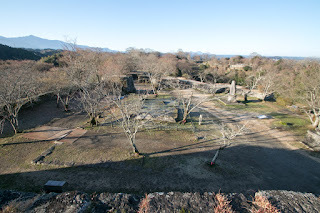 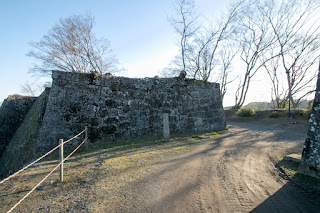 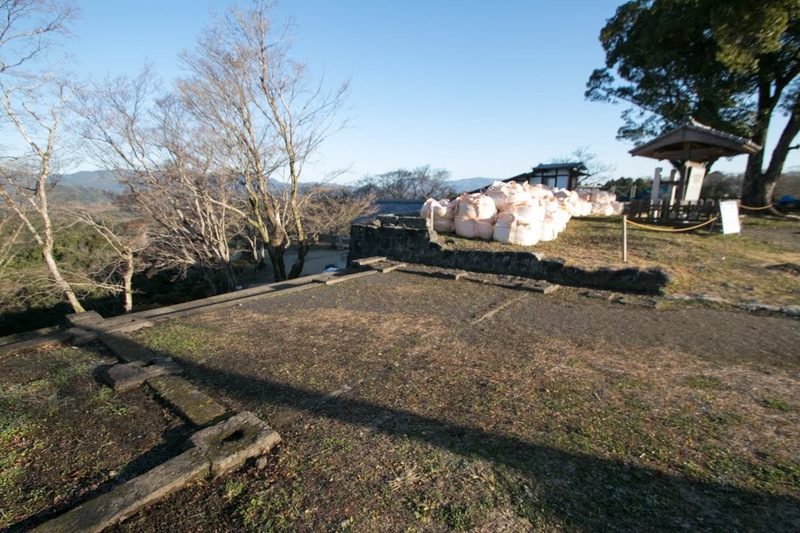 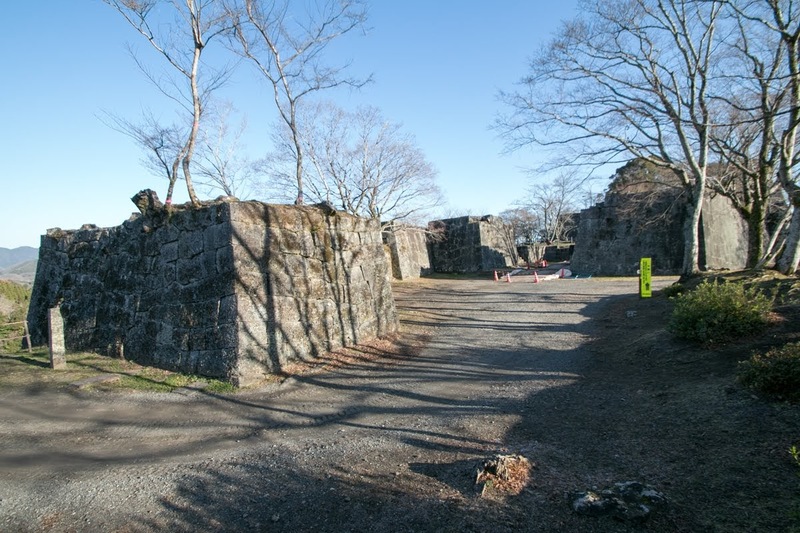 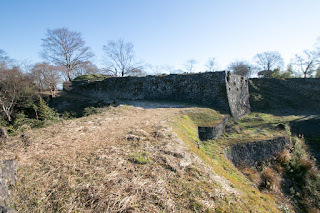 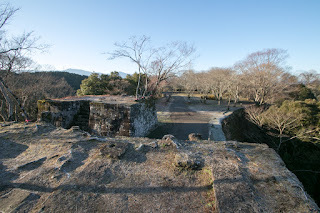 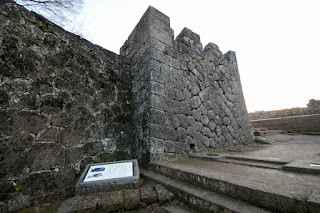 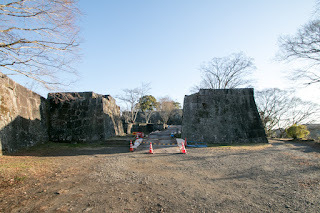 But at Danohara castle Shiga army intentionally burnt buildings and left, then attacked Shimazu army entered the castle but had to stay with no shelter and broke it. 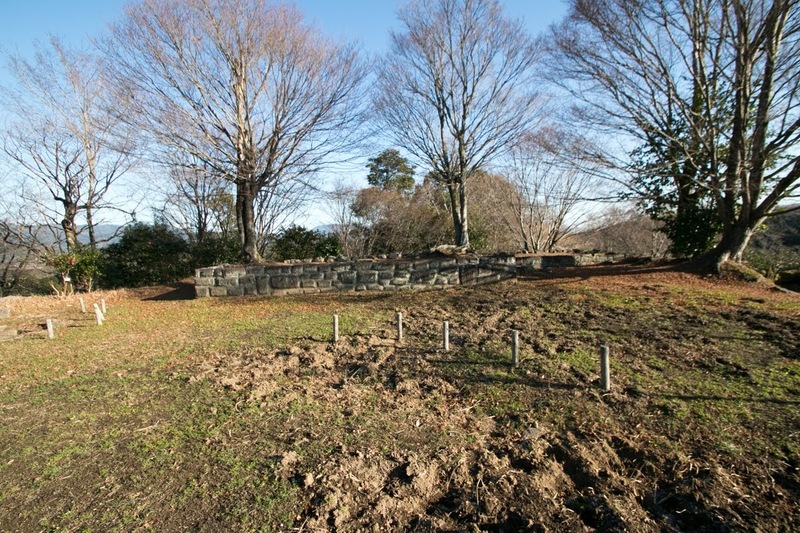 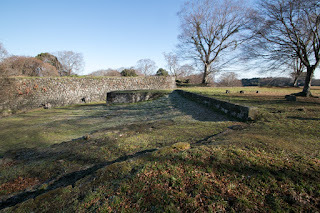 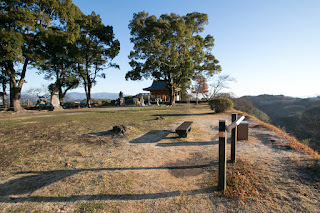 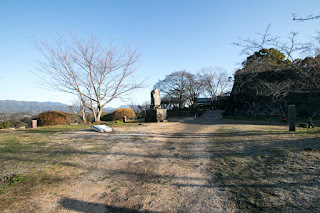 Beside, at Shinoharame castle, the commander of Shiga army made fake surrender to Shimazu army then protected its gate, then opened the gate at the arrival of Shiga army and destroyed Shimazu army. 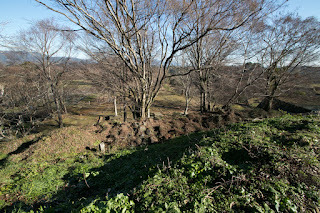 As Shiga army stayed at the backside and attacked supply troops, Shimazu army could not move forward into the province. 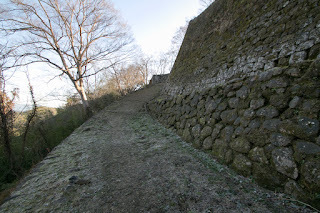 Furthermore, knowing the approach of overwhelming army of central ruler Hideyoshi Toyotomi (1537-1598), Shimazu army had to fall Oka castle as soon as possible. 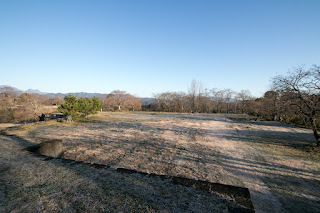 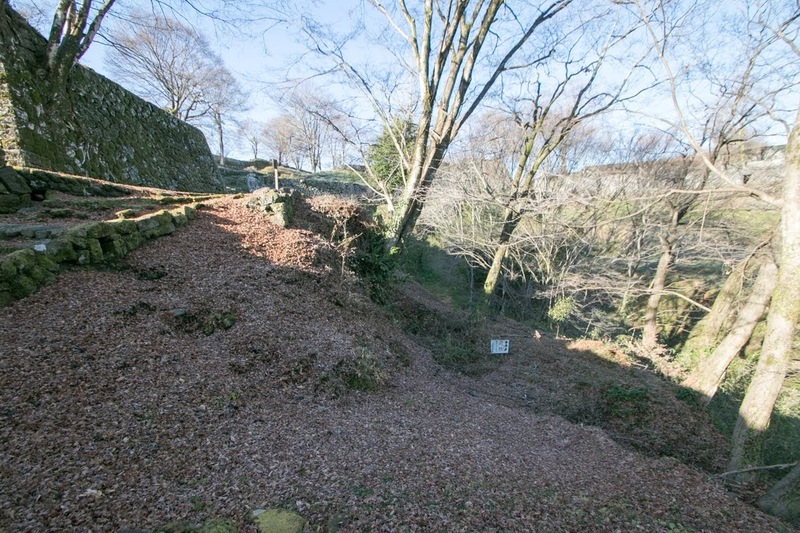 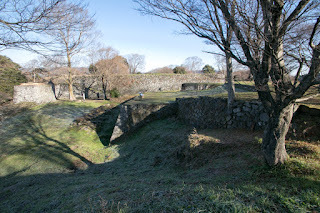 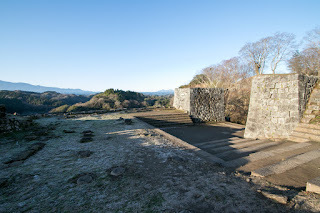 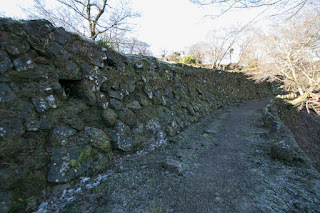 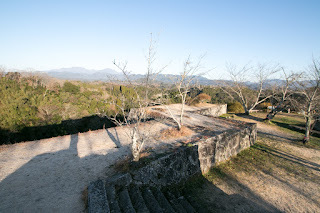 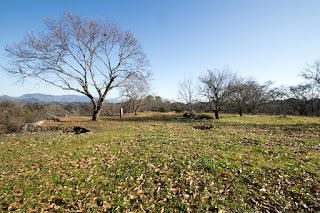 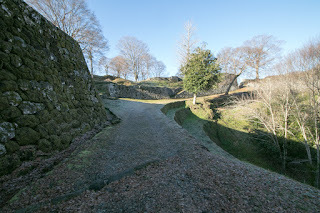 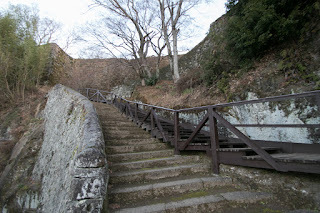 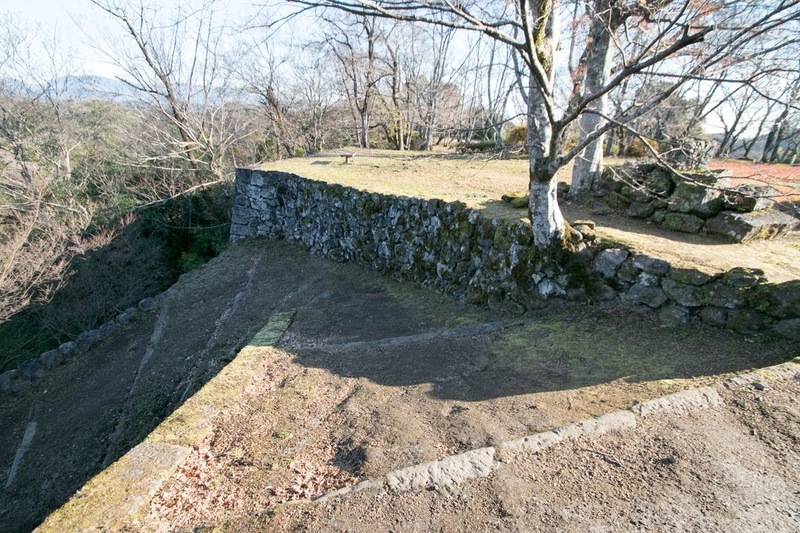 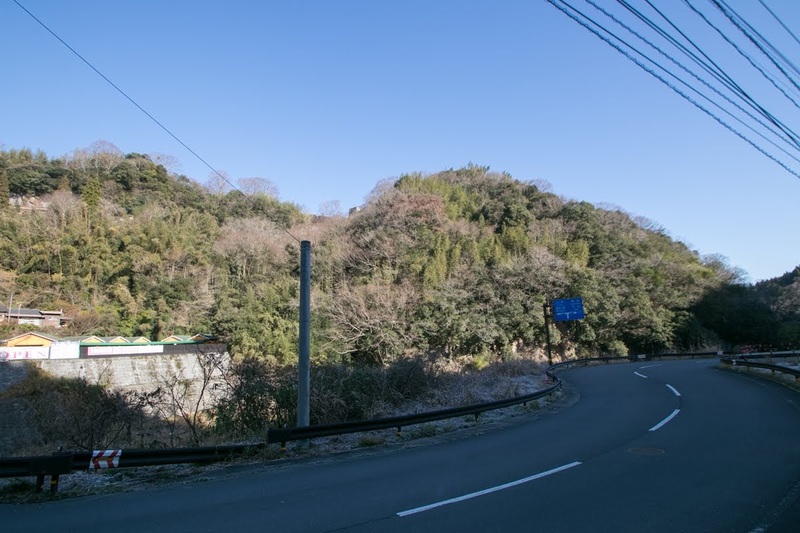 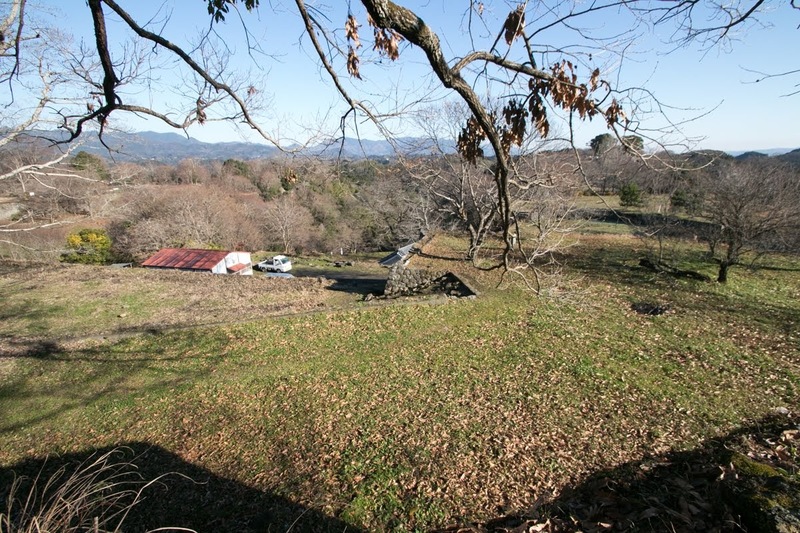 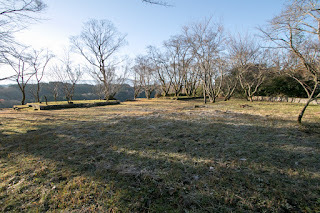 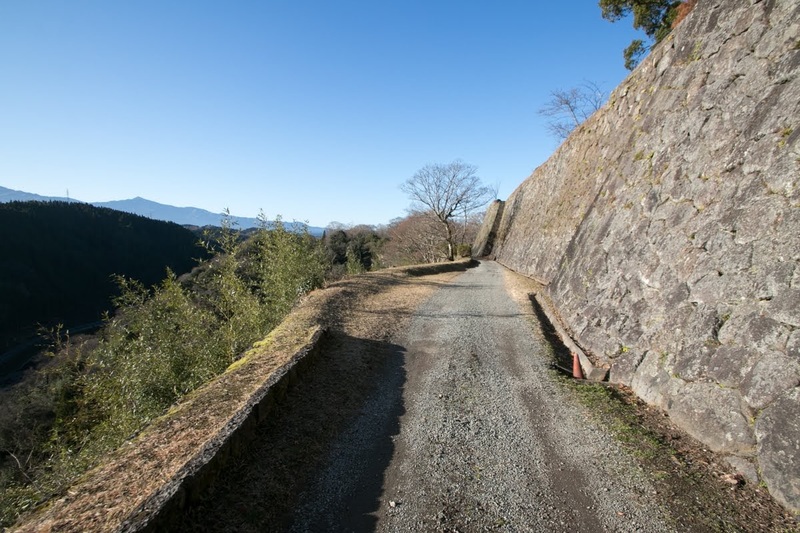 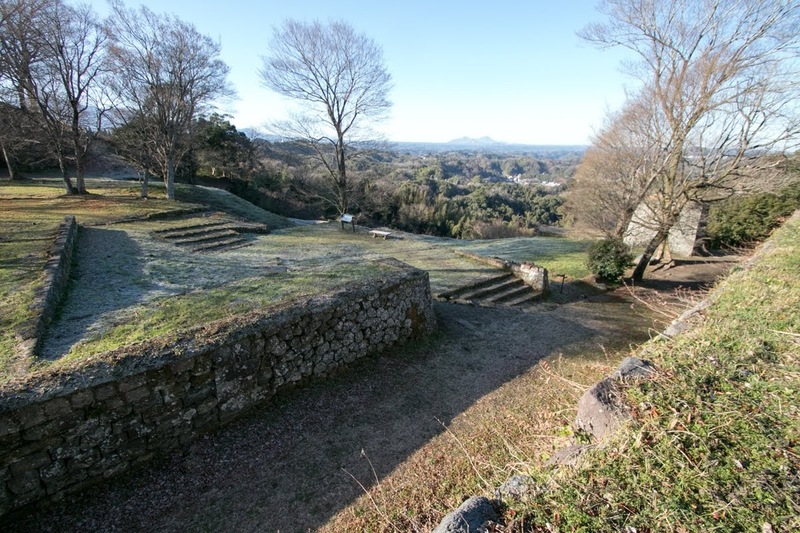 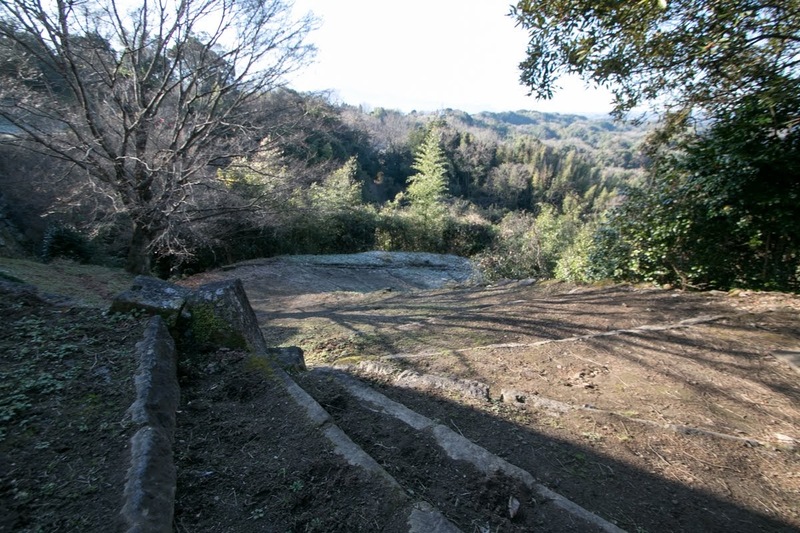 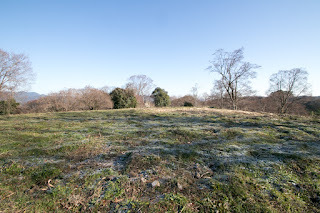 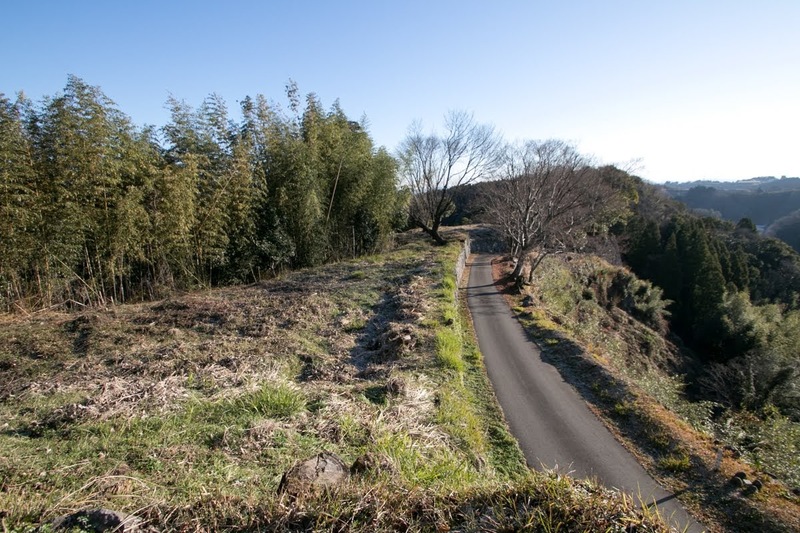 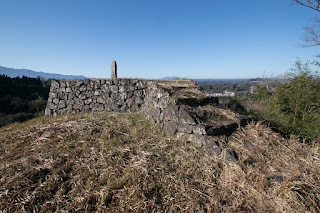 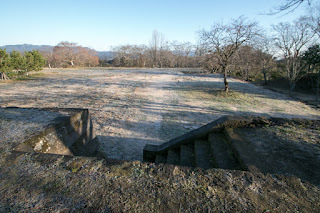 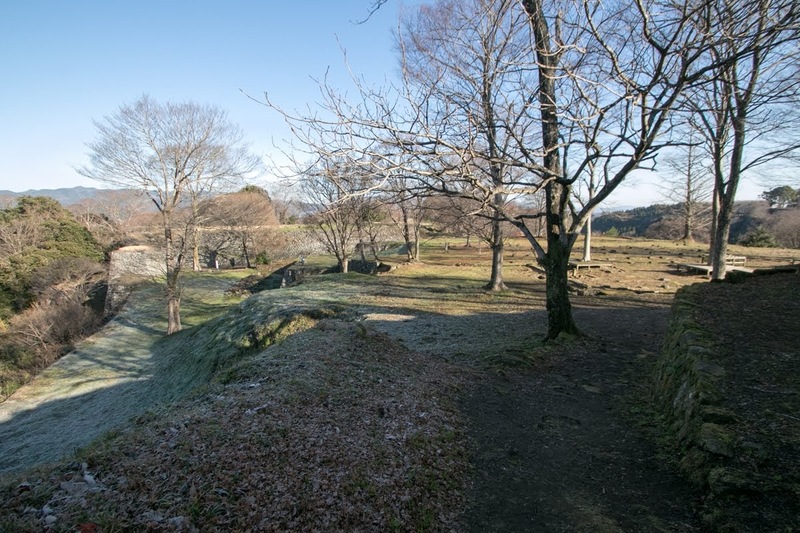 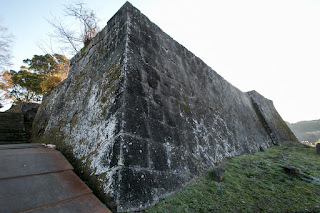 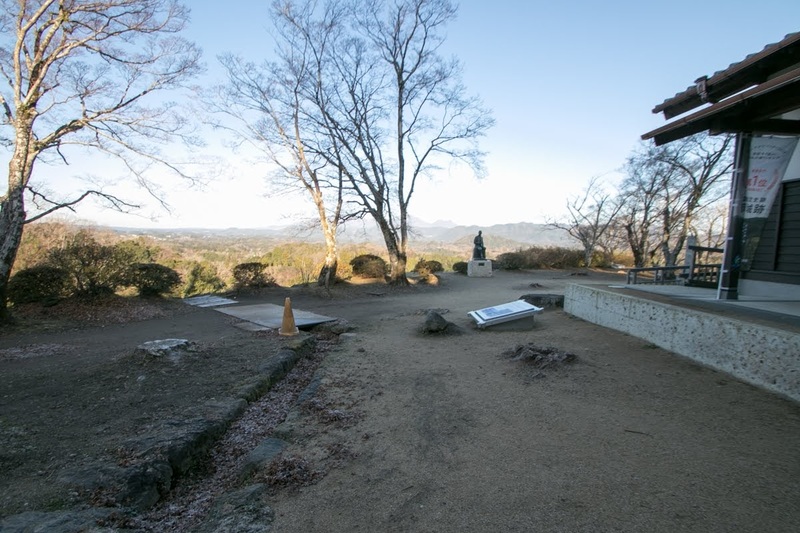 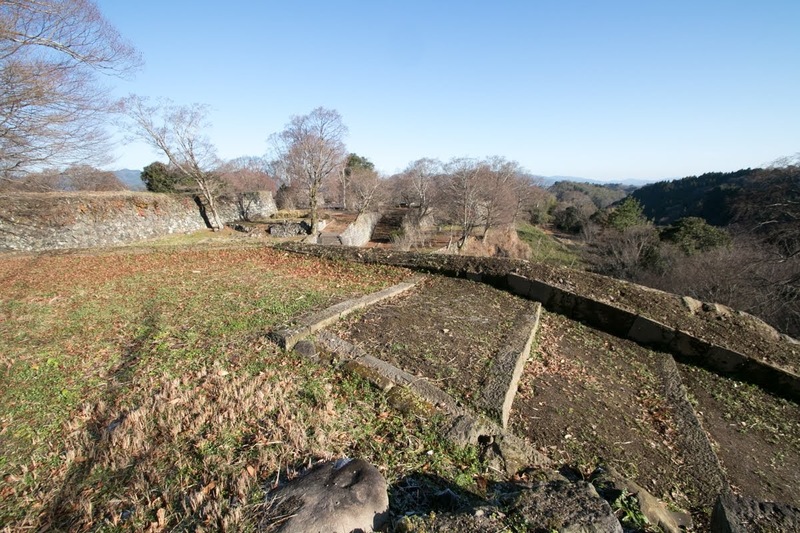 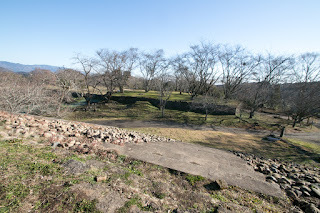 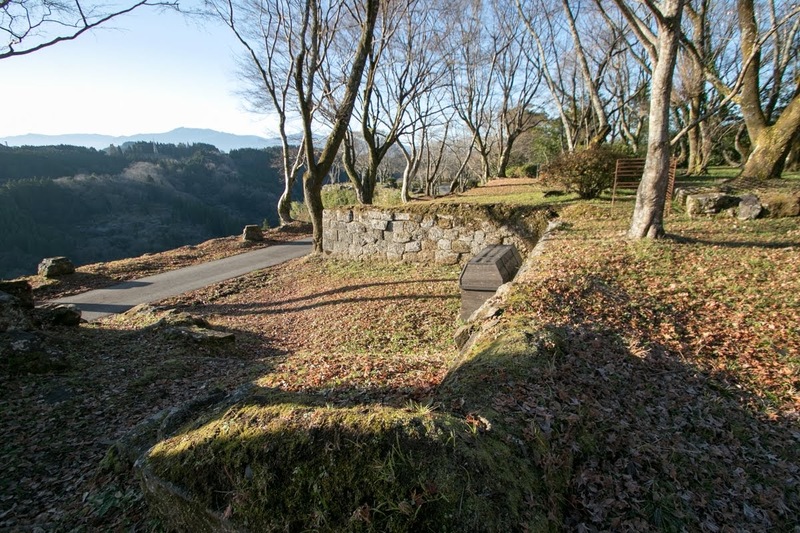 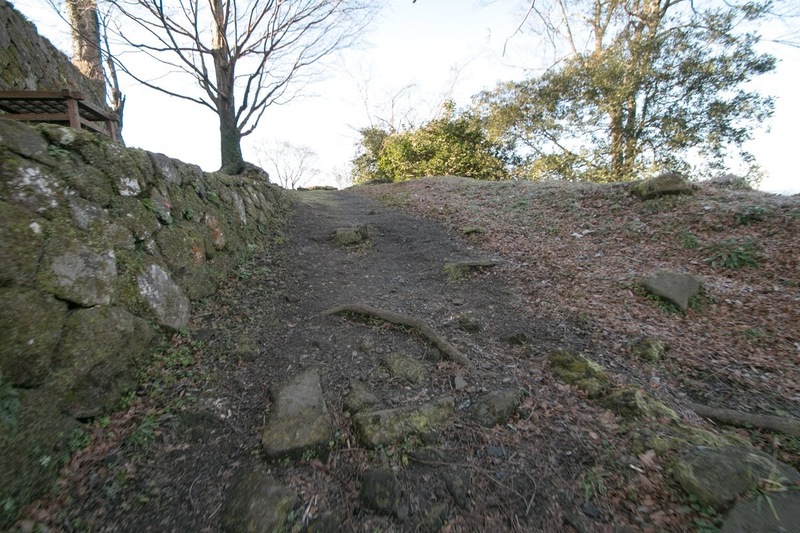 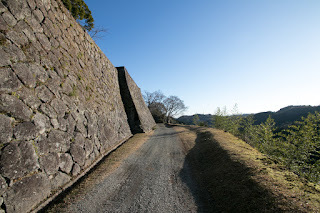 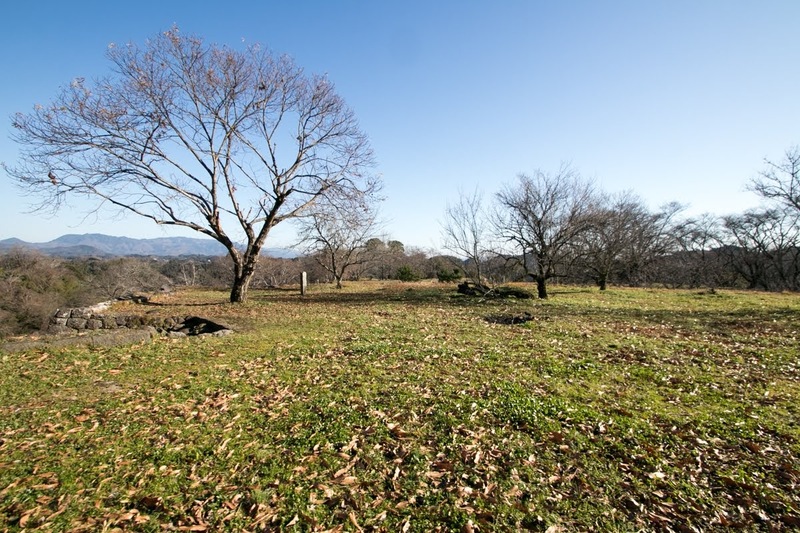 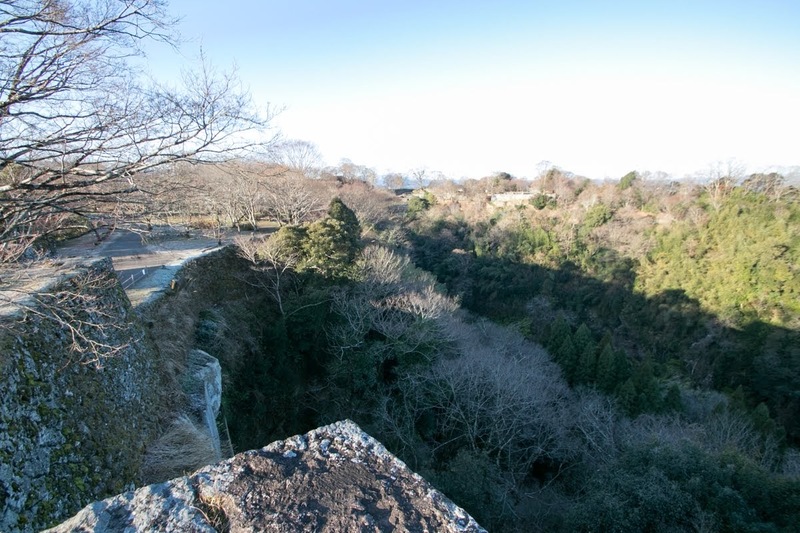 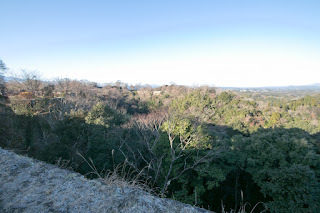 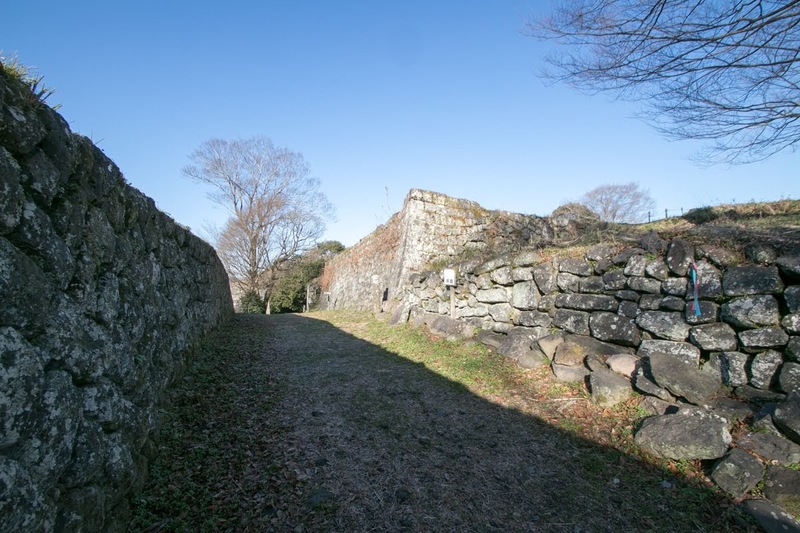 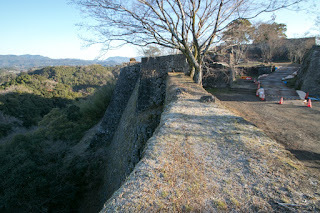 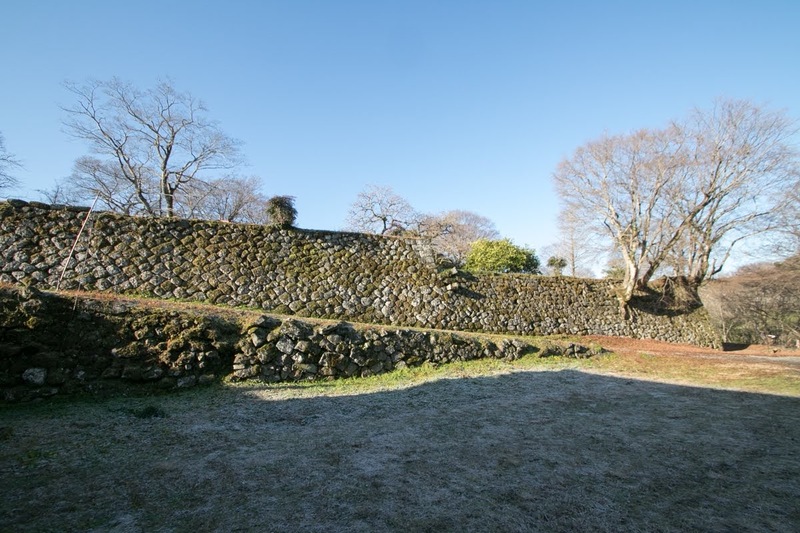 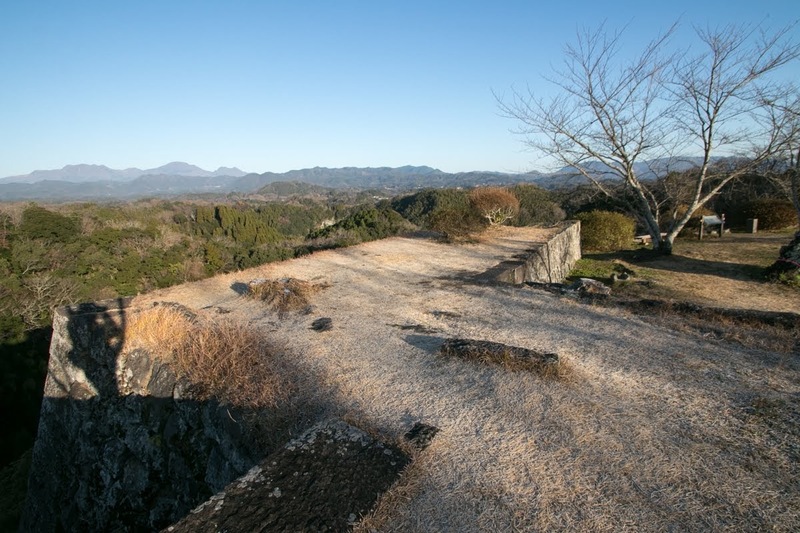 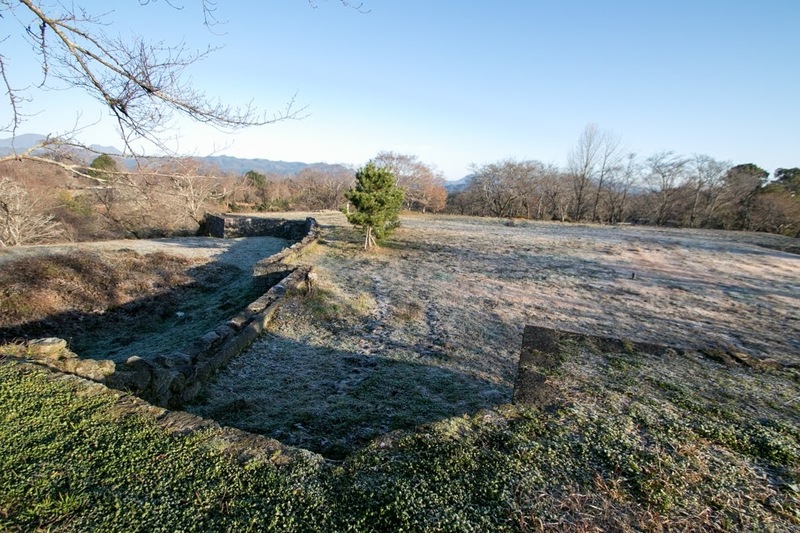 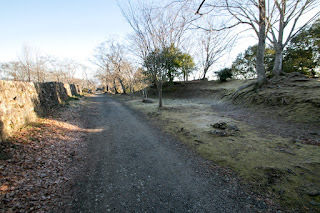 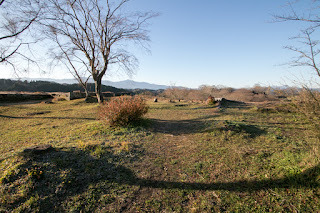 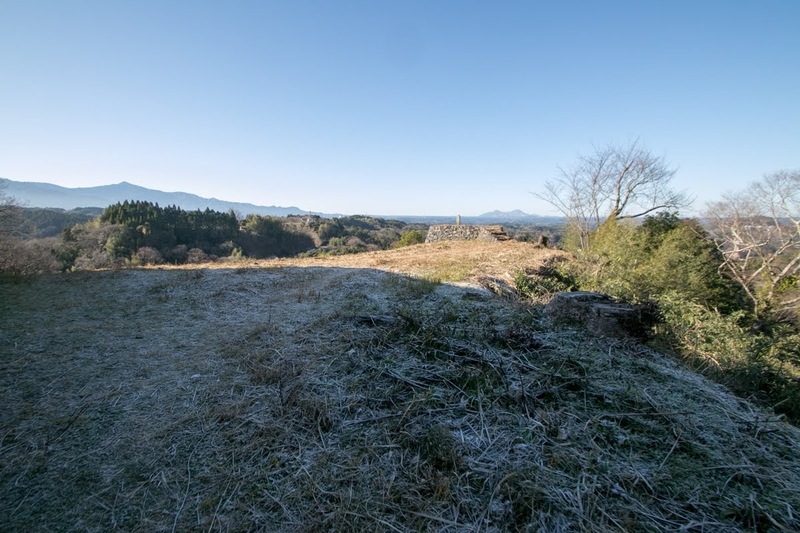 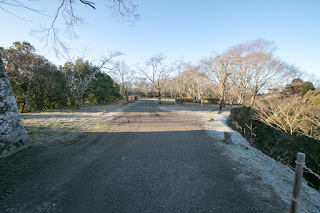 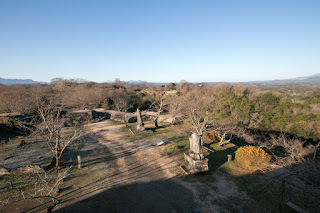 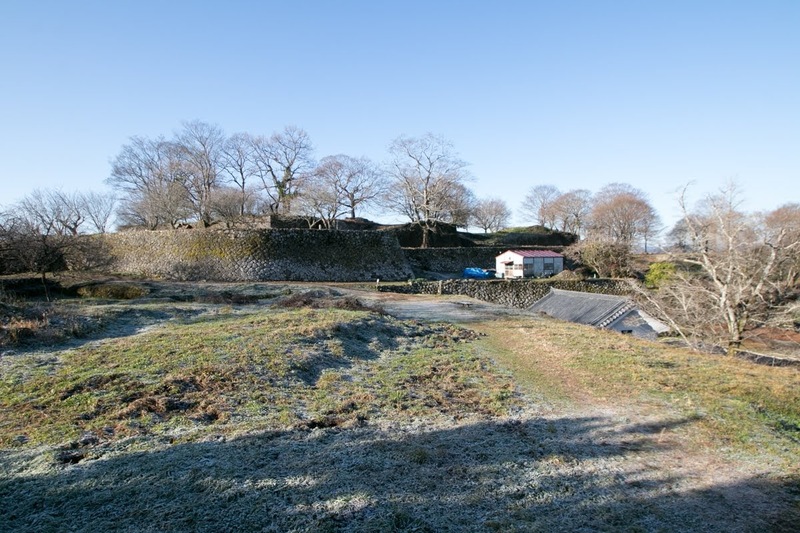 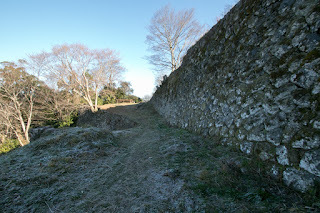 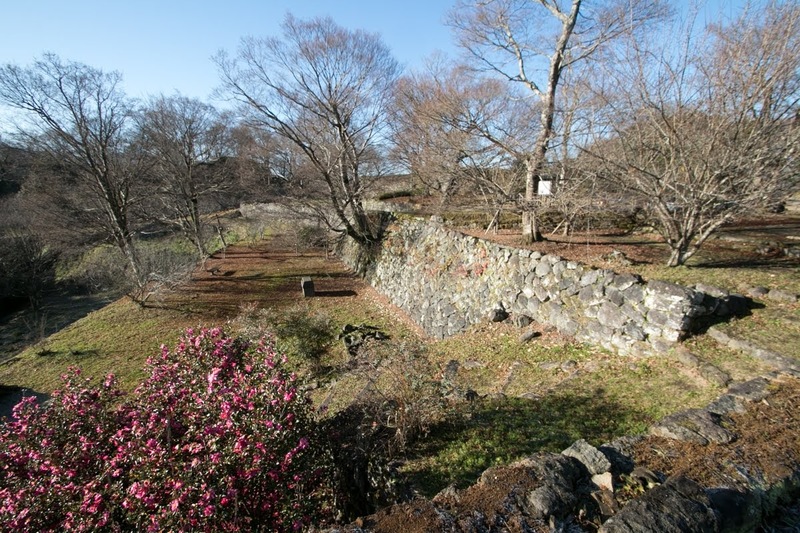 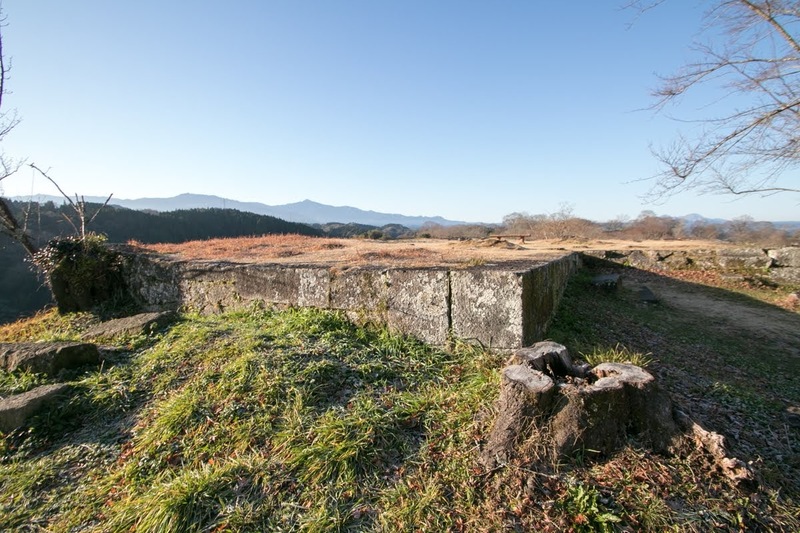 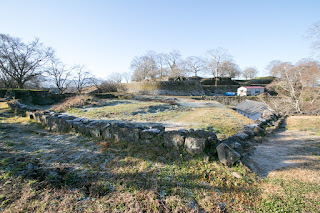 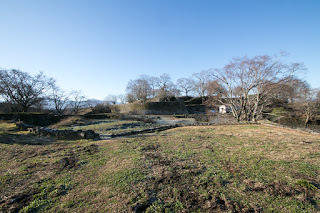 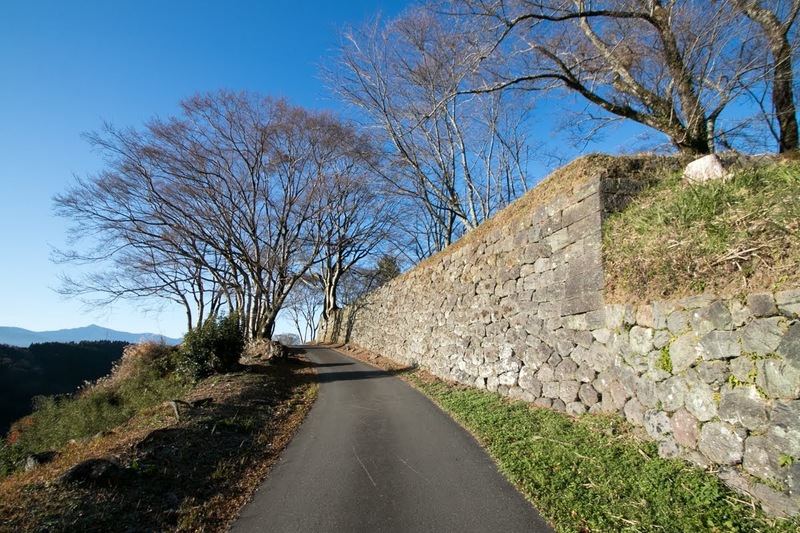 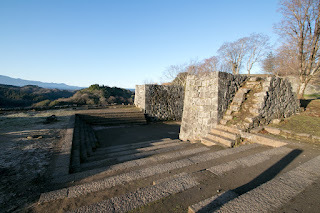 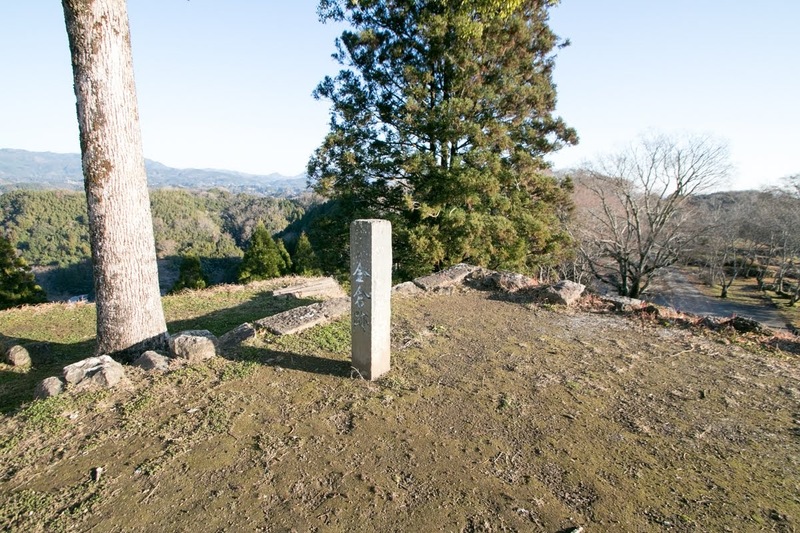 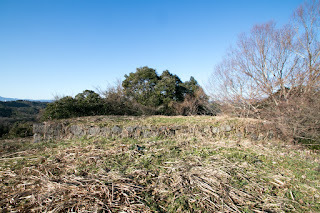 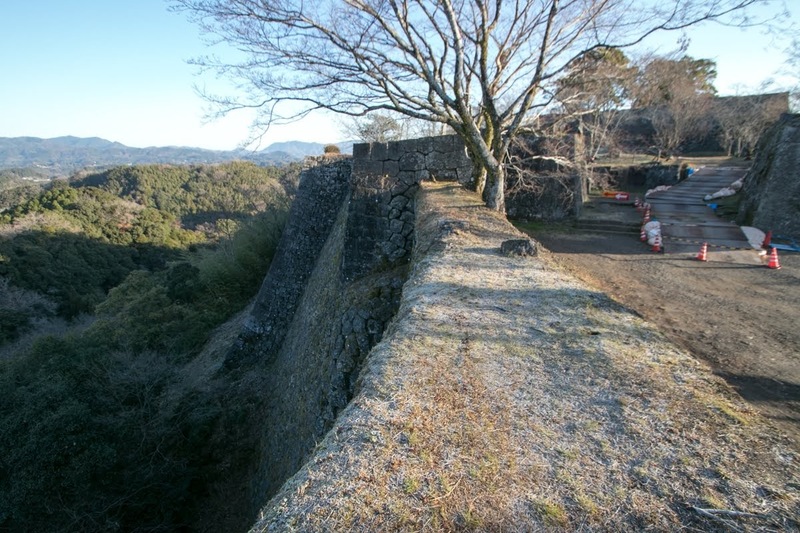 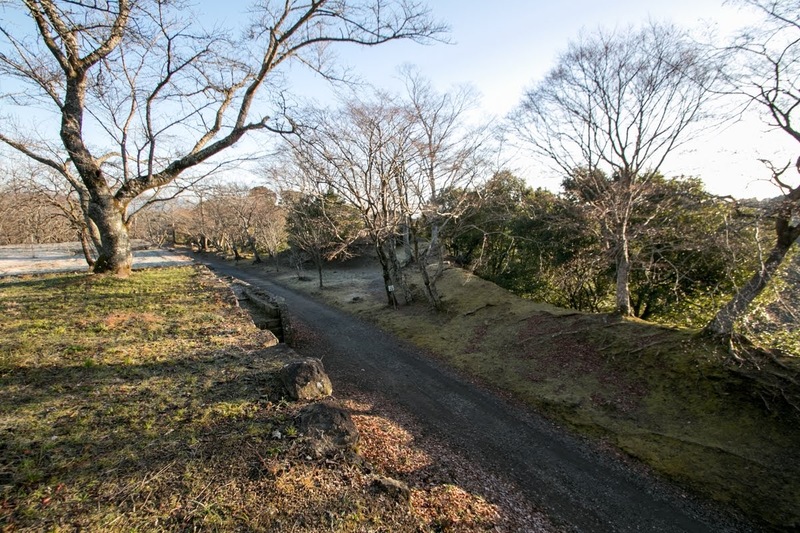 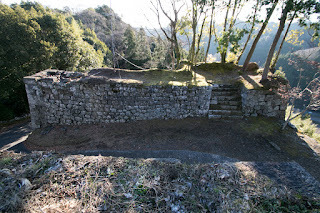 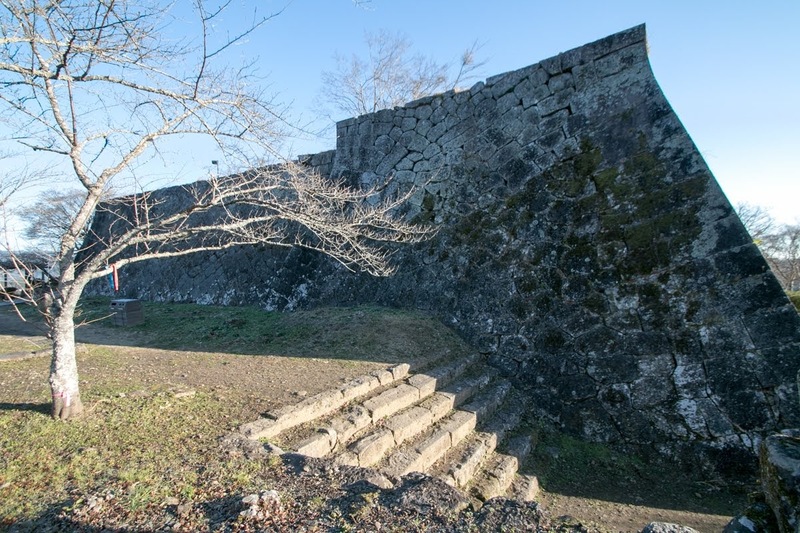 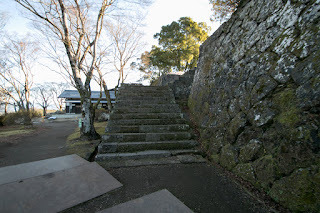 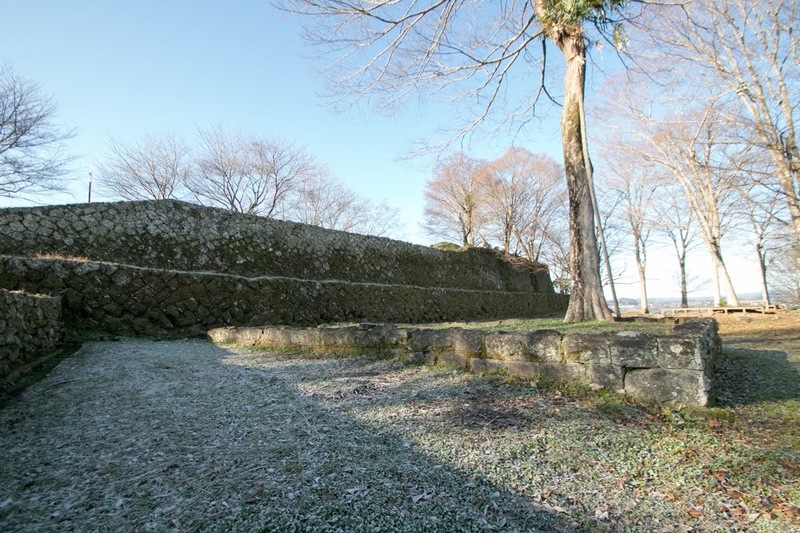 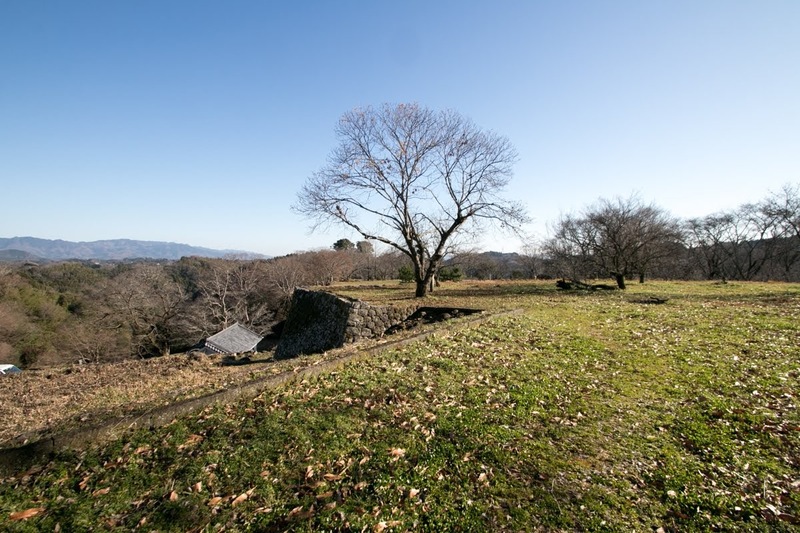 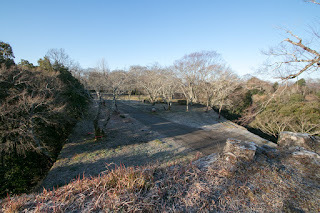 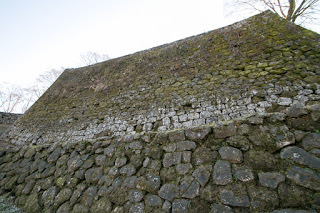 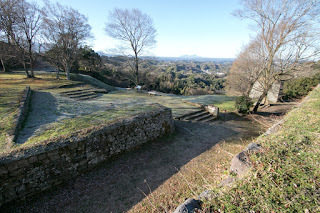 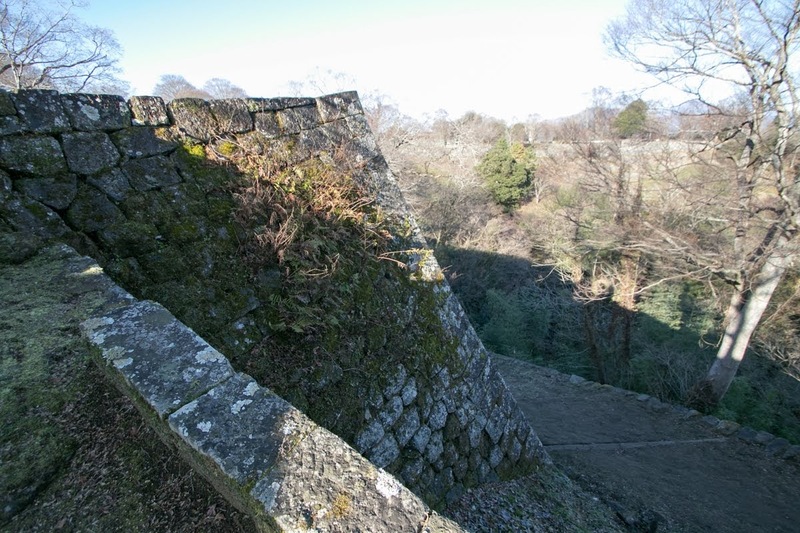 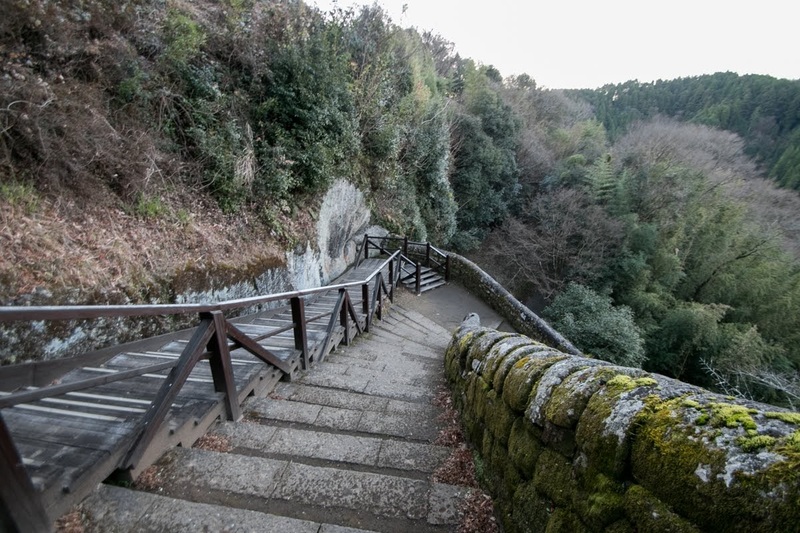 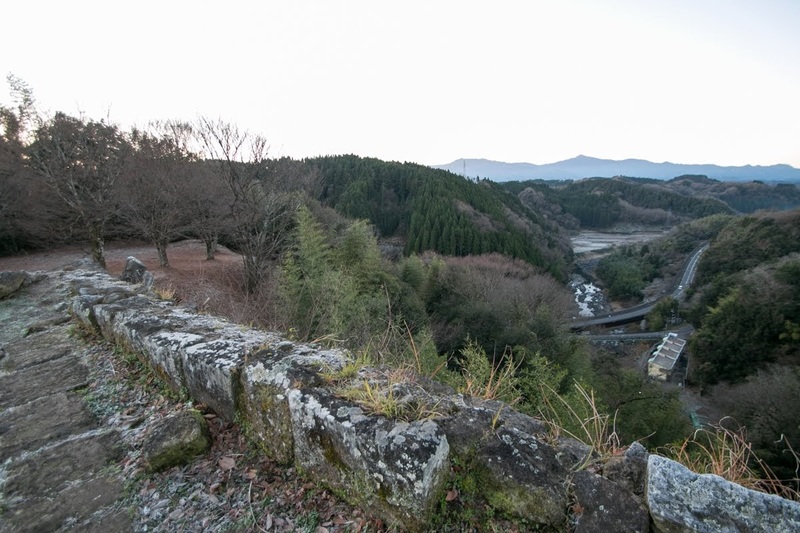 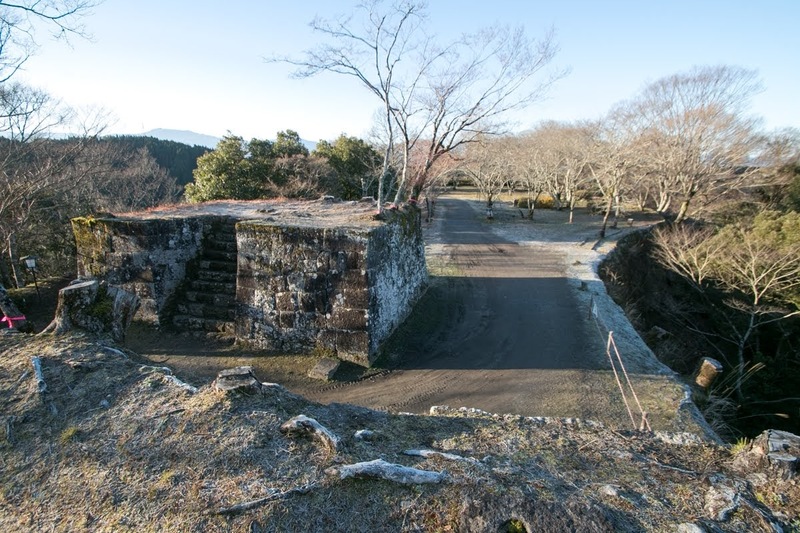 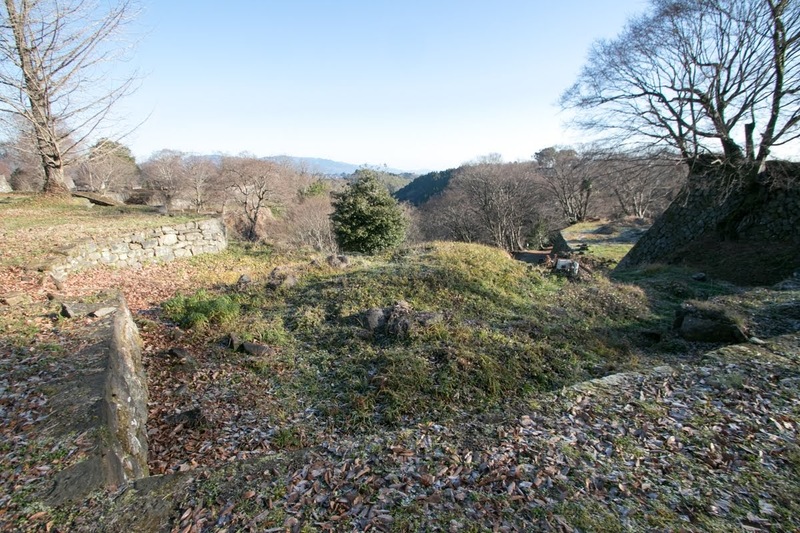 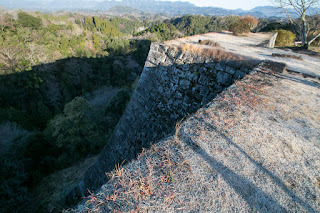 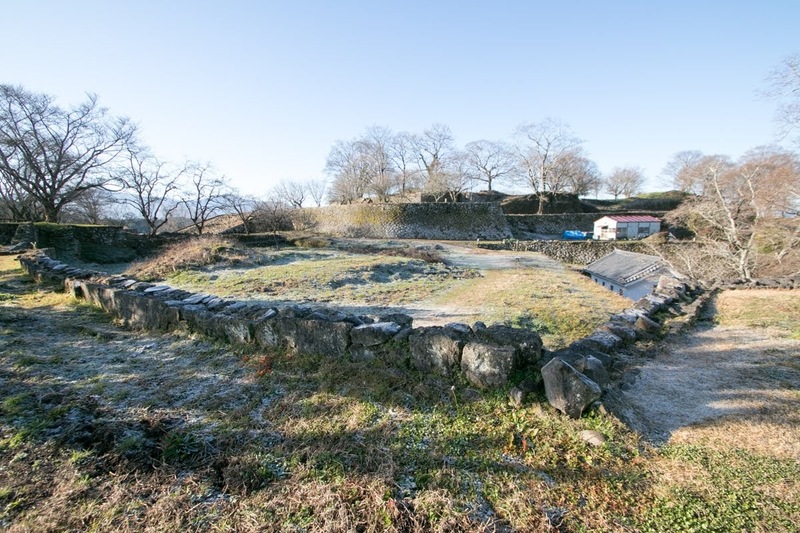 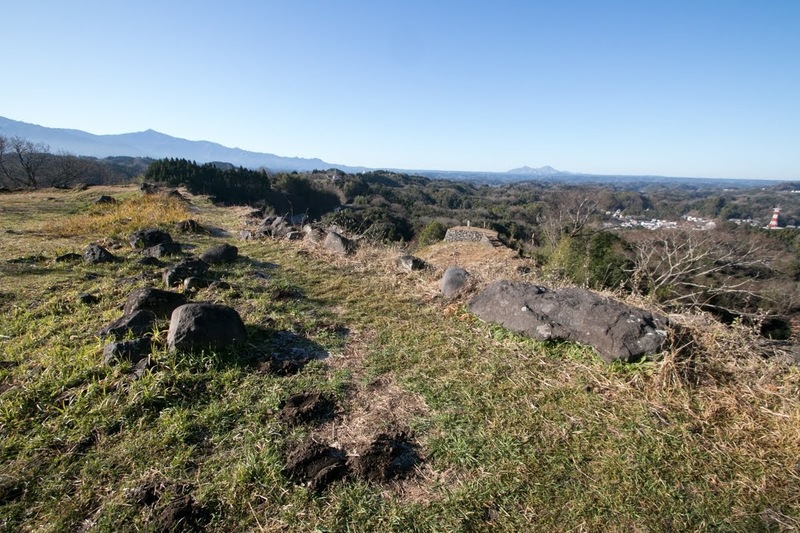 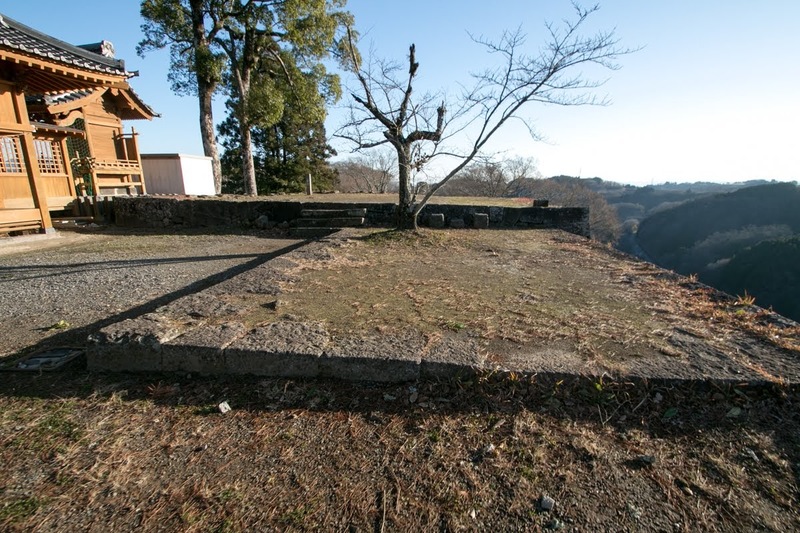 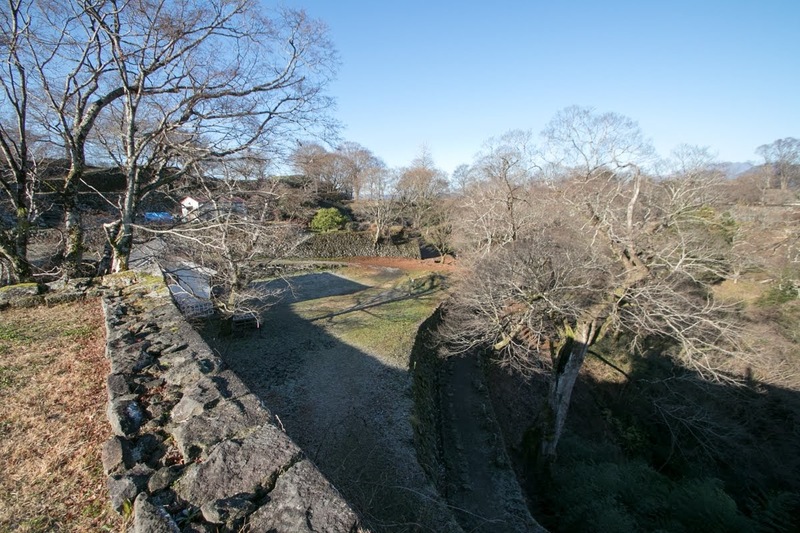 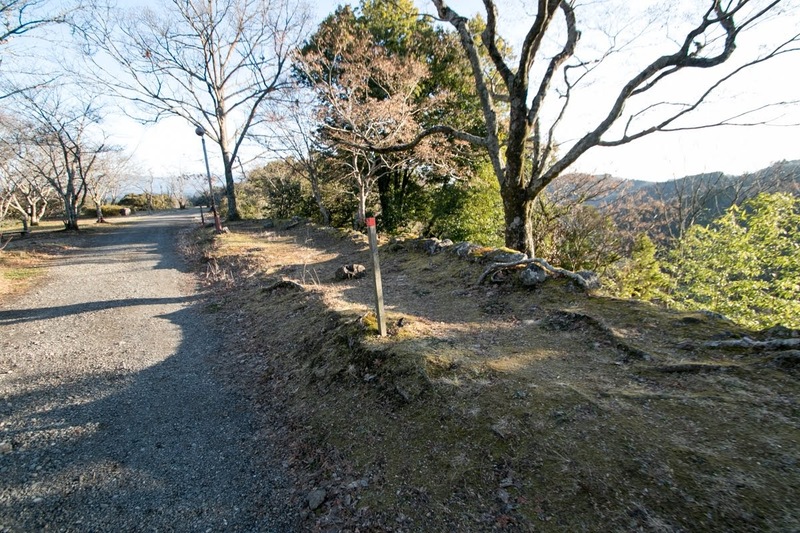 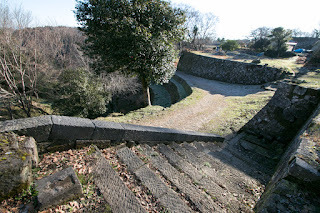 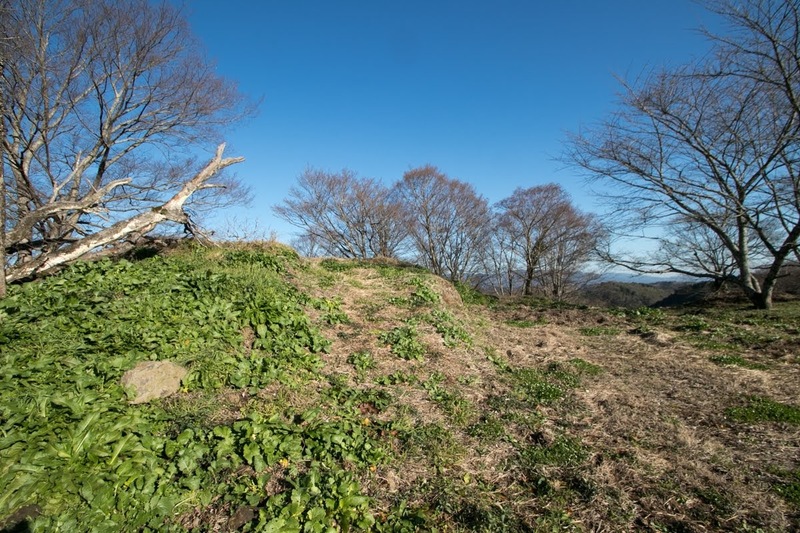 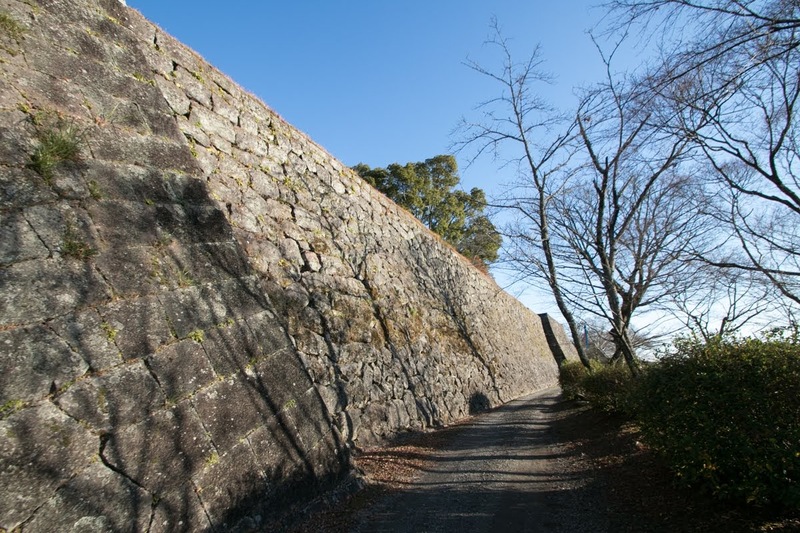 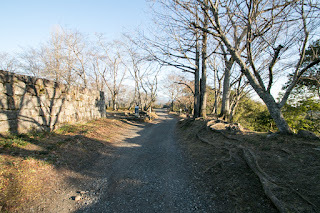 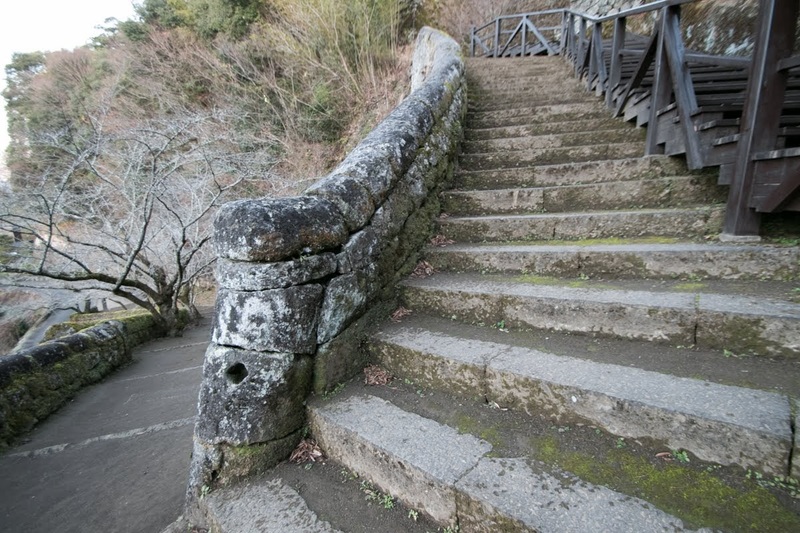 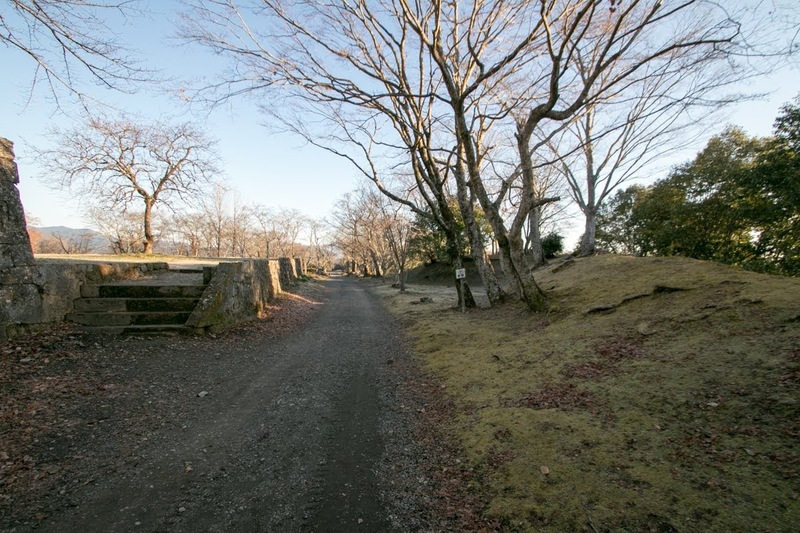 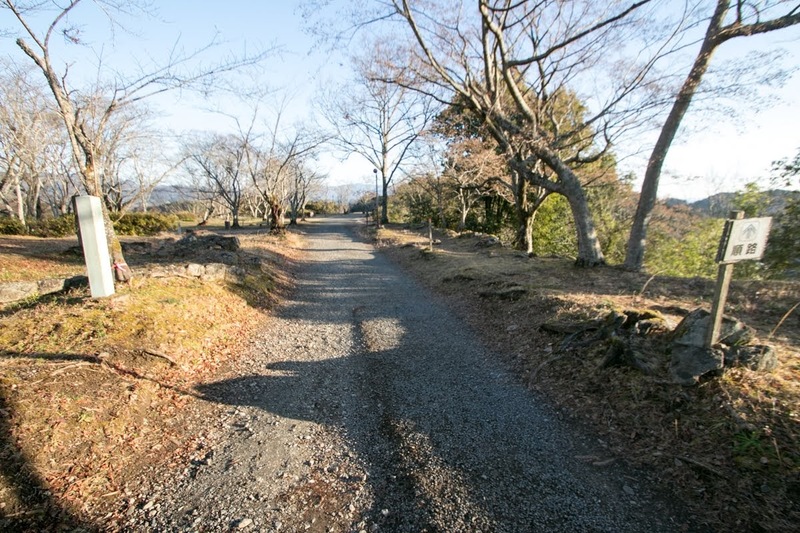 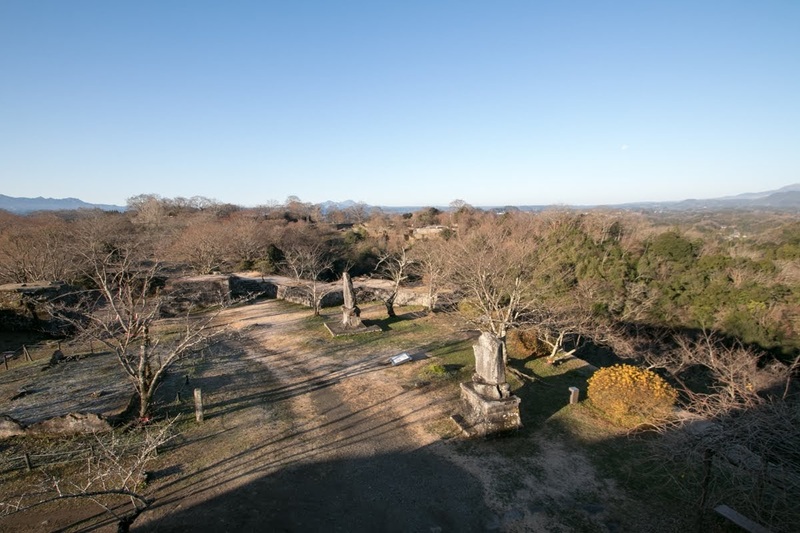 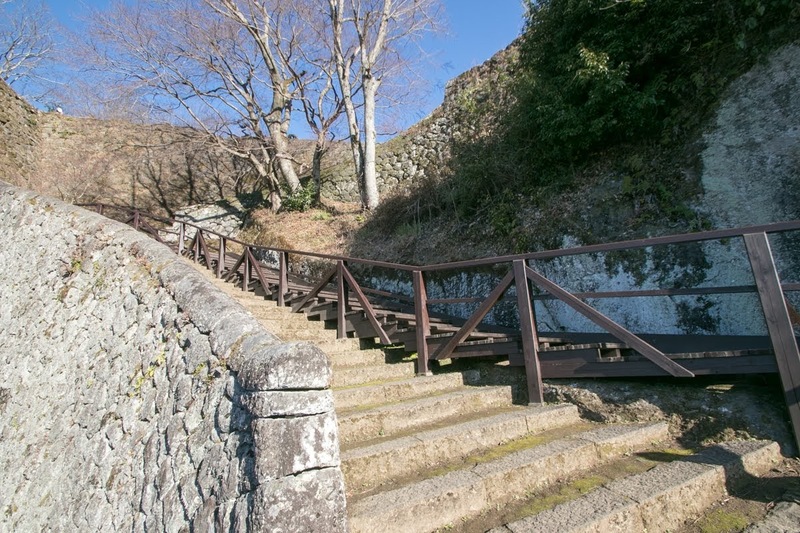 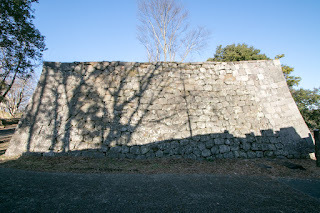 Looking at this, Chikatsugu insisted decisive battles at Onigajo castle, the outer fort of Oka castle and told the place of shallow to approach the castle to Shimazu army. Chikatsugu hided his troops near the castle, and when Shimazu army attacked the castle, assaulted it from backside then completely broke it. 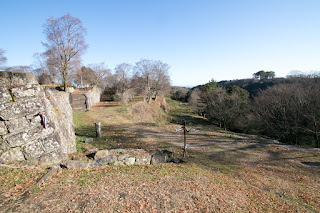 As a result, Chikatsugu could keep Oka castle by the arrival of Toyotomi army, and Hideyoshi highly praised a braveness and loyalty of Chikatsugu. Under Toyotomi government Otomo clan once survived as the lord of Bungo province, and Chikatsugu became an important retainer of Yoshimune Otomo (1558-1610). 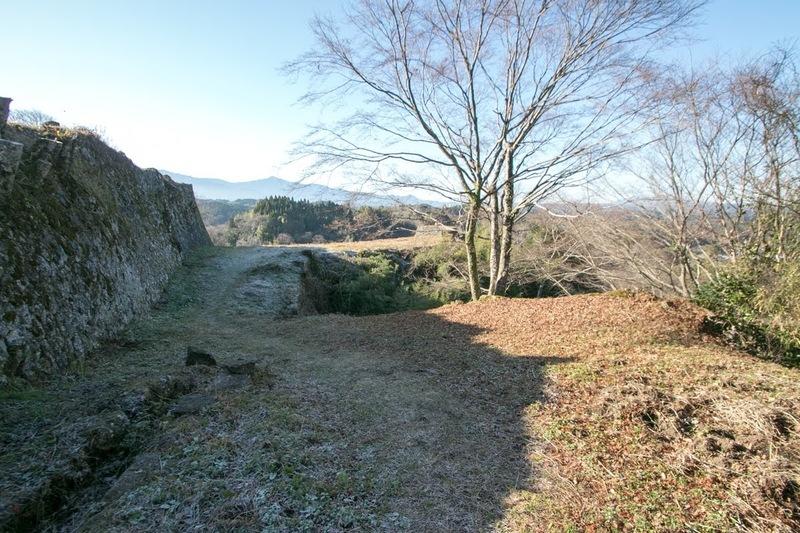 But in 1592, Otomo army made a failure in foreign expedition and was expelled and Chikatsugu also lost Oka castle. 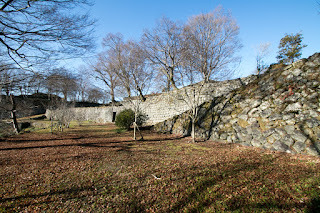 Eight years later Yoshimune raised army to restore Otomo clan at the time of the battle of Sekigahara, but was defeated by Yoshitaka Kuroda (1546-1604, famous as Kanbe) who was the lord of Nakatsu castle and lost the chance of recovery. Chikatsugu was hired by other warlords and finally became the retainer of Hosokawa clan at Higo province. 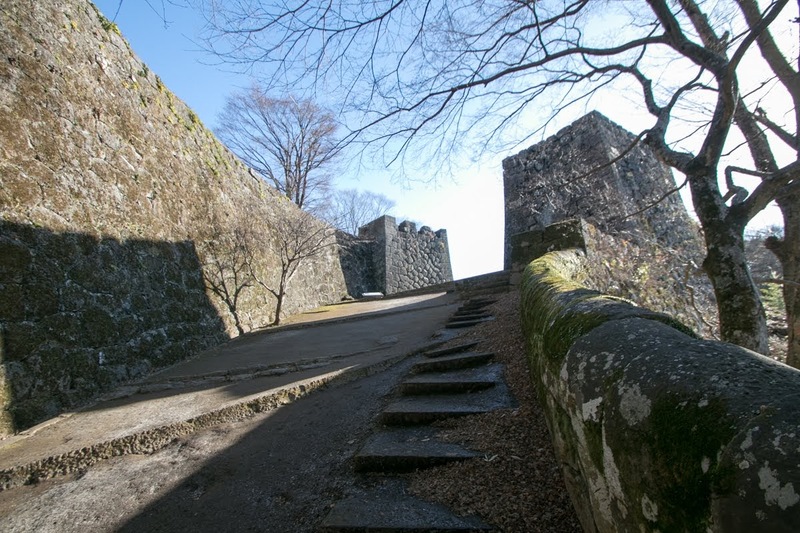 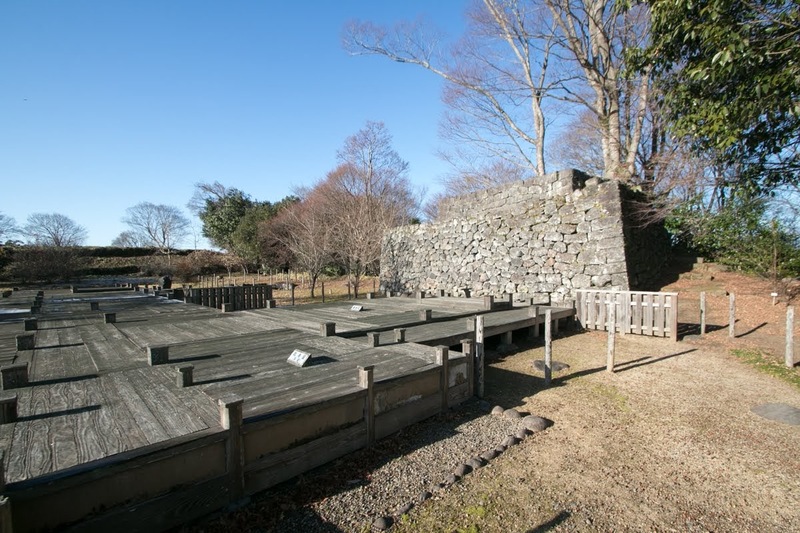 After Shiga clan, Hideshige Nakagawa (1570-1612) was appointed as a lord of Oka castle. 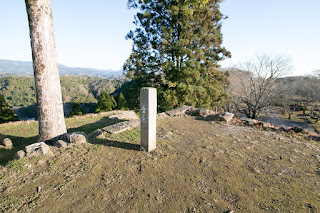 Hideshige was the second son of Kiyohide Nakagawa (1542-1583) who supported Hideyoshi at the battle of Yamagaki against Mitsuhide Akechi (1528-1582) in 1582 but died in the battle of Shizugatake in 1583. Originally Hidemasa Nakagawa (1568-1592), the eldest son of Kiyohide, succeeded leader position, but died by carelessness during foreign expedition. 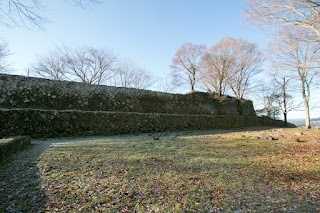 Hideyoshi became furious for this failure but considering loyalty of Kiyoshide, admitted Hideshige to continue the clan at Miki castle (Hyogo prefecture). 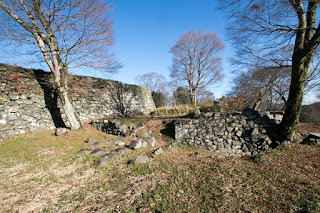 Next Hideshige became the lord of Oka castle. 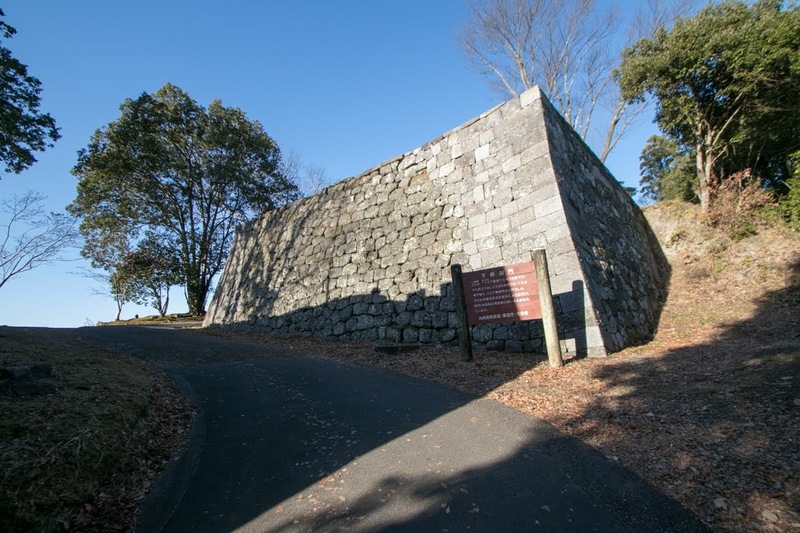 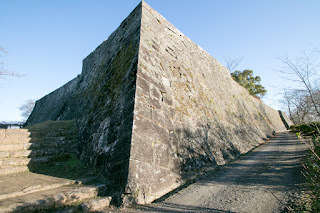 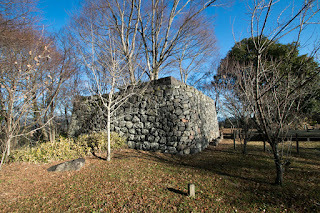 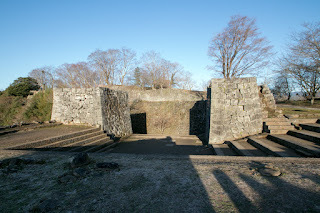 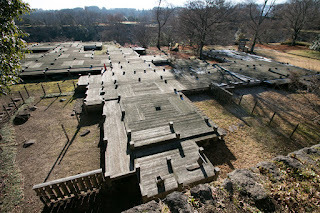 Hideshige who entered Oka castle reformed core area of Oka castle into a modern castle. 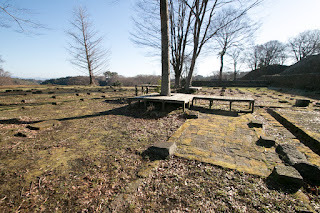 After the death of Hideyoshi, Ieyasu Tokugawa (1543-1616), the largest lord under Toyotomi government and Mitsunari Ishida (1560-1600), the chief administrative staff of Toyotomi government, struggled for next hegemony. 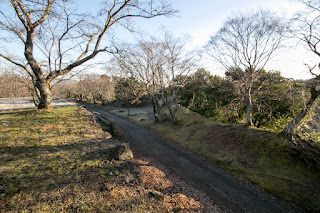 At the battle of Sekigahara between both party, Hideshige at first supported Mitsunari but seeing the defeat of Mitsunari, suddenly changed to Tokugawa side. 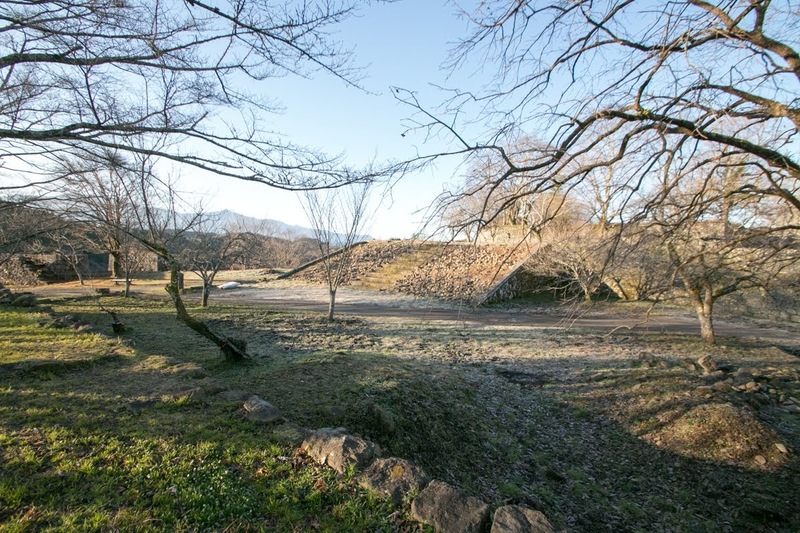 Hideshige fought with Kazuyoshi Ota (?-1617) who was the lord of Usuki castle and supported Mitsunari, and barely won with severe damage. 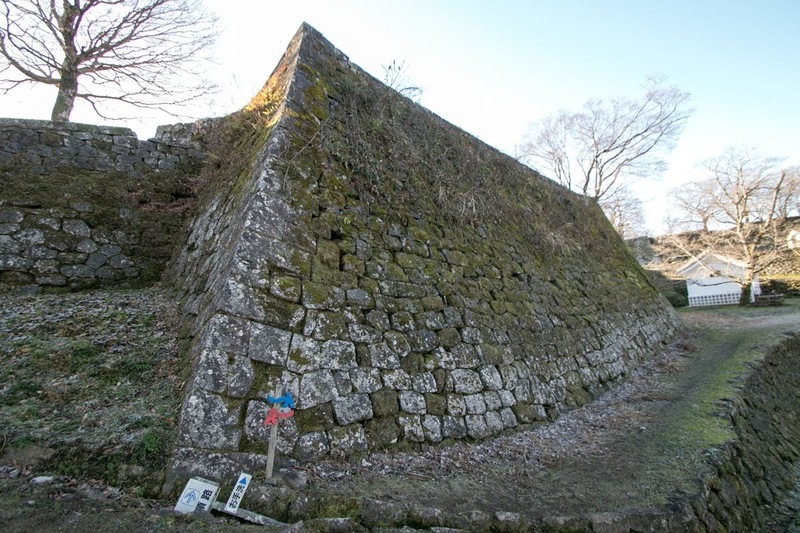 Being evaluated this behavior, Hideshige could survived as a feudal lord of Takeda domain under Edo Shogunate. 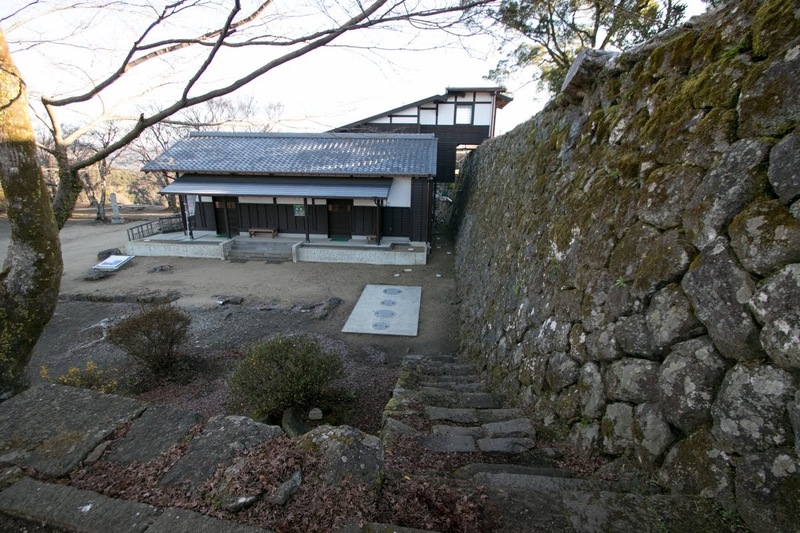 Facing many crisis, Nakagawa clan was able to continue its history. 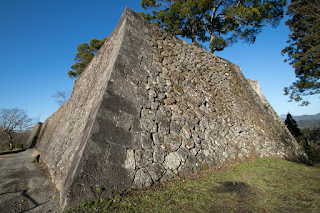 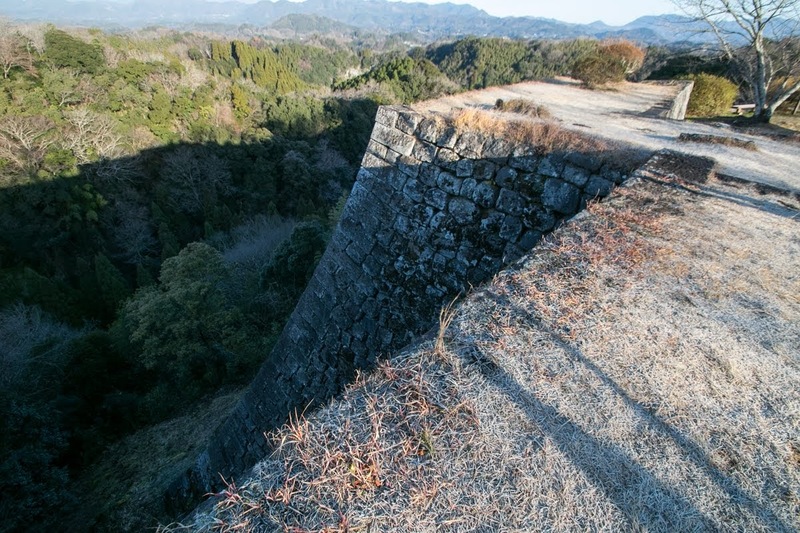 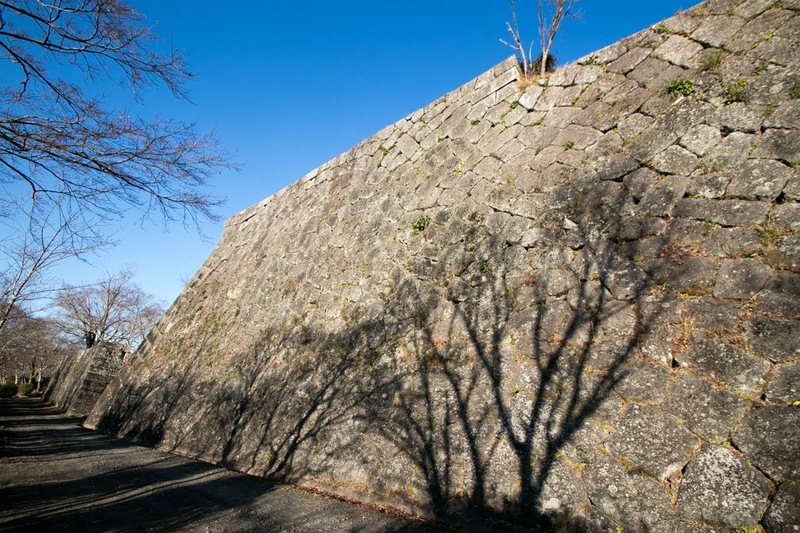 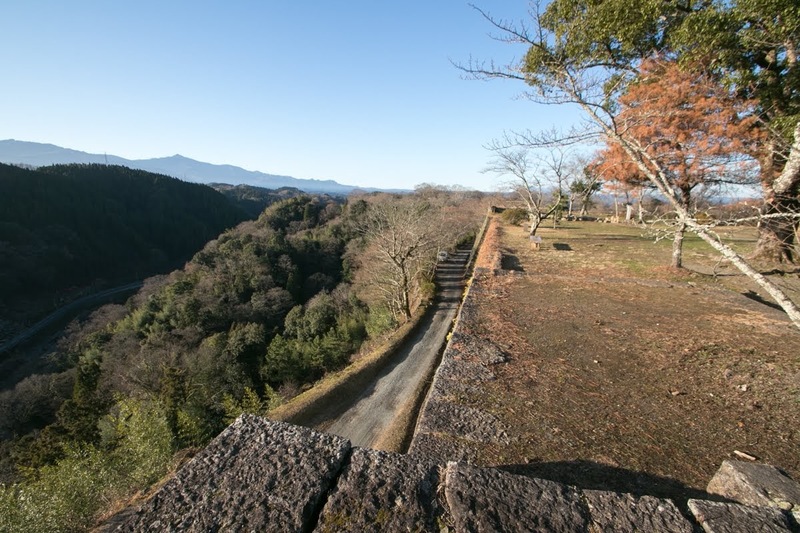 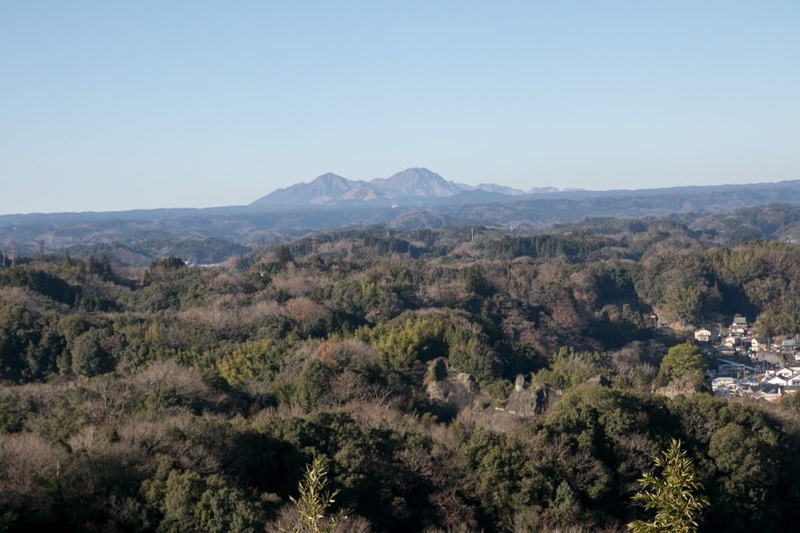 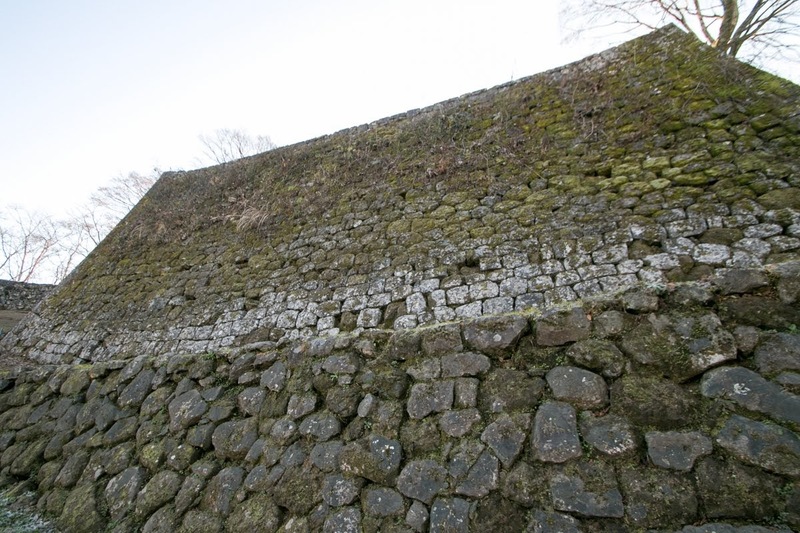 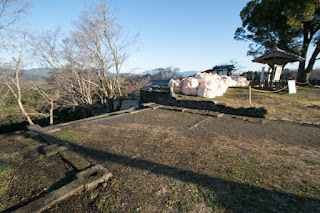 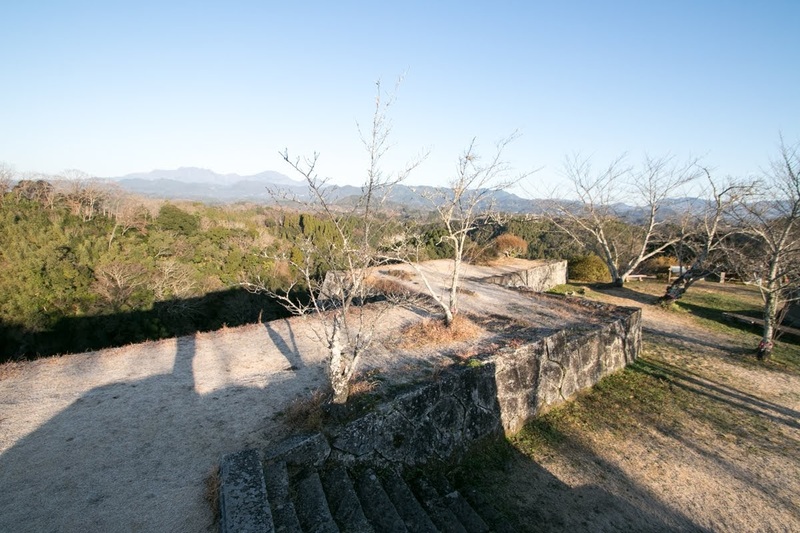 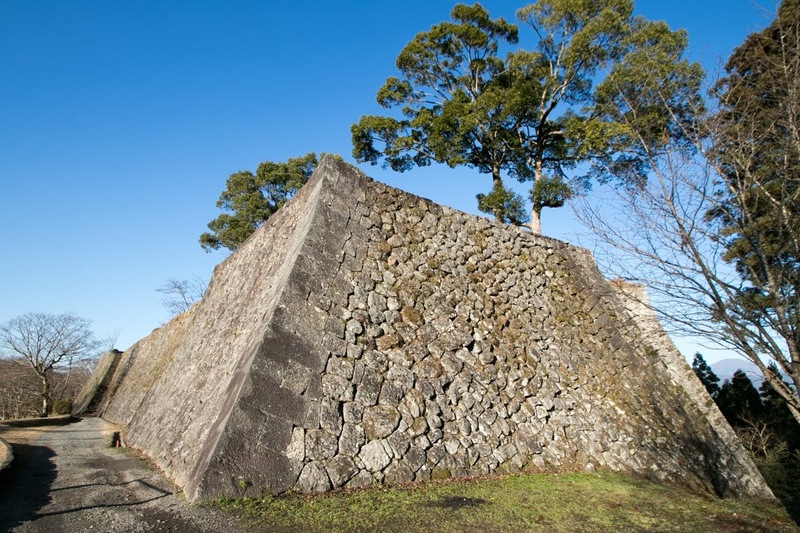 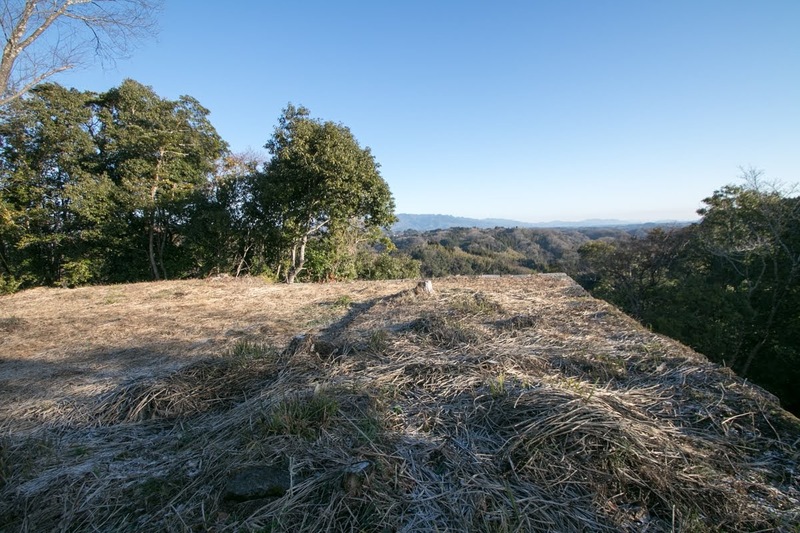 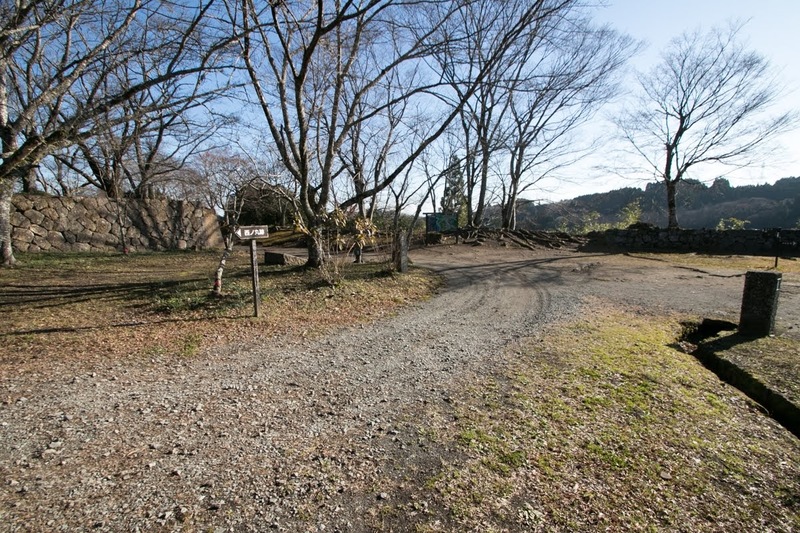 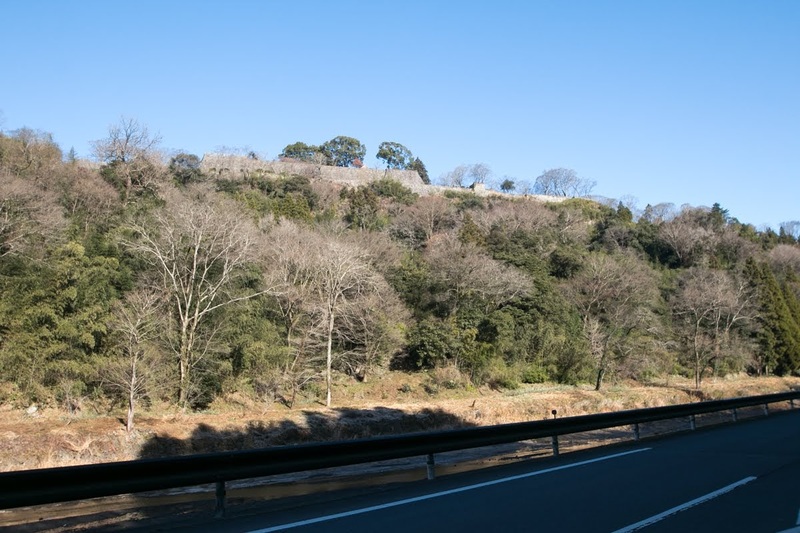 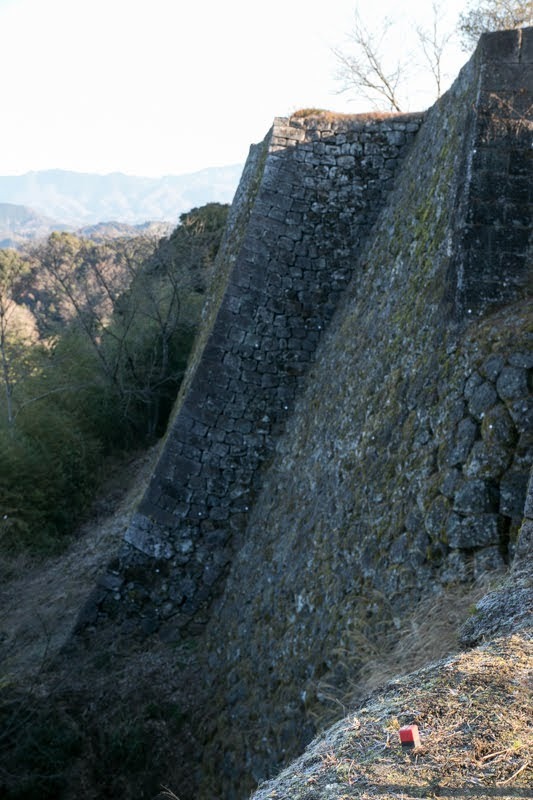 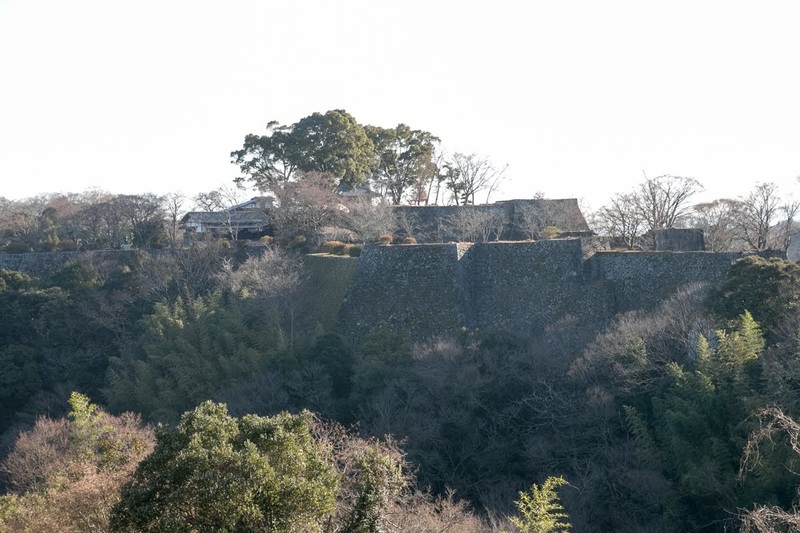 Even though not so large domain of 70,000 Koku (unit of rice harvest), Nakagawa clan continuously expanded Oka castle and finally this castle became a huge one spreads over 1 kilometer along the hill. Oka castle spread over the hill of 90 degree rotated J letter or saxophone like hill. 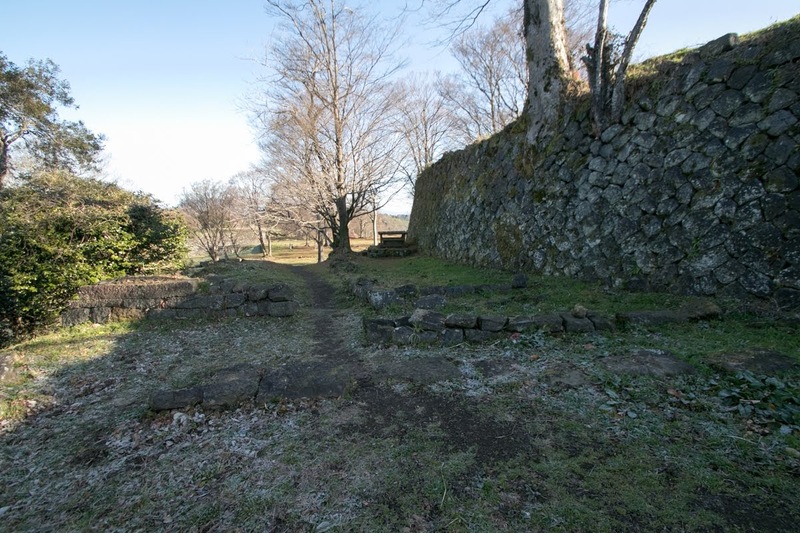 This castle consist of three main part of inner part, middle part and western part from eastward separated by bottlenecks. Middle part is a Y letter shaped area and main body of the castle consist of central area, secondary area and third area at each tip. 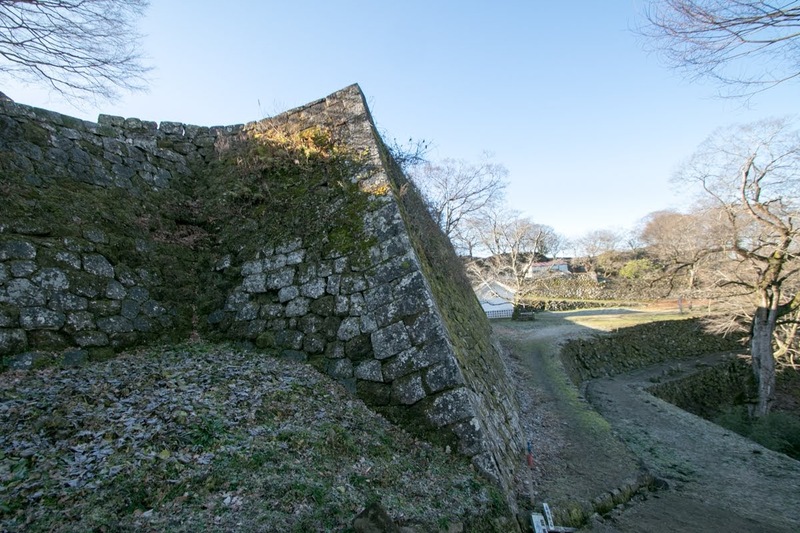 Central area is a rectangular area of 100 meter long and 50 meter wide, and a three story turret which was a substitute of main tower and another turret named as treasure storage were built at both edge. 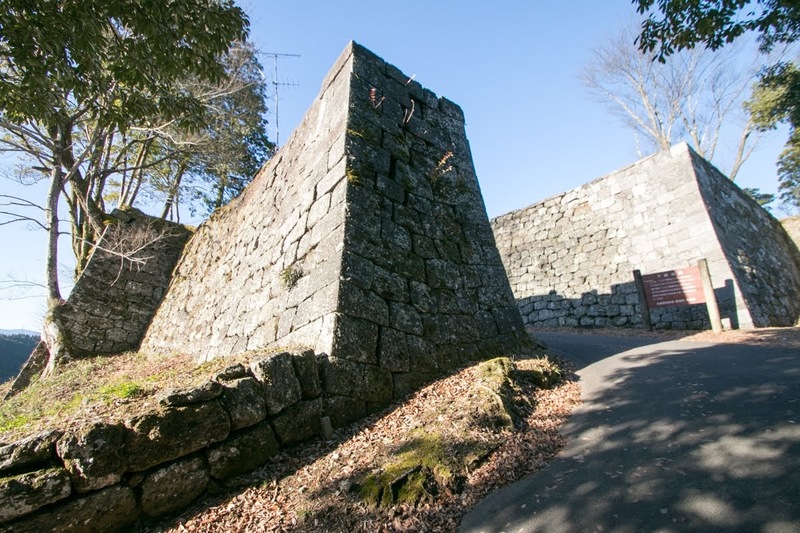 This middle part was built before 1600, and has a shape of typical mountain modern castles under Toyotomi government. 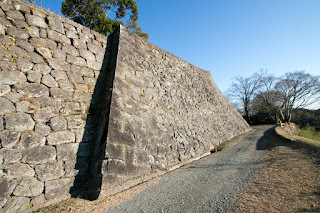 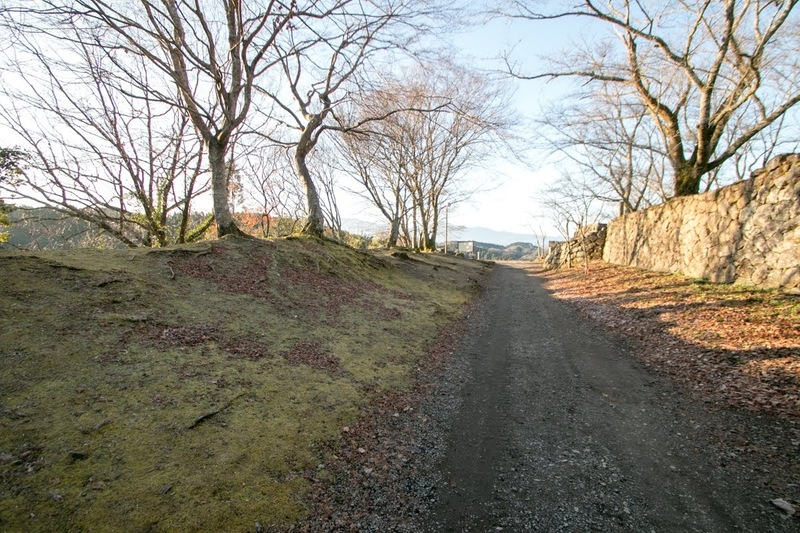 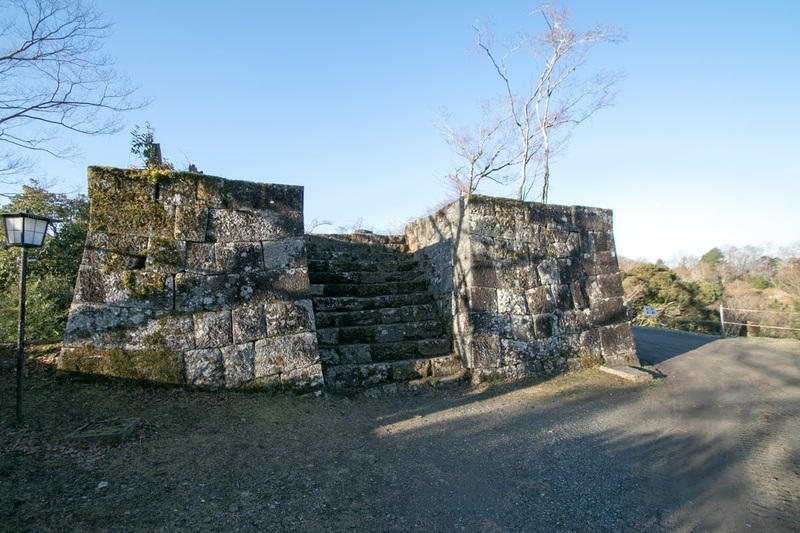 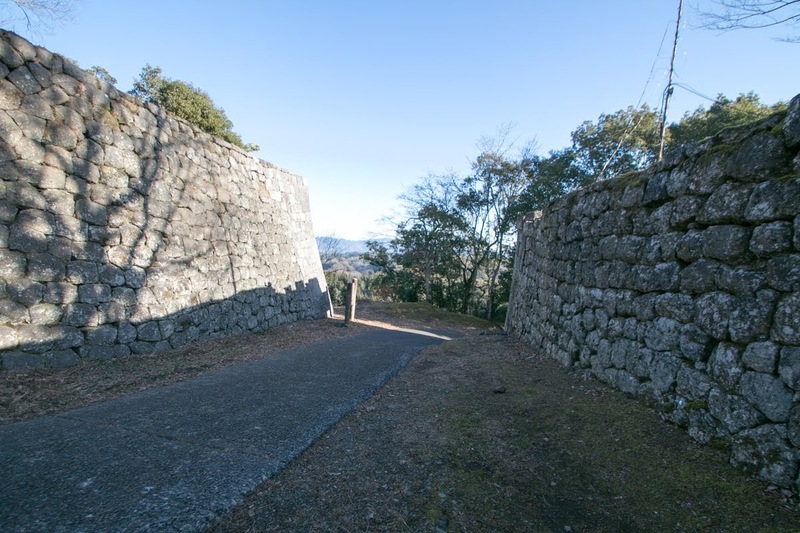 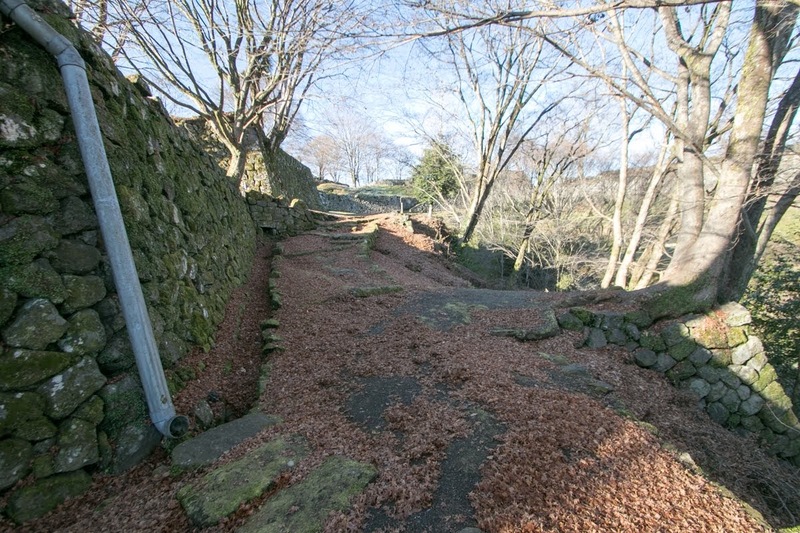 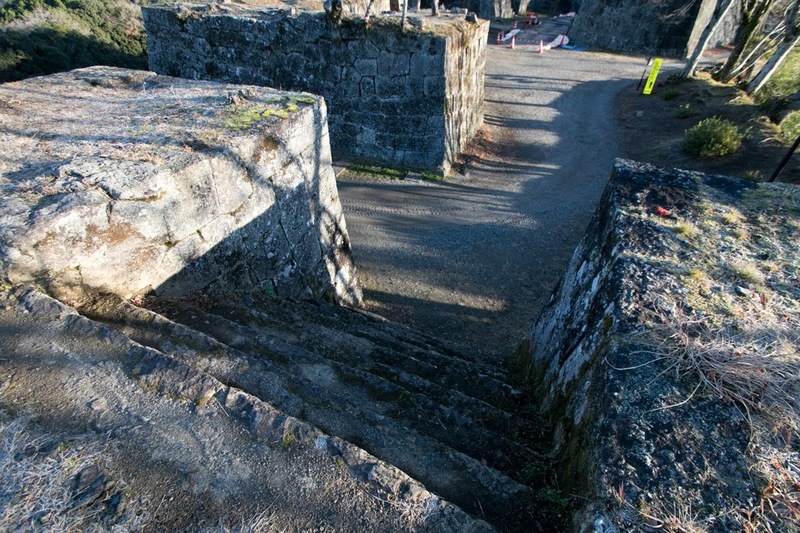 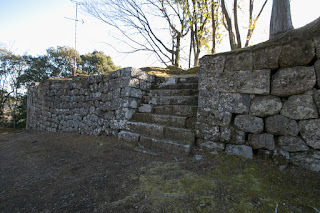 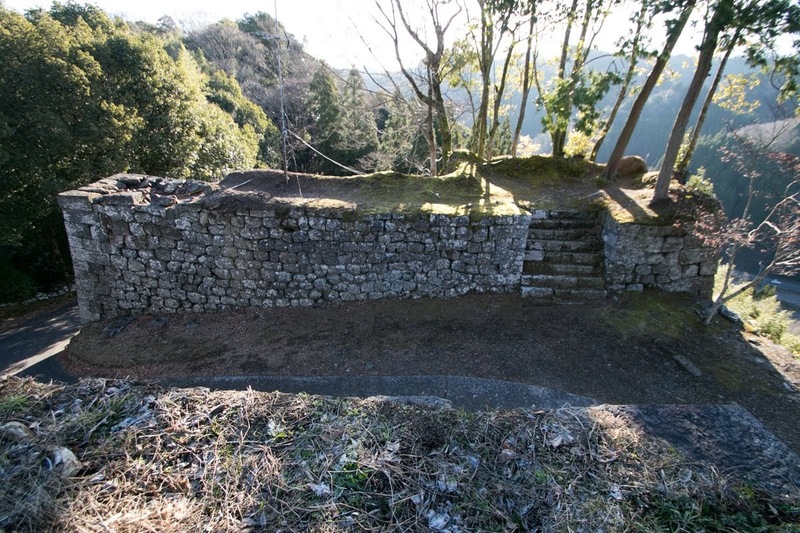 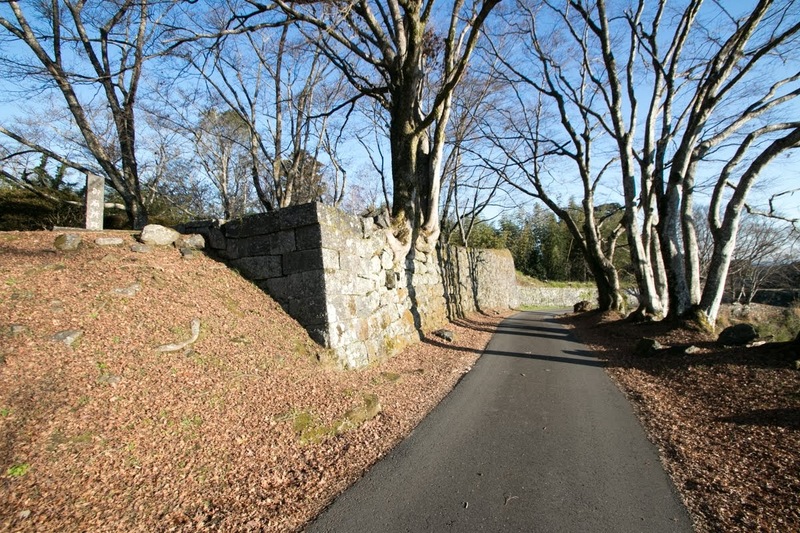 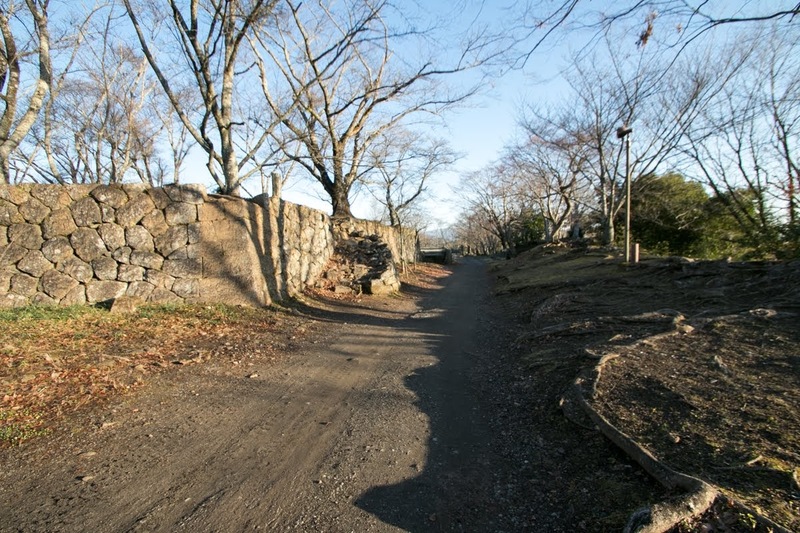 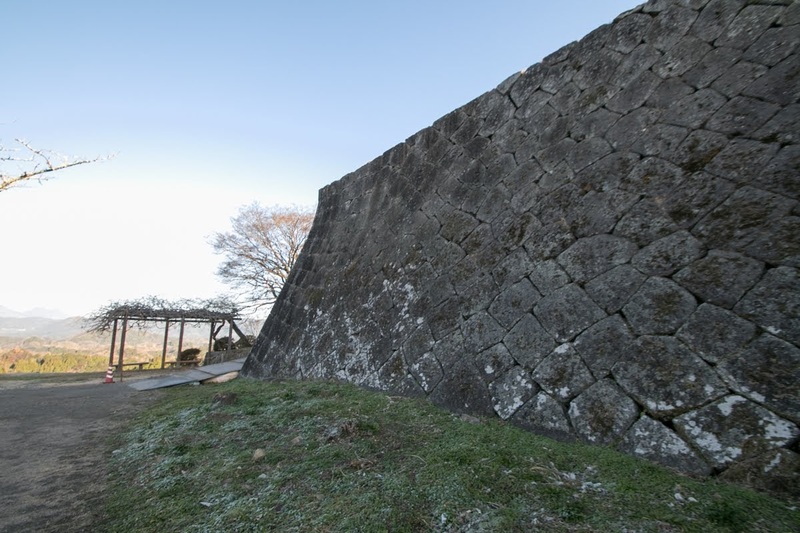 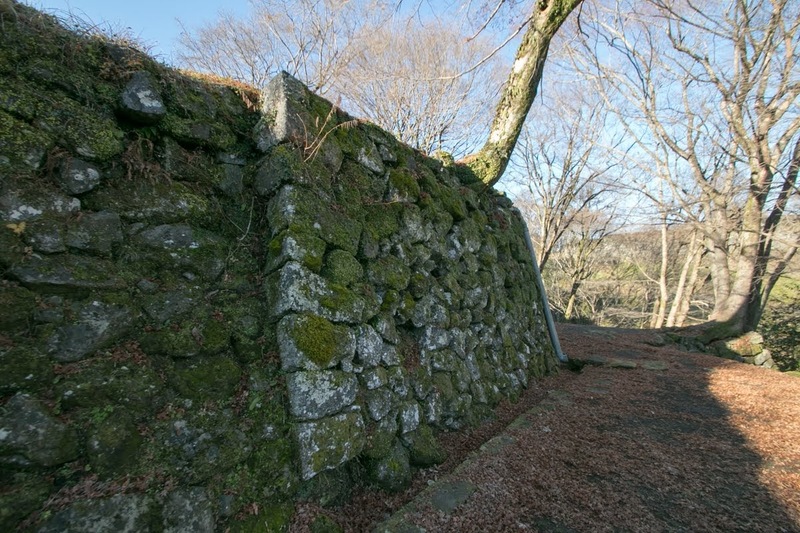 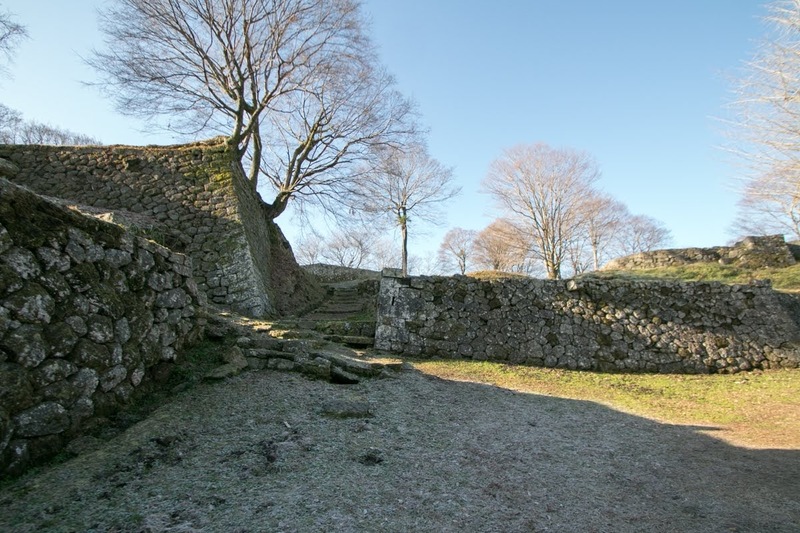 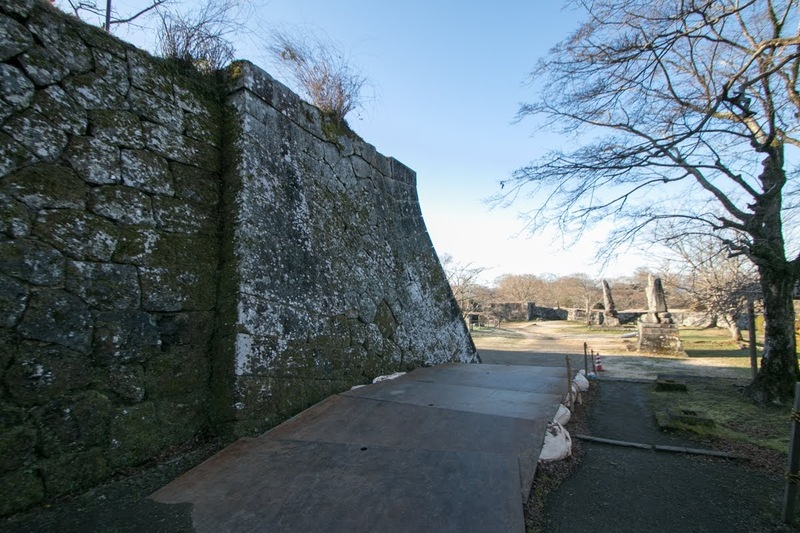 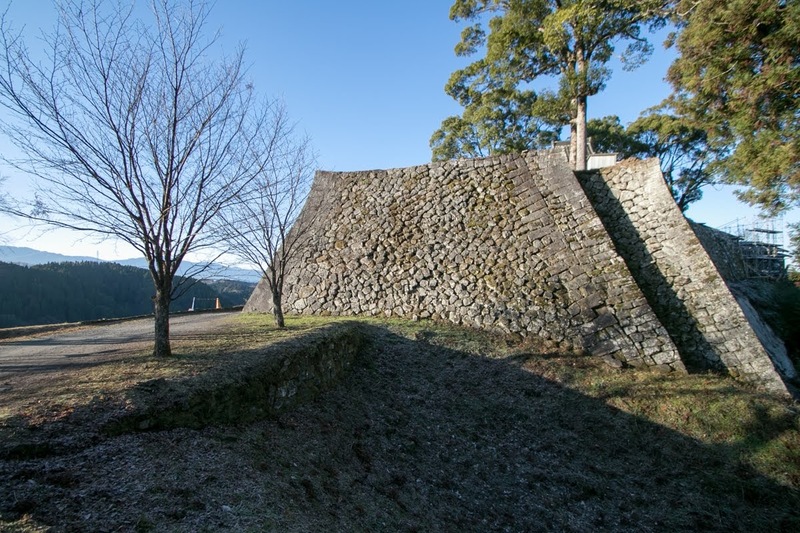 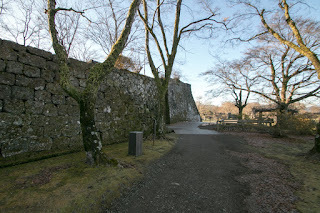 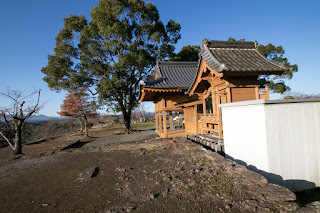 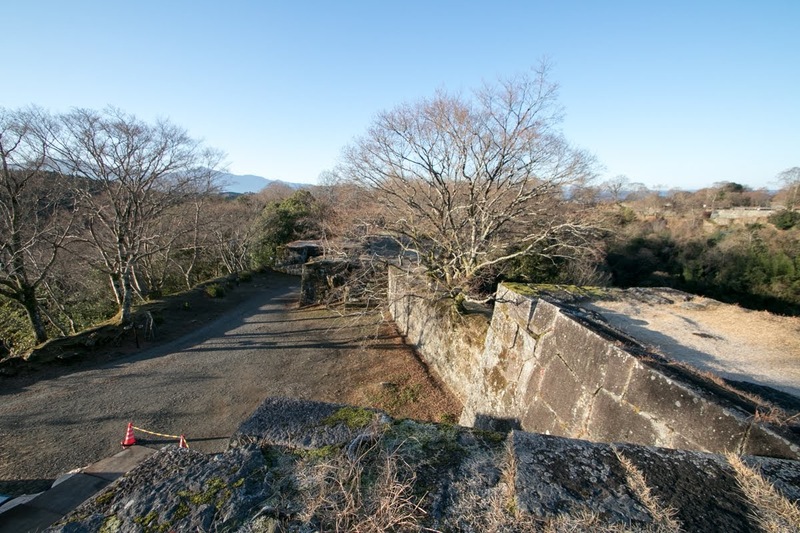 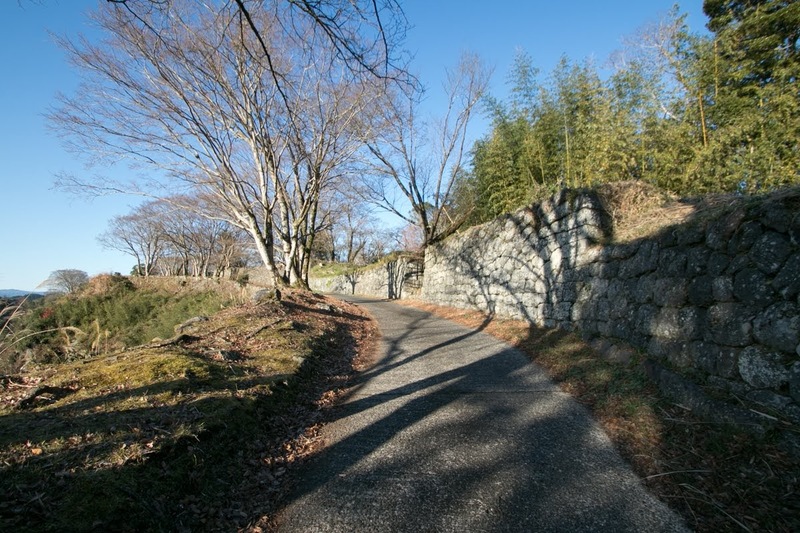 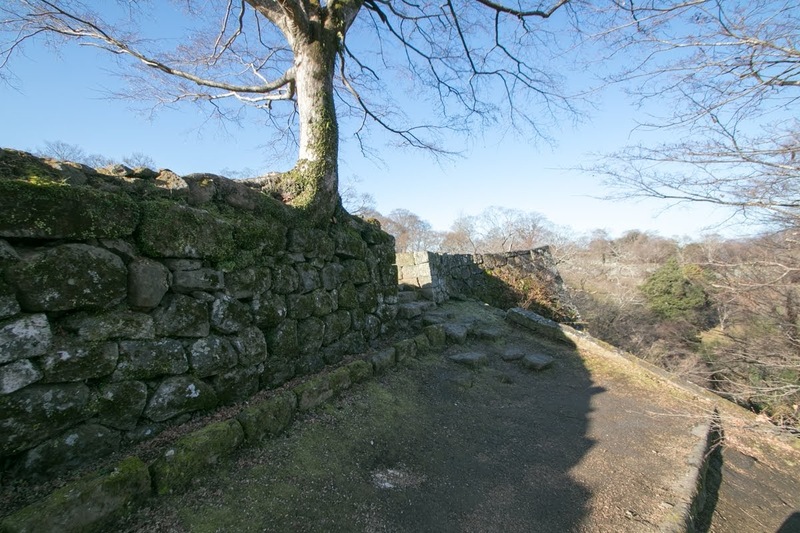 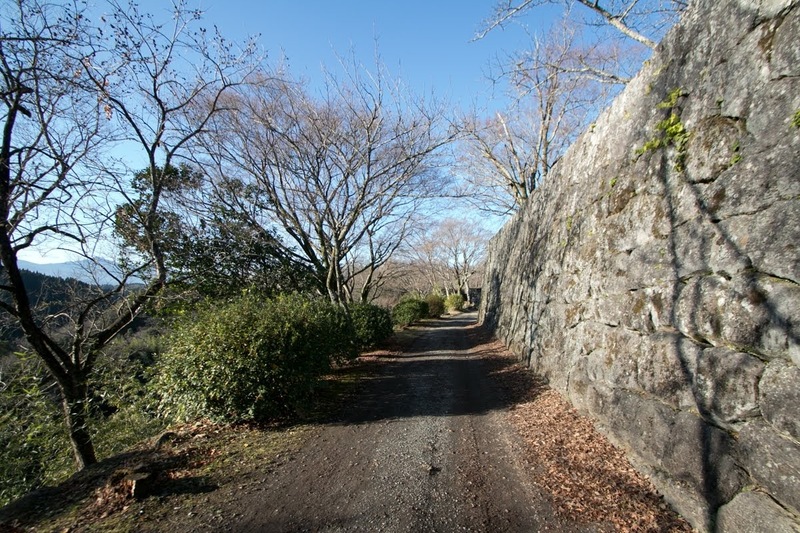 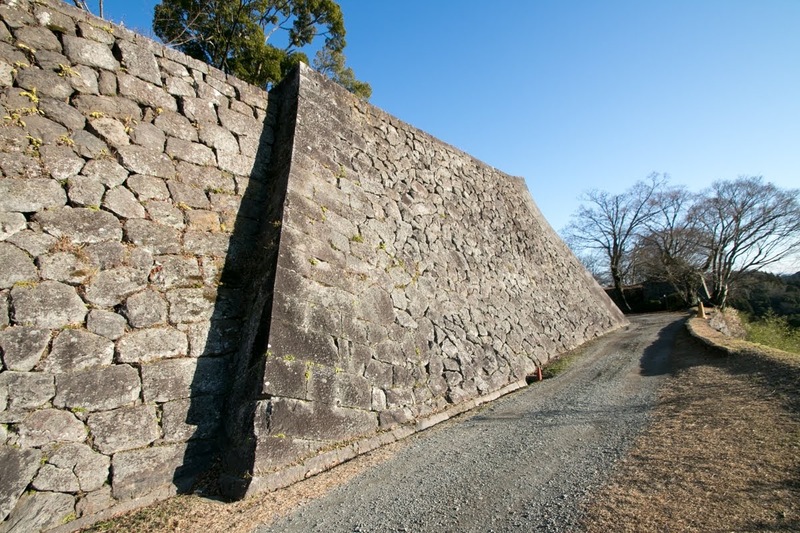 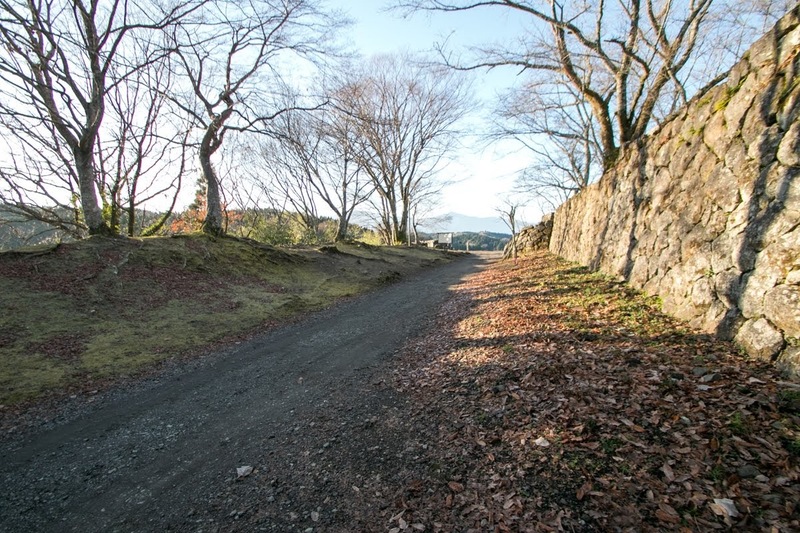 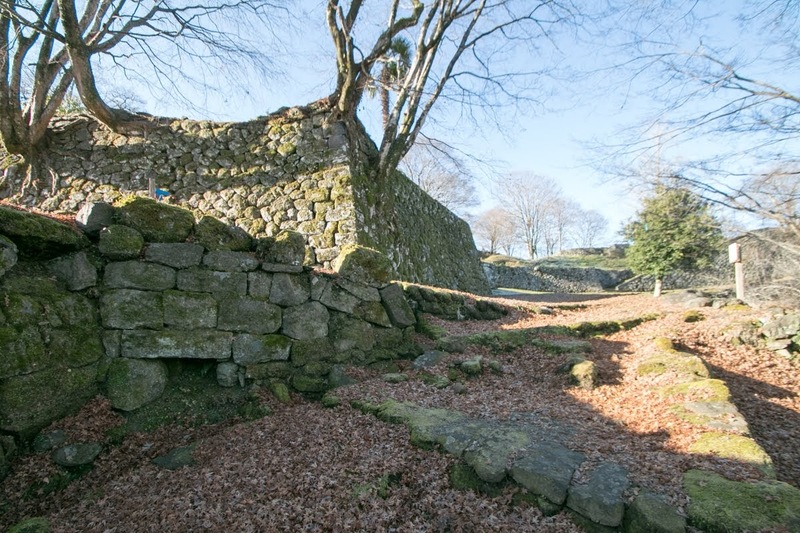 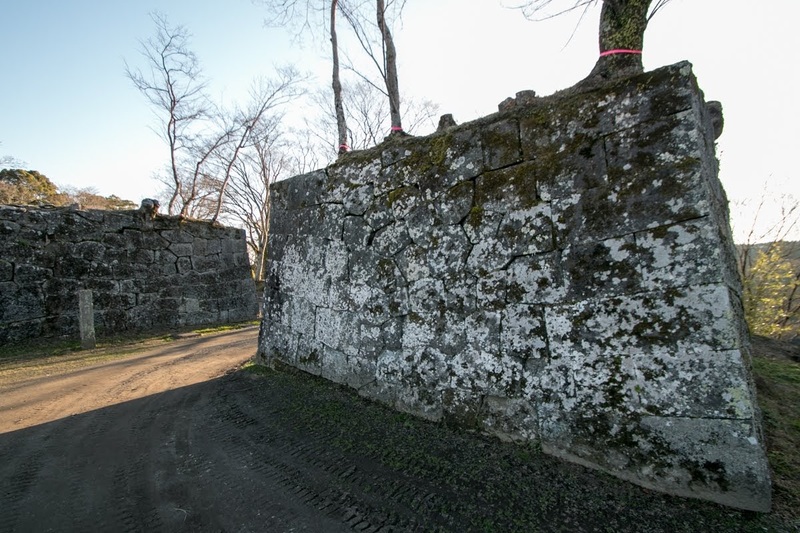 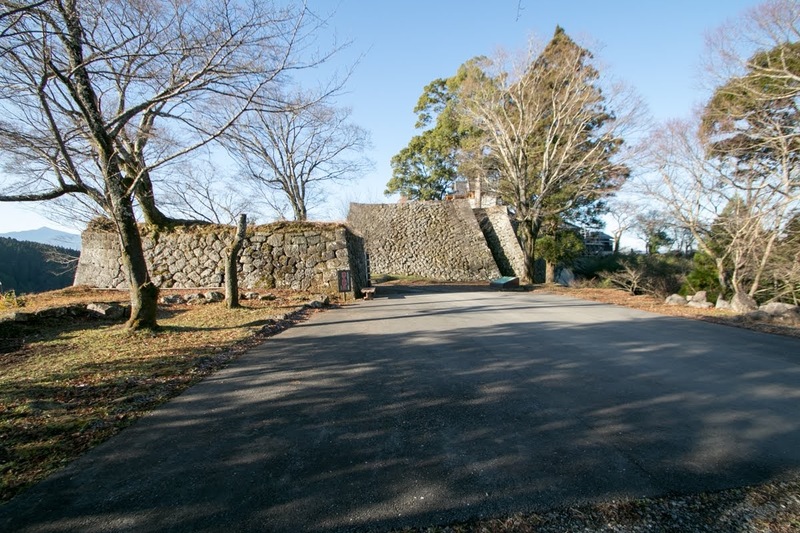 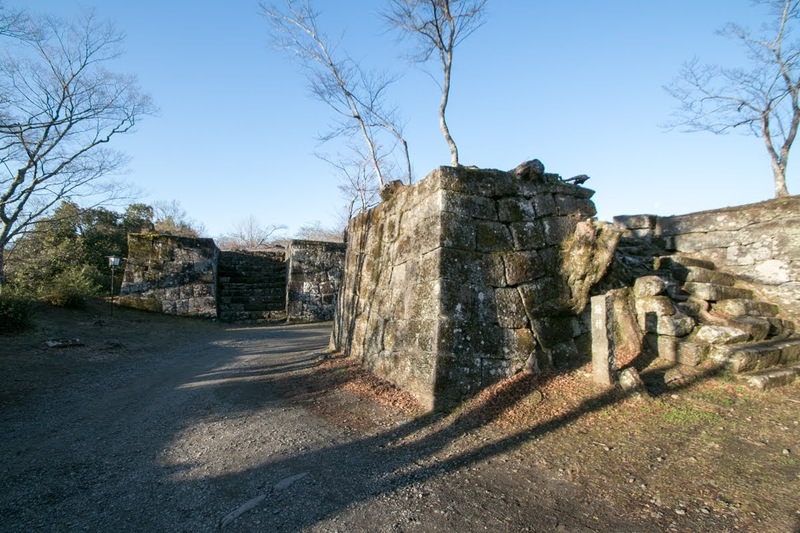 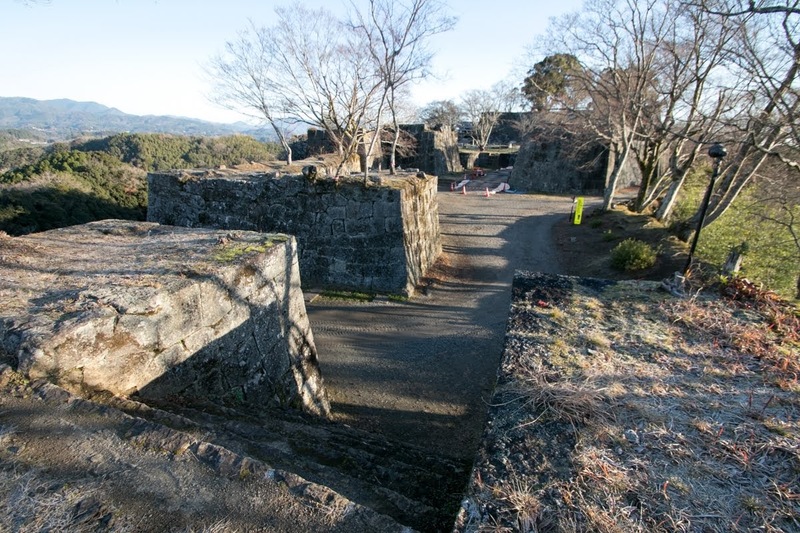 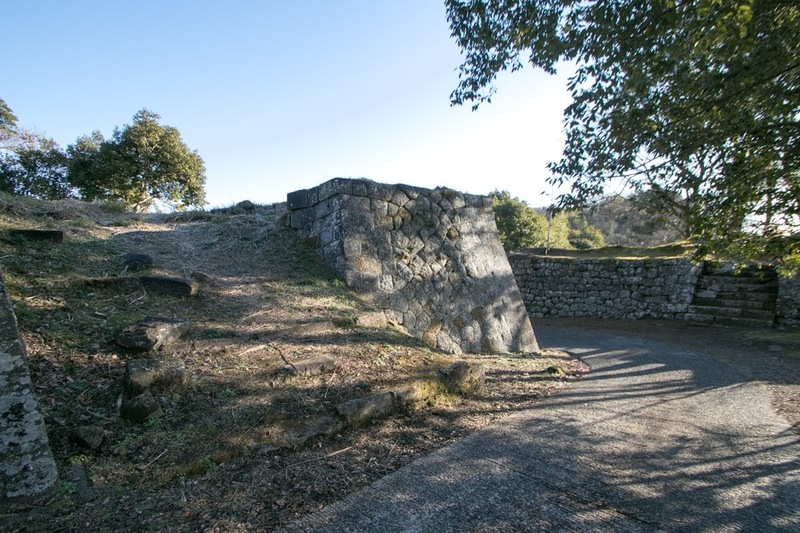 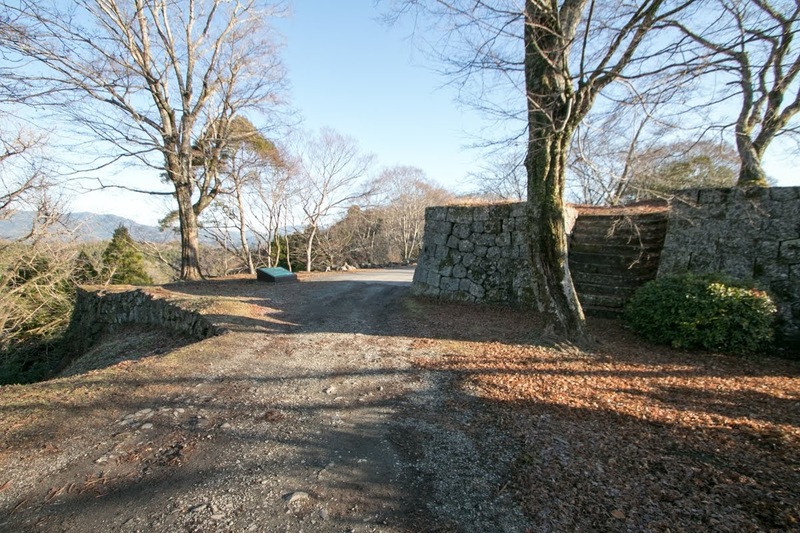 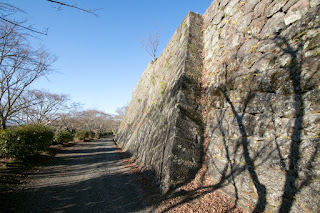 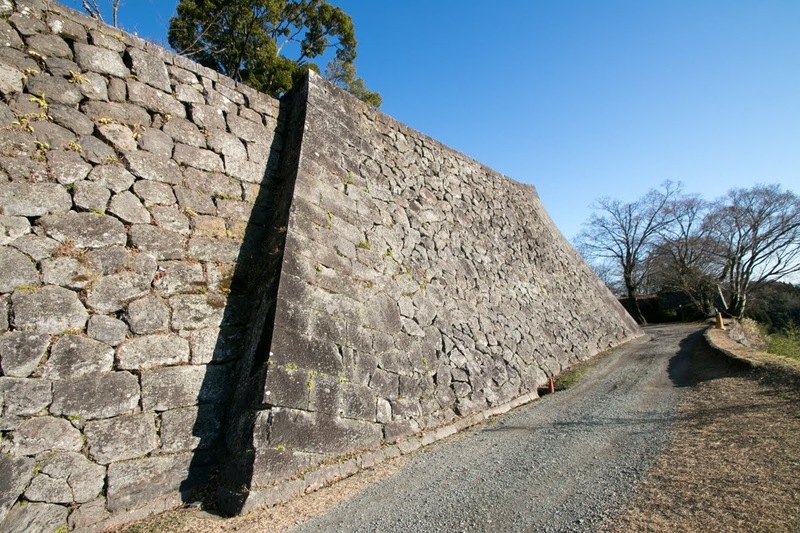 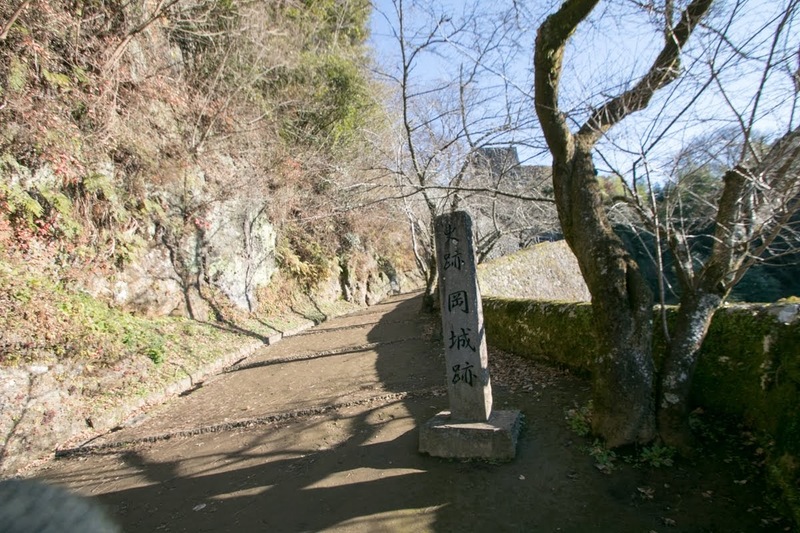 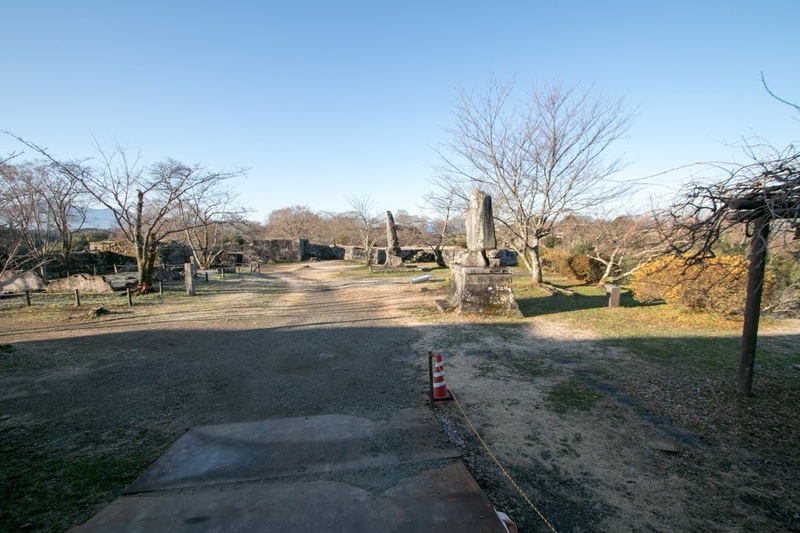 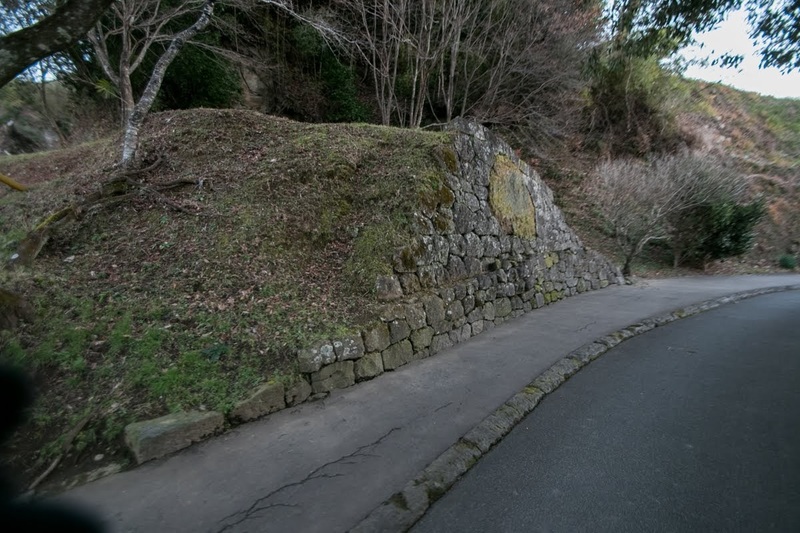 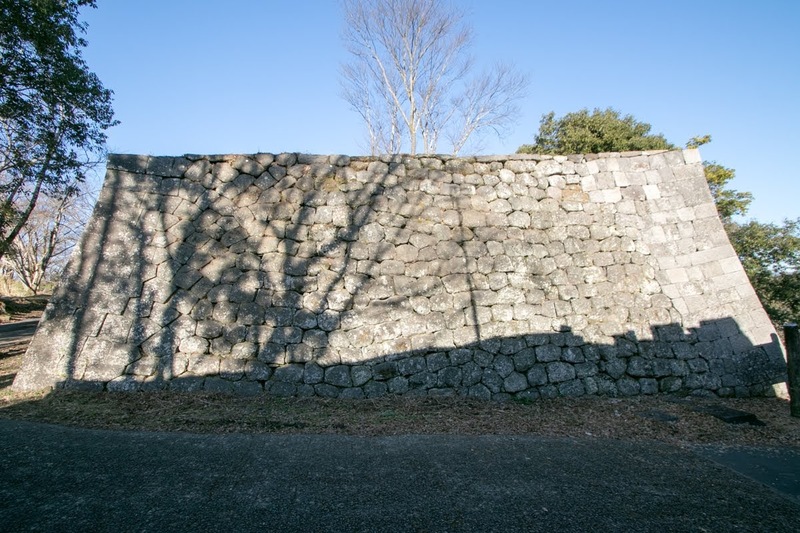 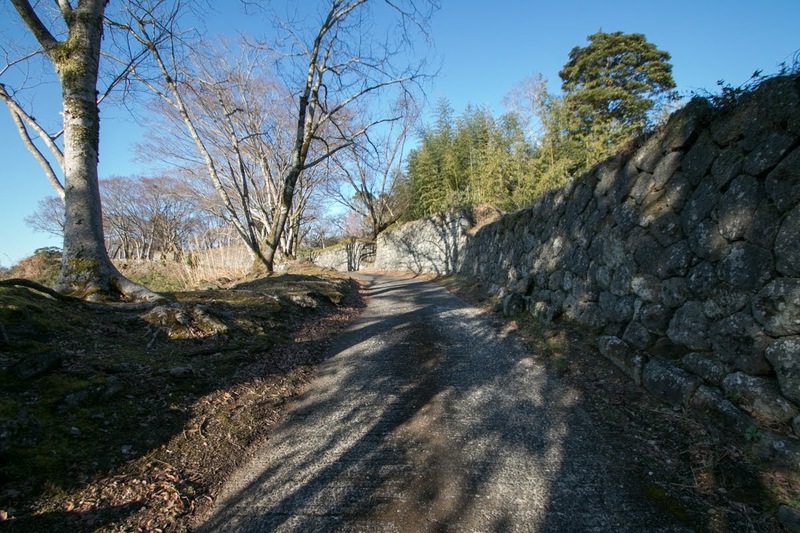 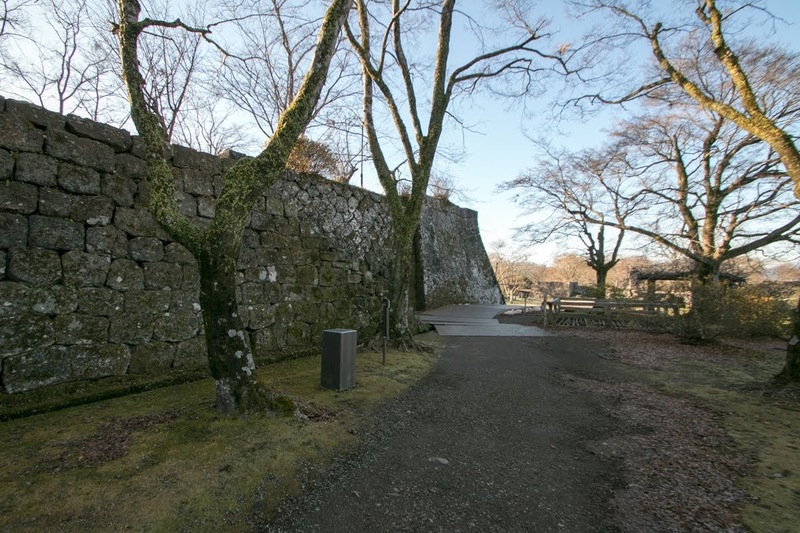 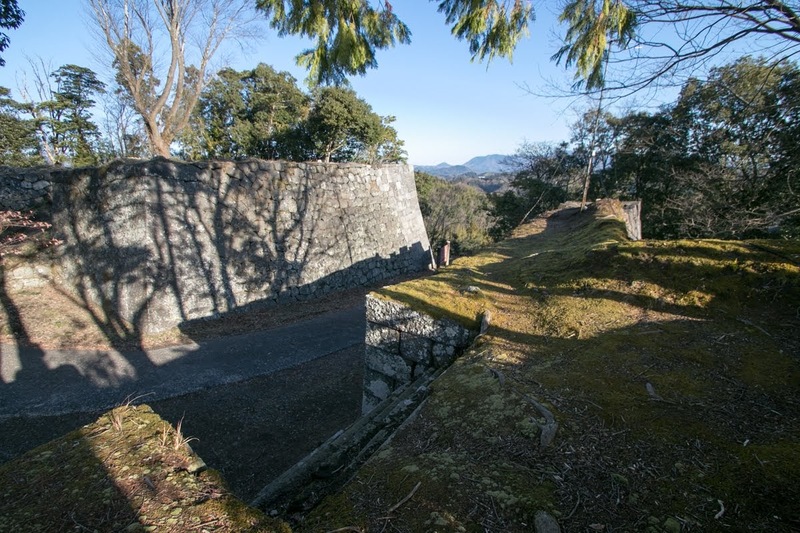 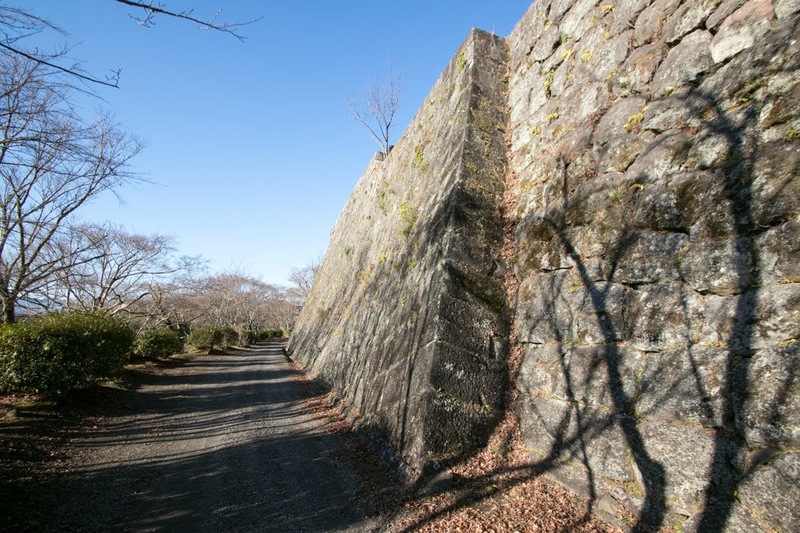 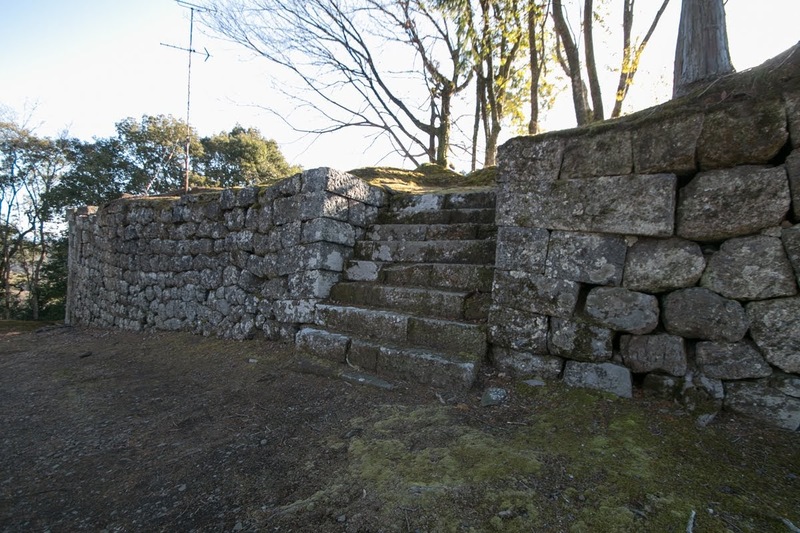 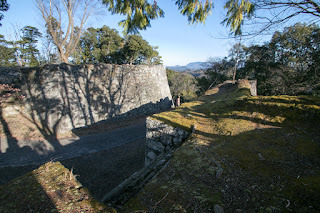 Each area is protected by sheer stone walls, and both side of the part was securely protected by masugata gates (combined gate) built at bottle neck. 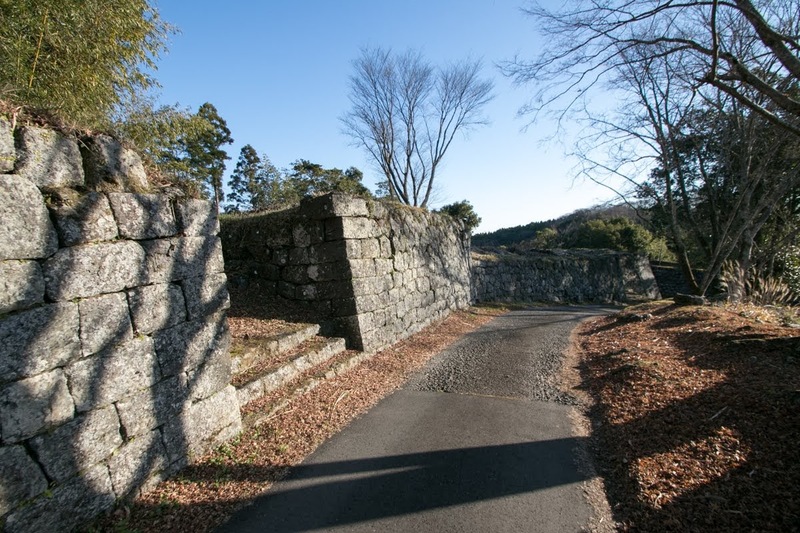 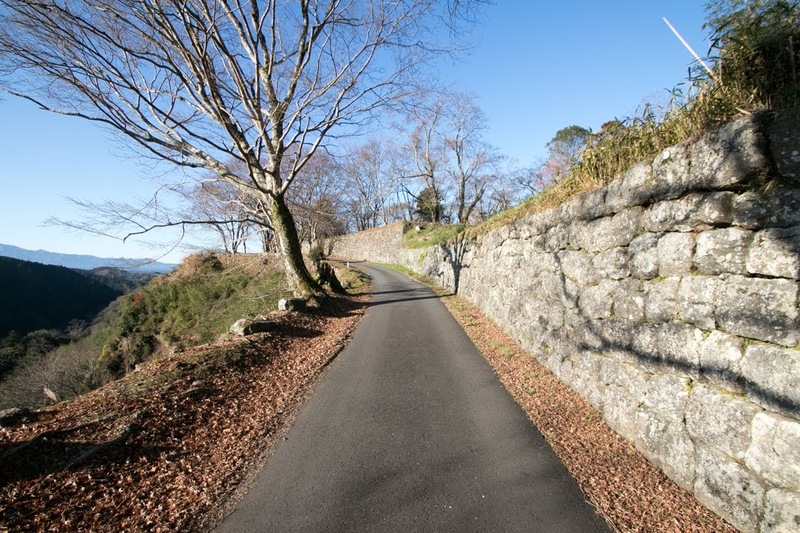 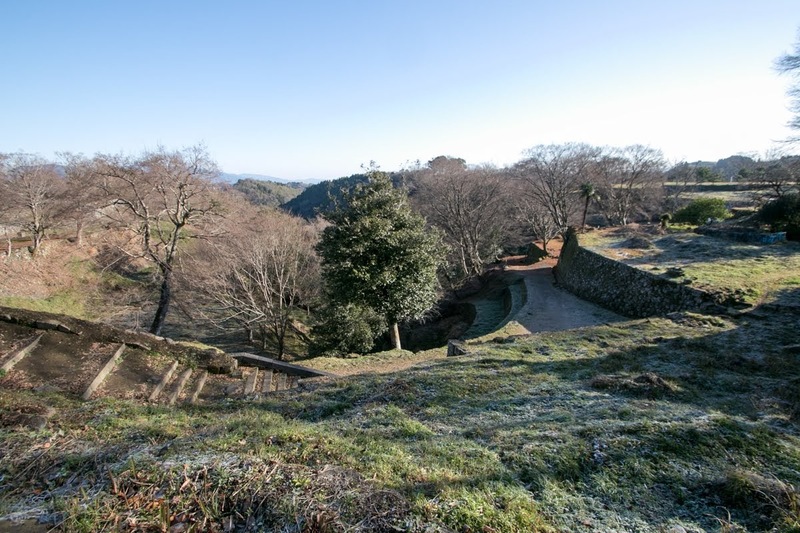 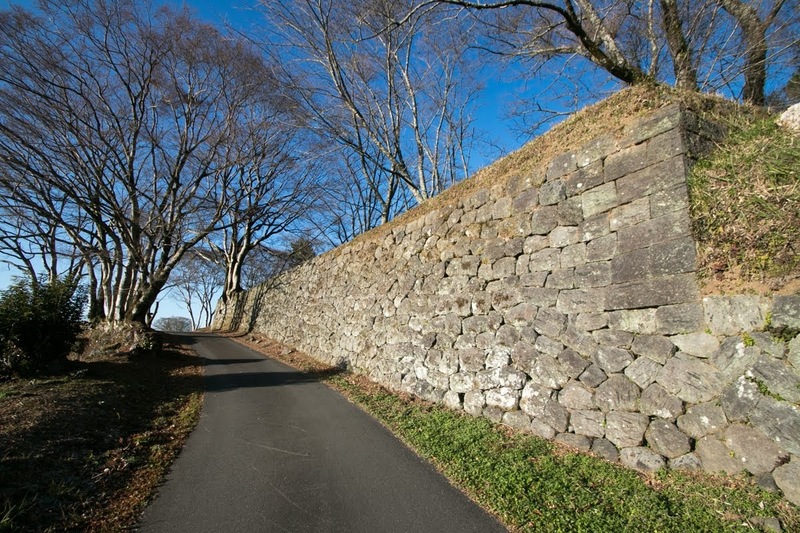 Beautifully curved tall stone walls are directly built on the body of the hill, and horizontally raising stone walls is a picturesque and famous scenery of the castle. Inner part of the castle was originally the main part at Shiga period and relatively keeps old shape of the castle being modified at minimum level. 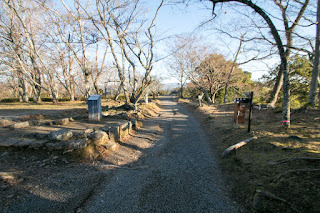 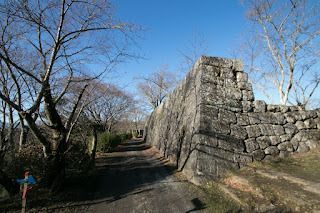 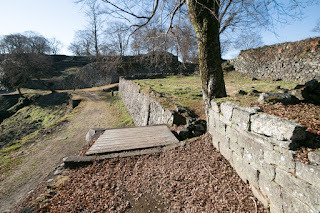 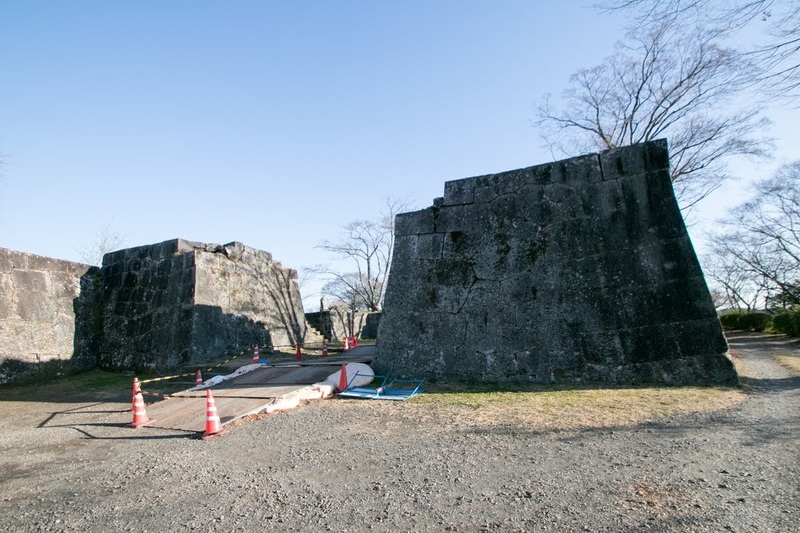 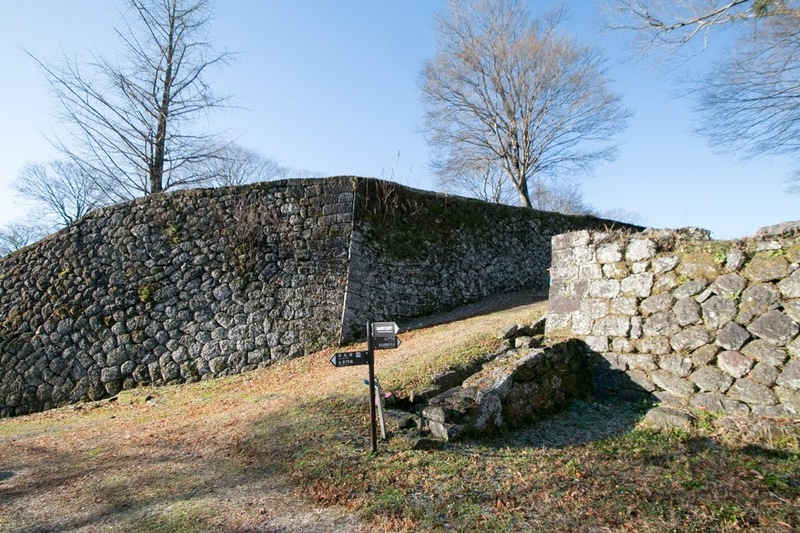 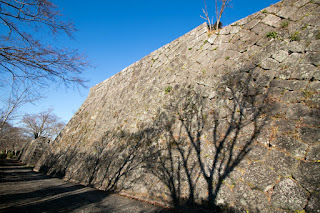 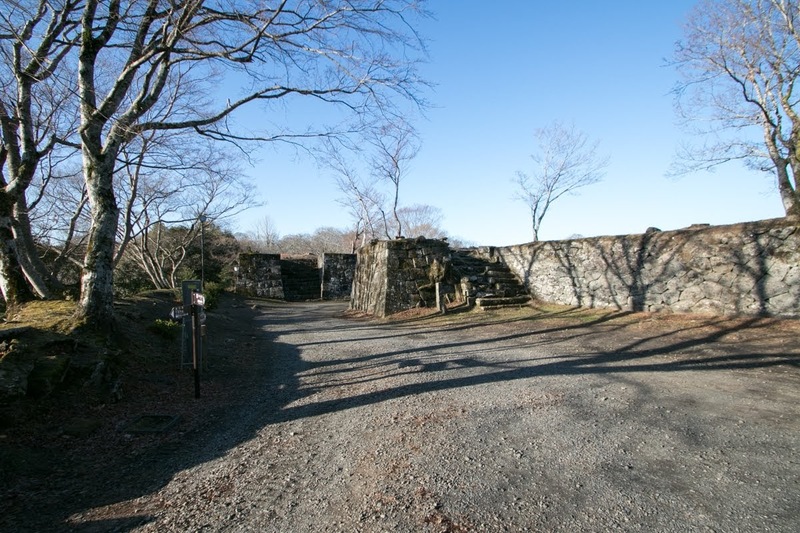 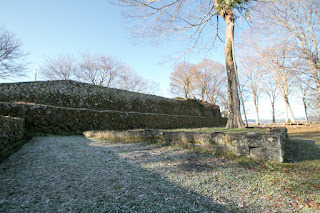 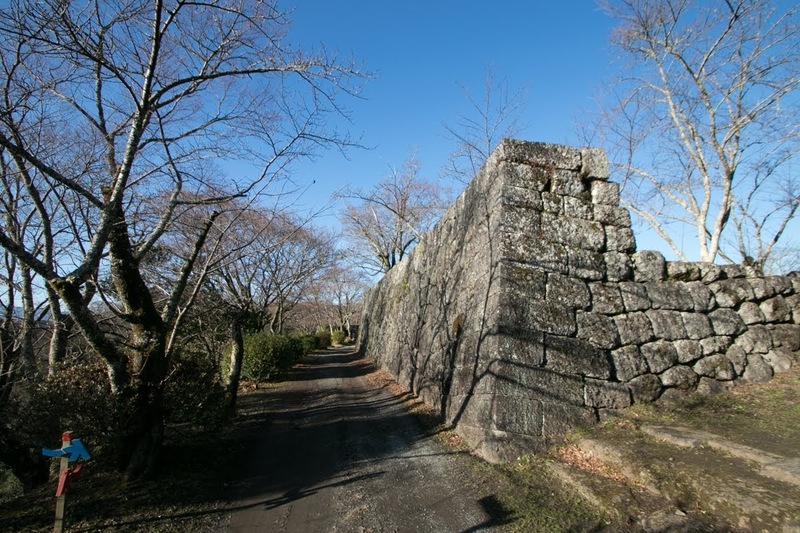 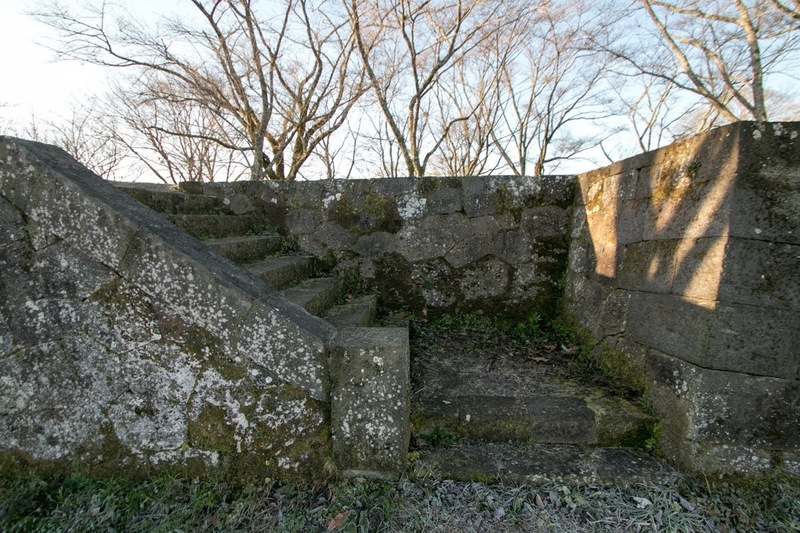 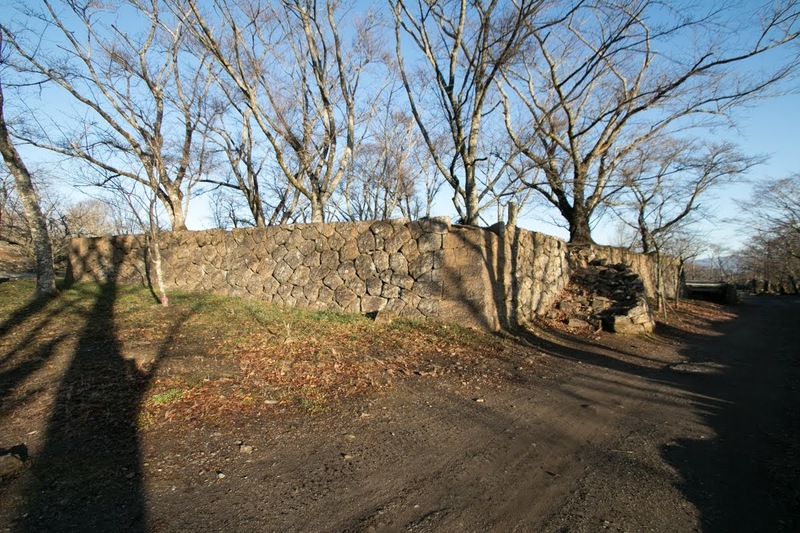 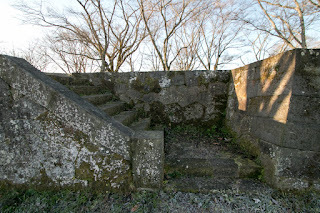 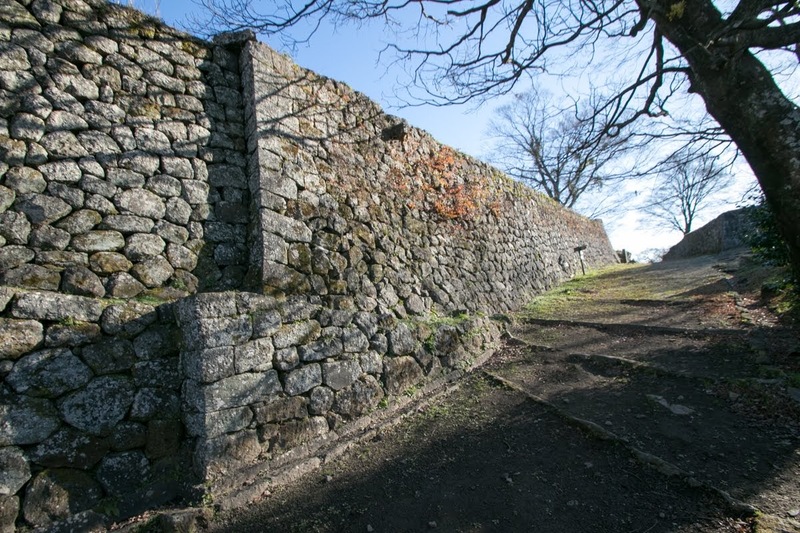 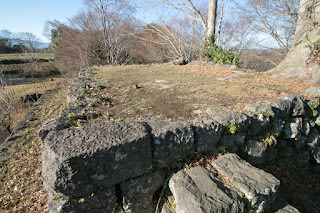 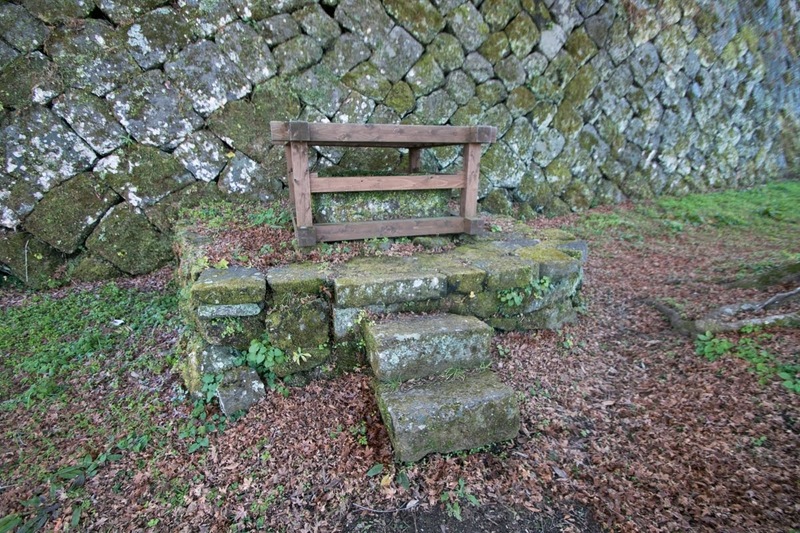 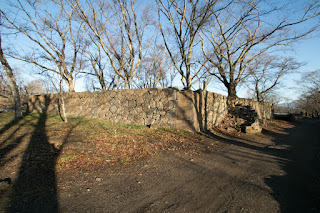 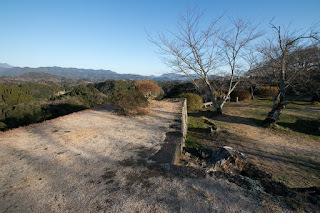 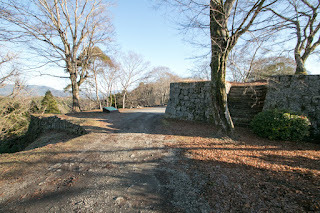 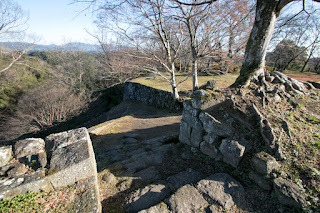 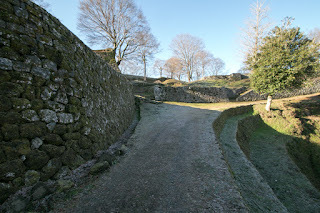 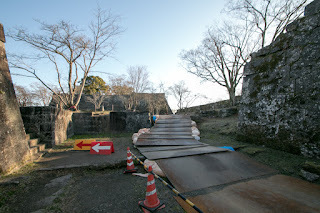 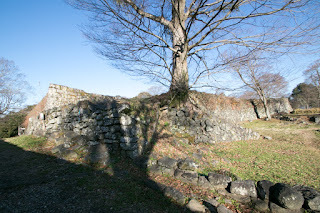 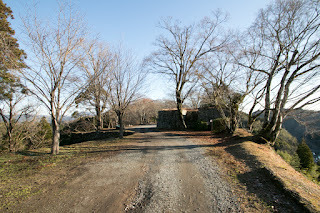 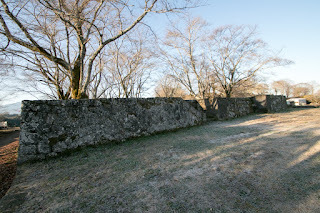 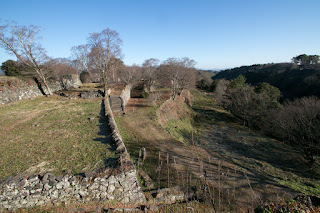 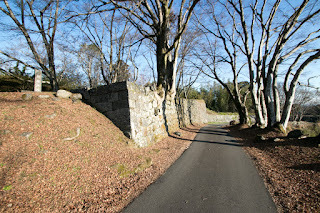 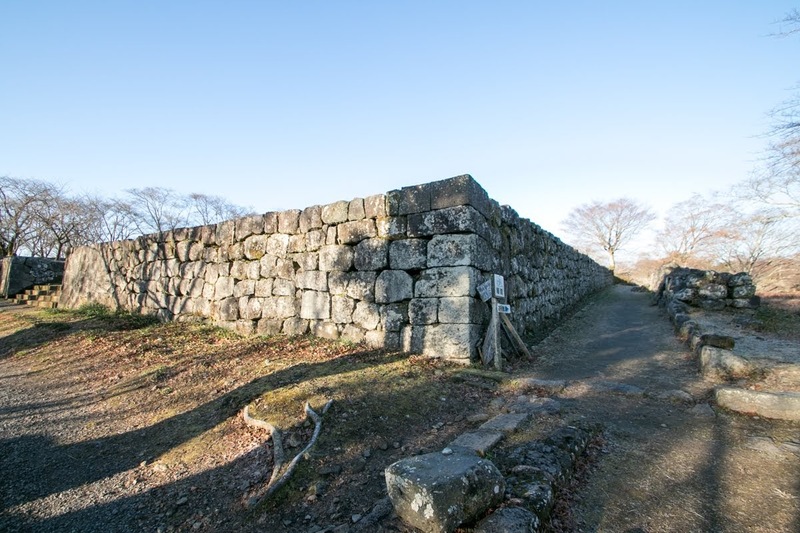 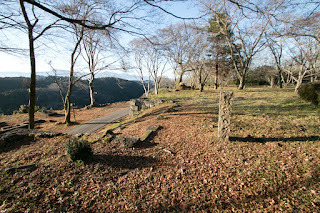 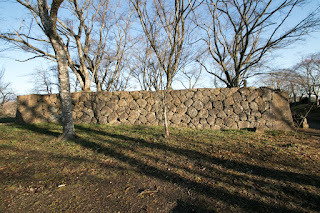 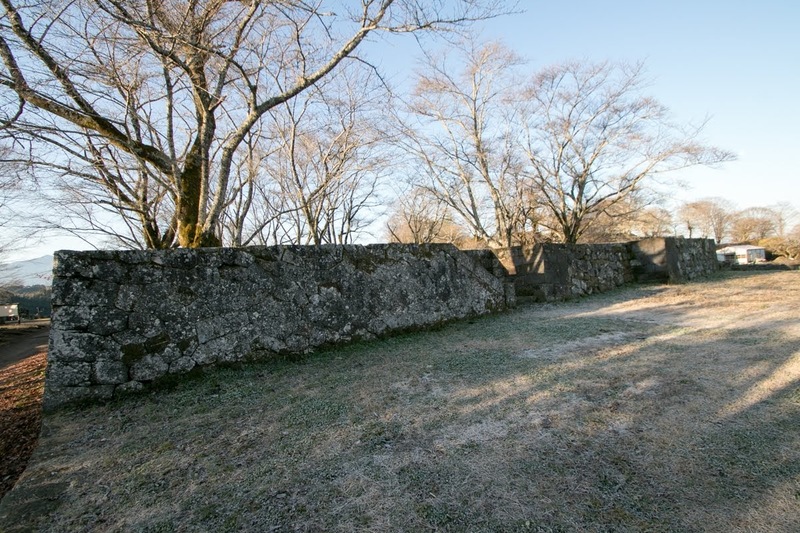 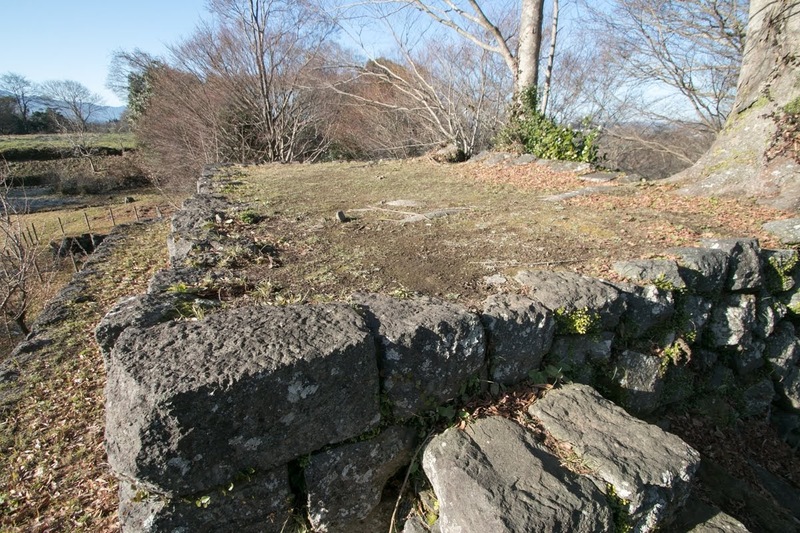 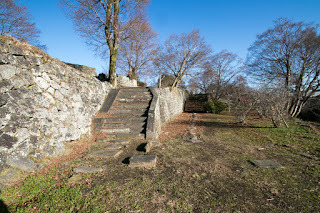 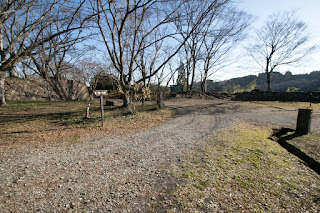 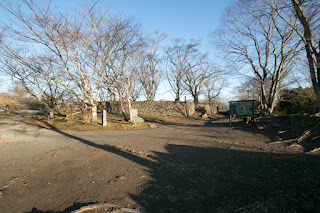 But Shimoharamon gate at the east edge of the castle was securely guarded by folding gate protected by tall stone walls. 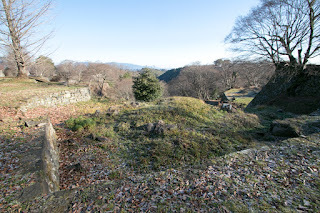 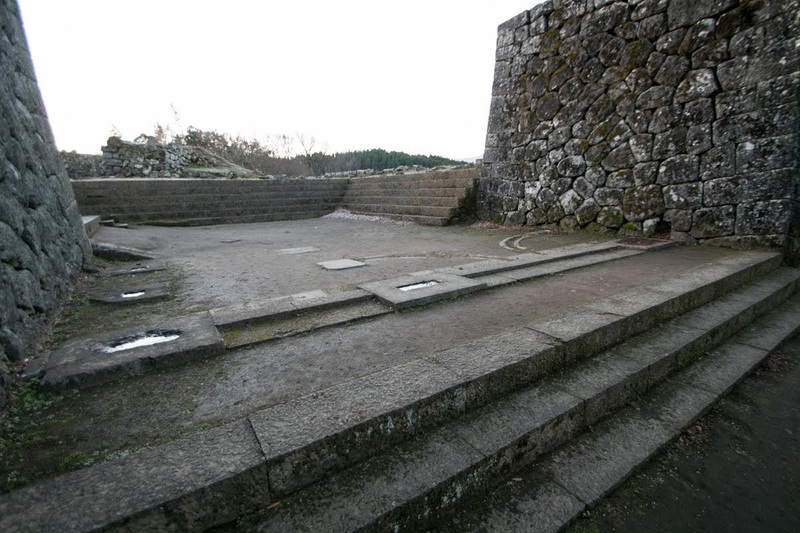 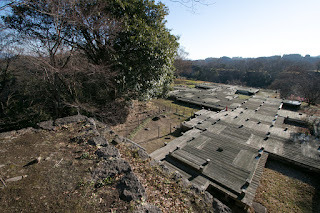 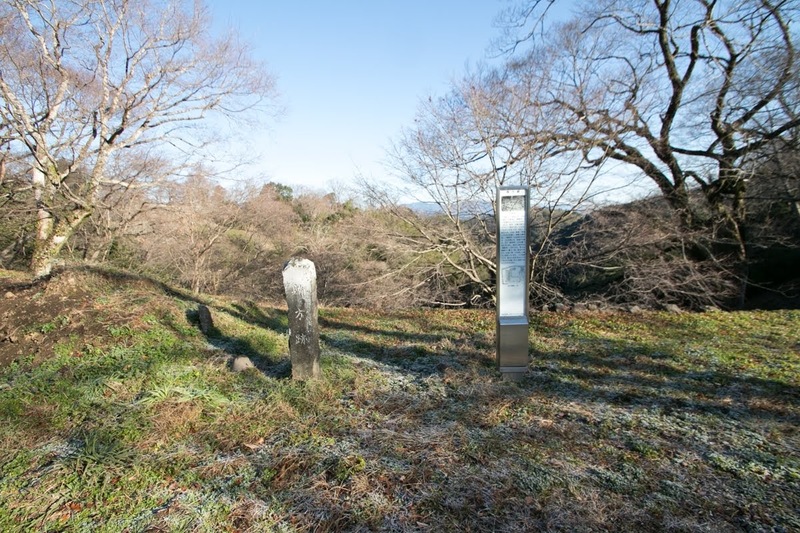 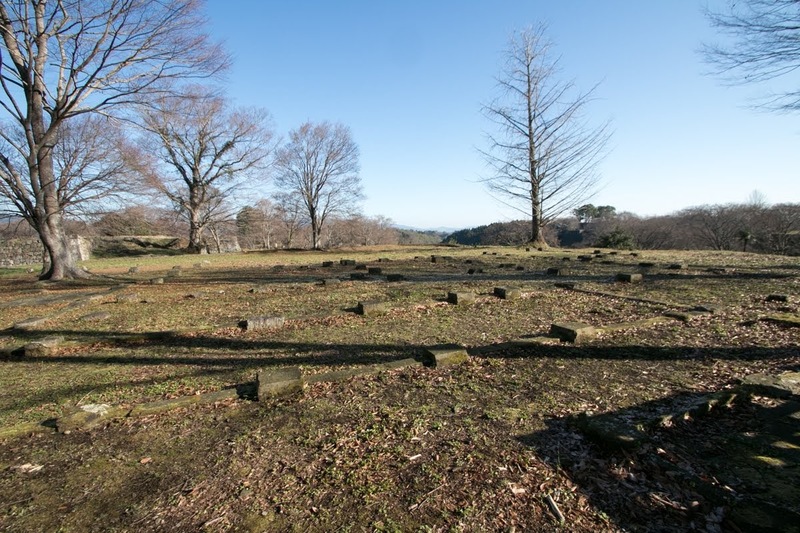 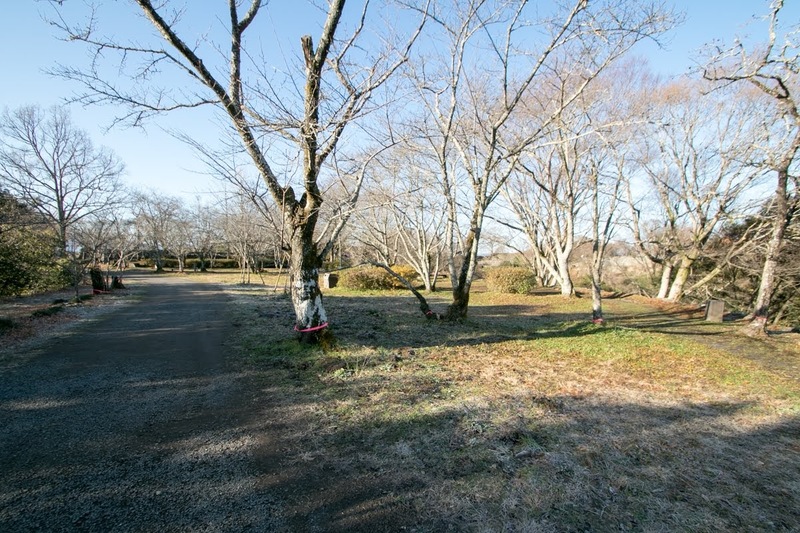 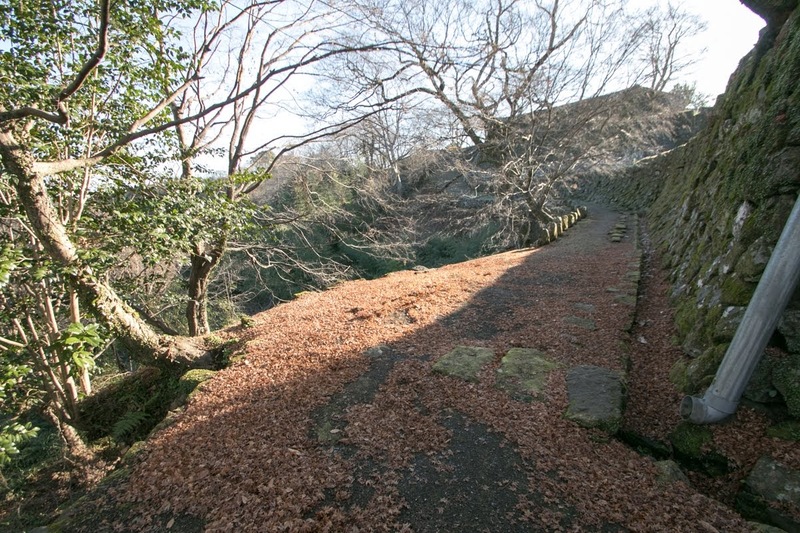 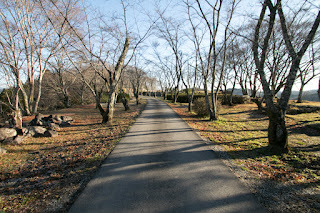 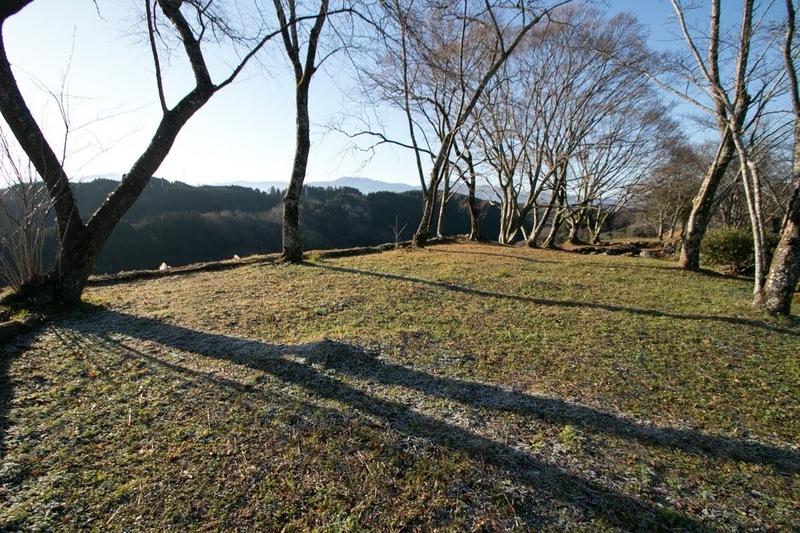 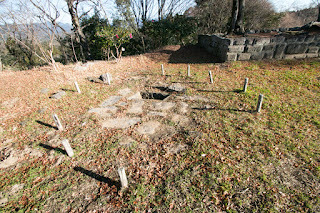 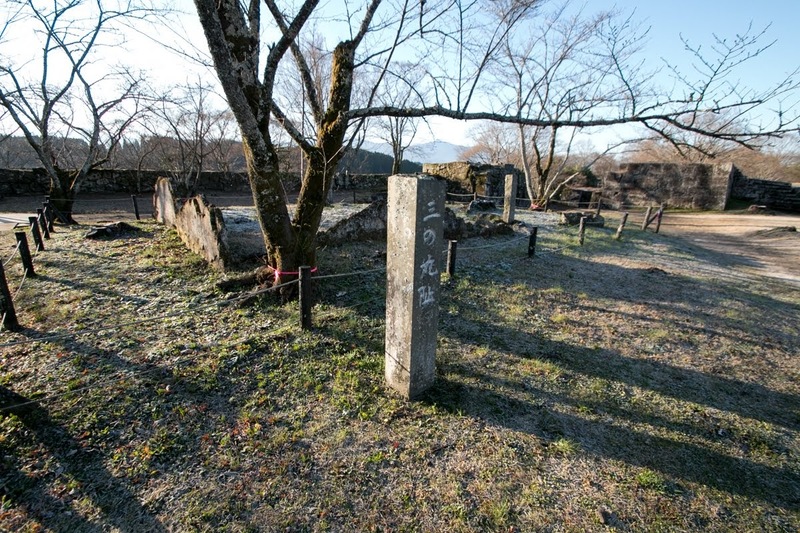 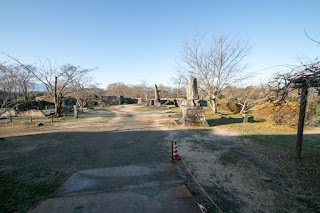 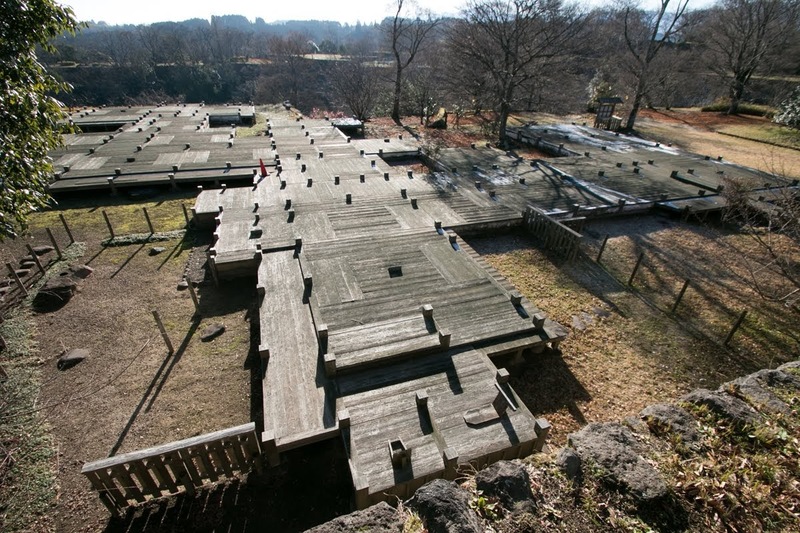 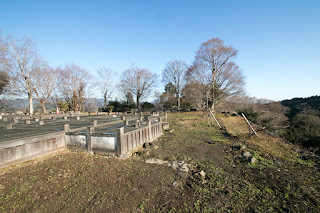 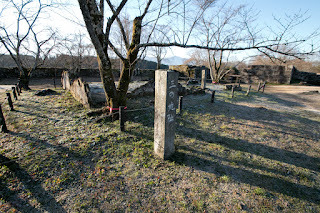 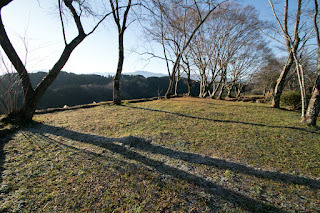 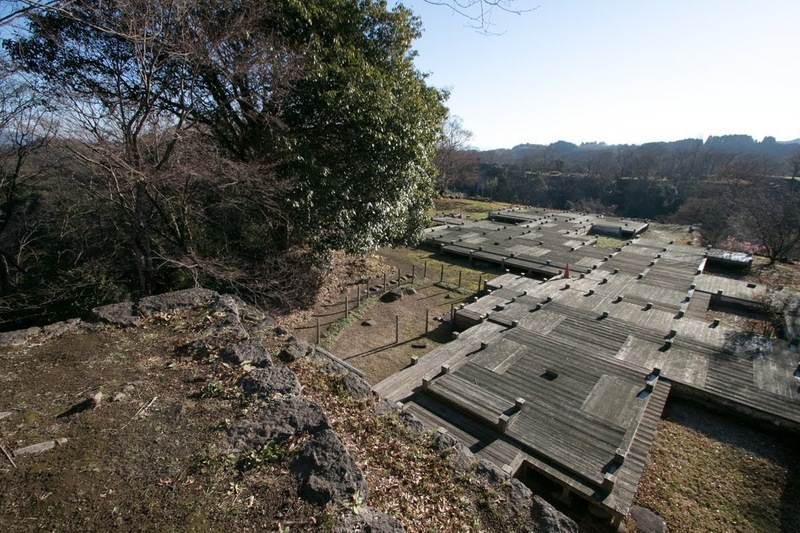 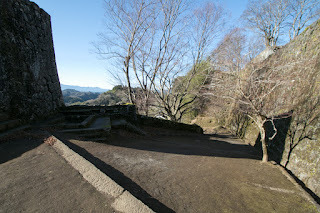 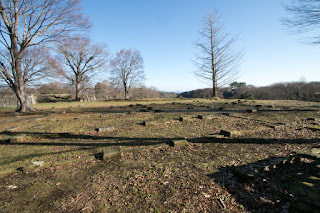 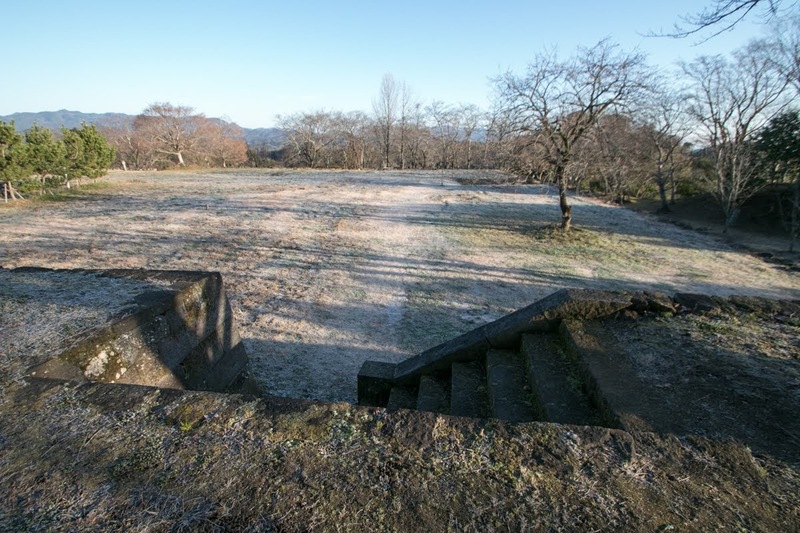 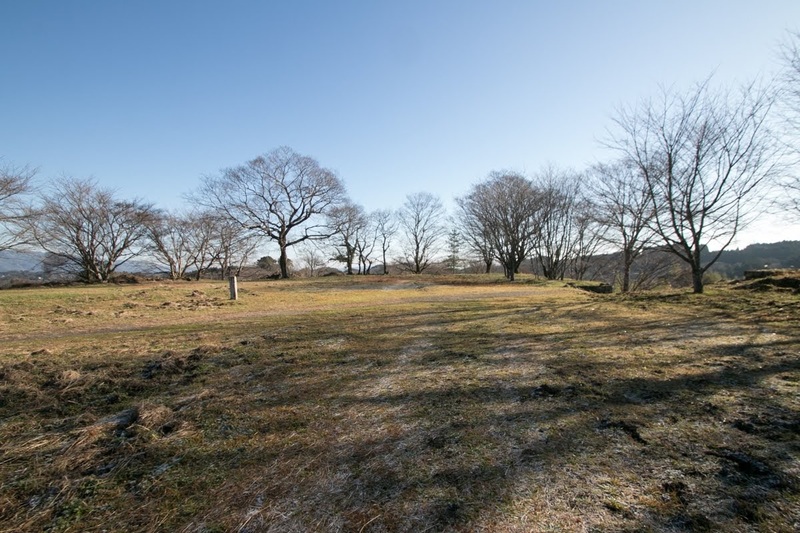 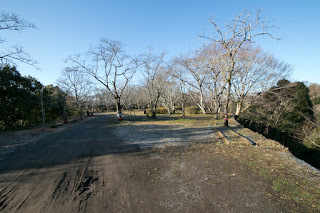 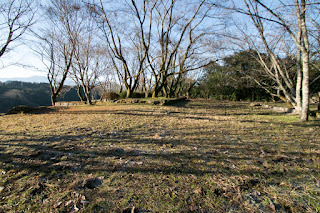 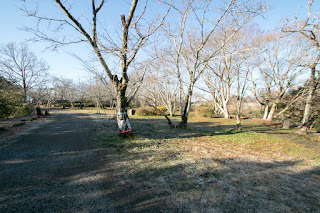 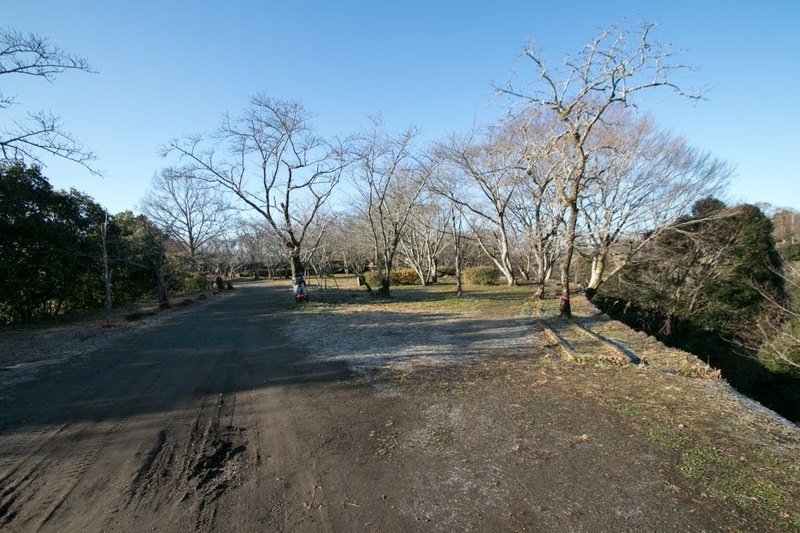 This inner area was treated as a sacred place for Nakagawa clan then used for the ground of tombs and shrines. 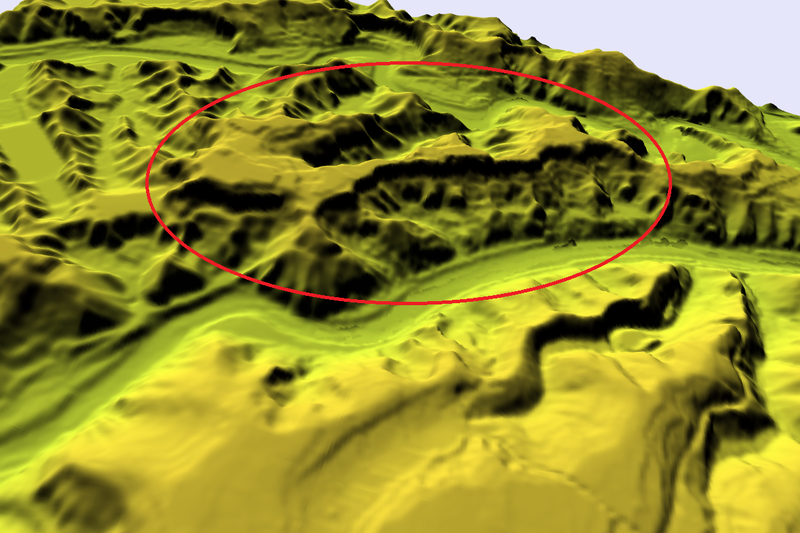 On the other hand, western part at the curve of J letter was a vast area developed in late period. 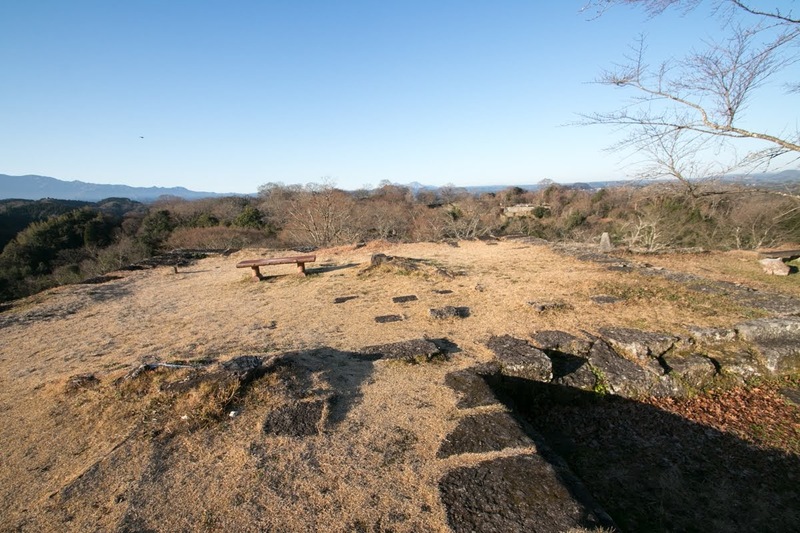 Western part consist of several large flat terrace of 100 meter long, which were used as residences of the lord and relatives. Each area has turrets and gates, and in case of emergency they could work as independent forts. 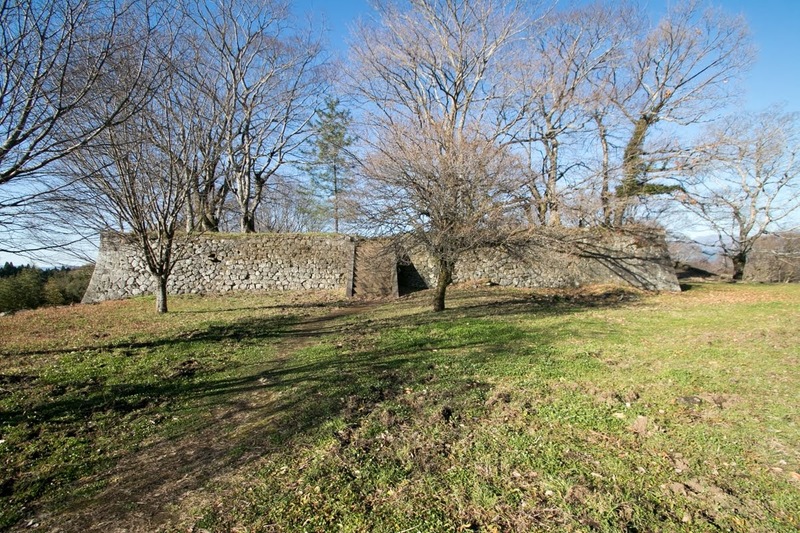 Main gate from hillside is built the south edge of the area, and backside gate locates at the north part. Interestingly western area has elements of western castles such as curving vertical stone walls, broad steps with rampage or stone built virtical tower. 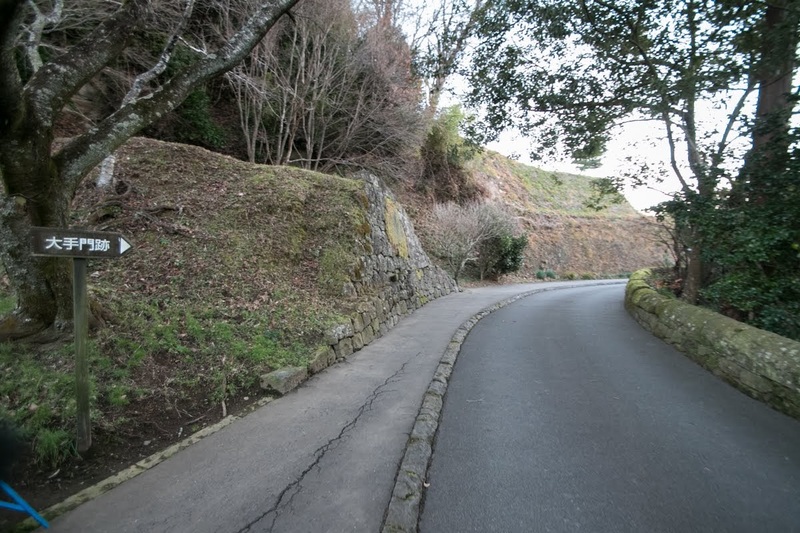 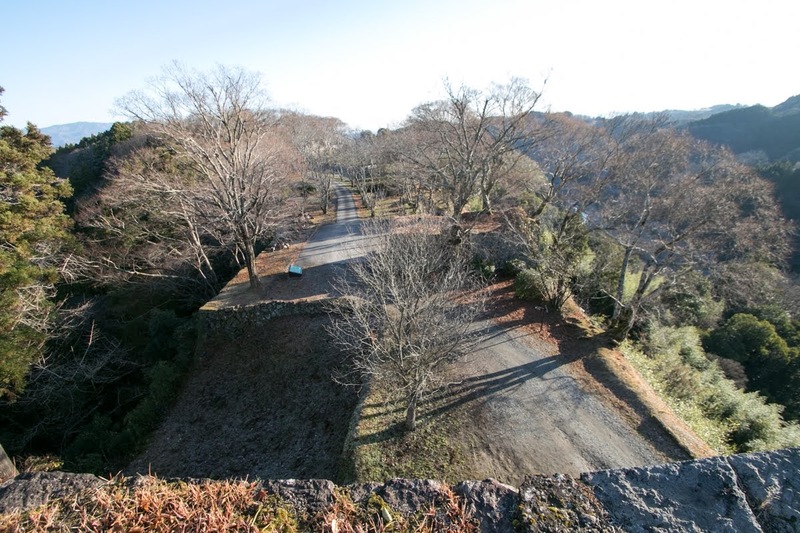 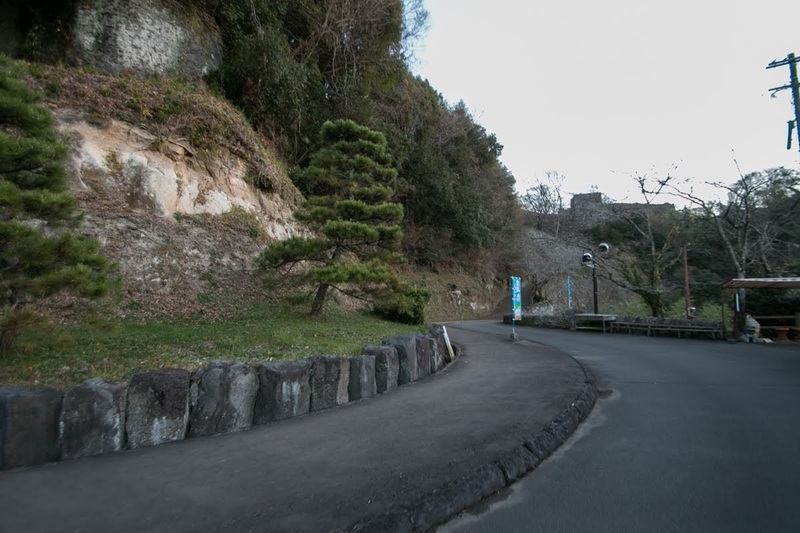 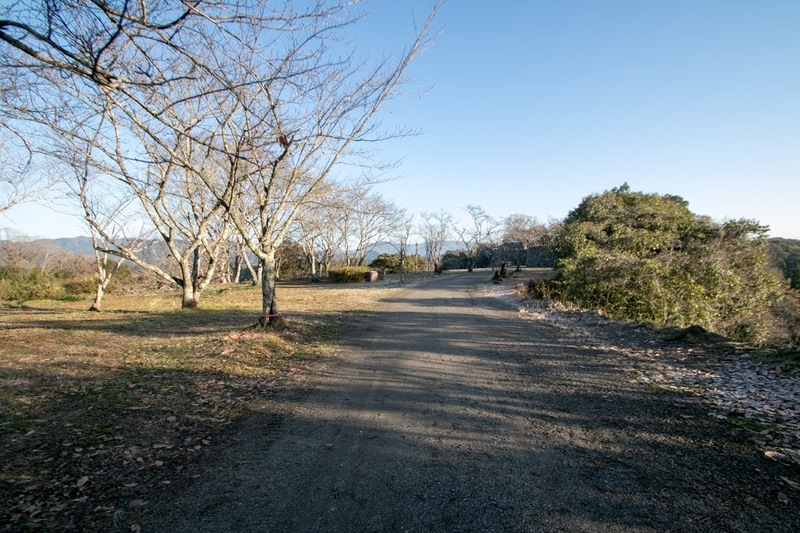 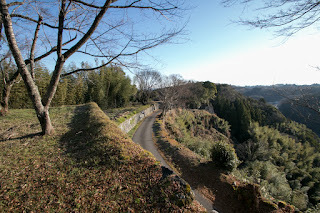 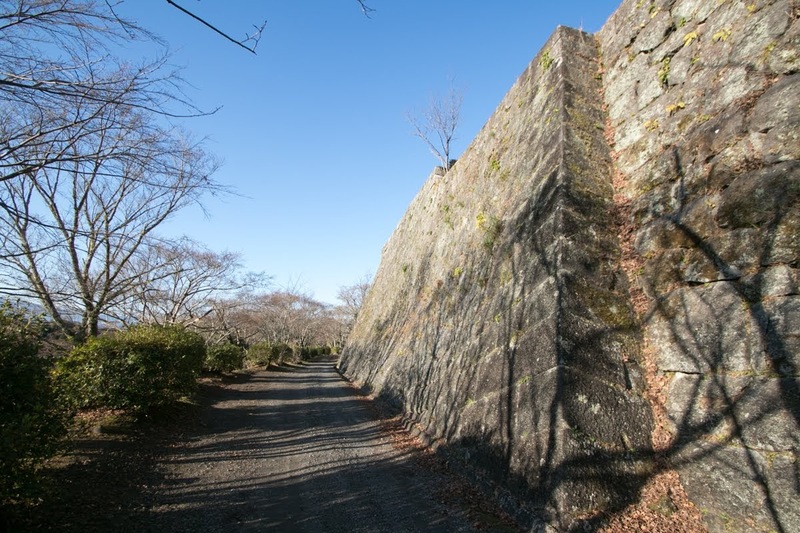 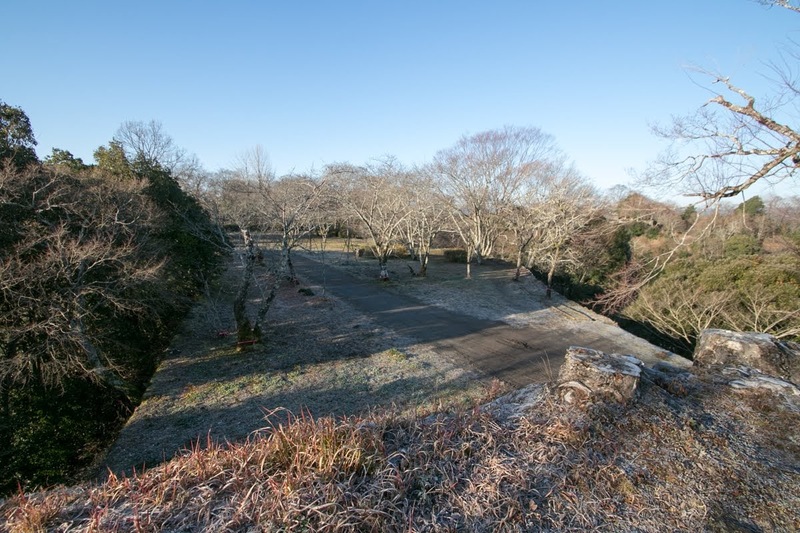 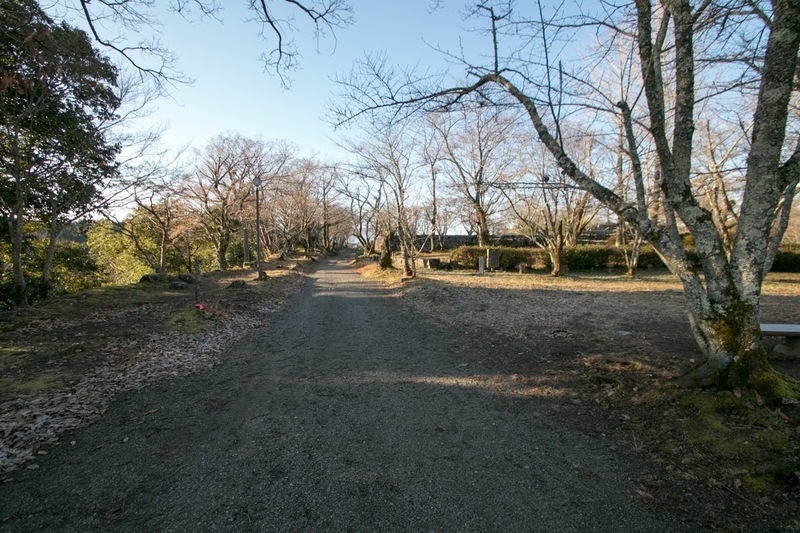 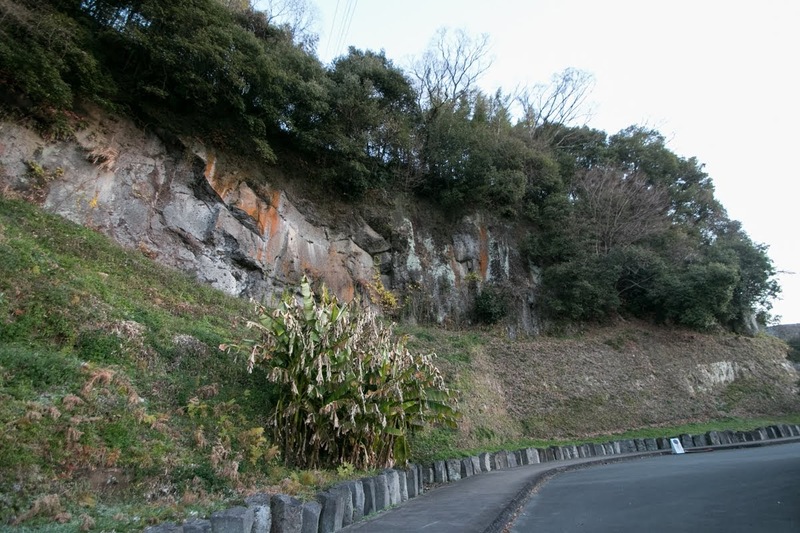 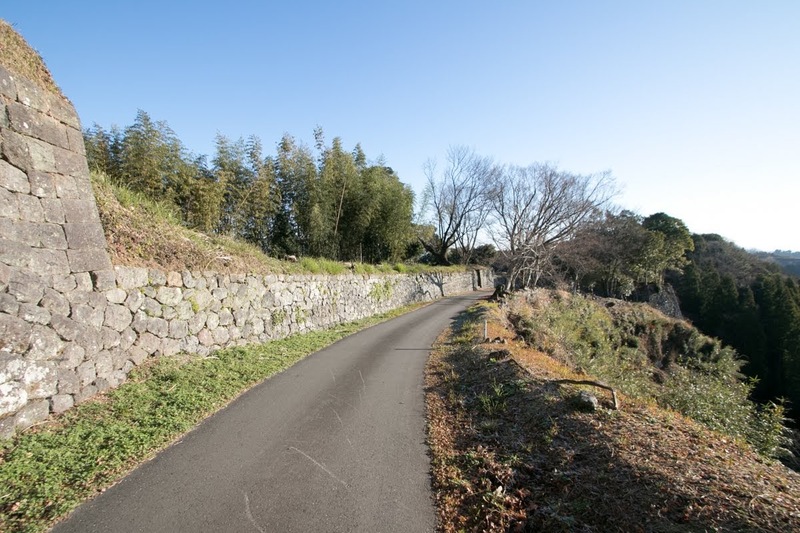 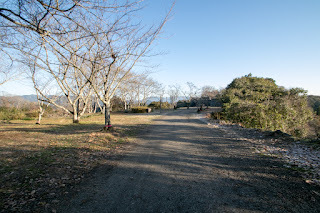 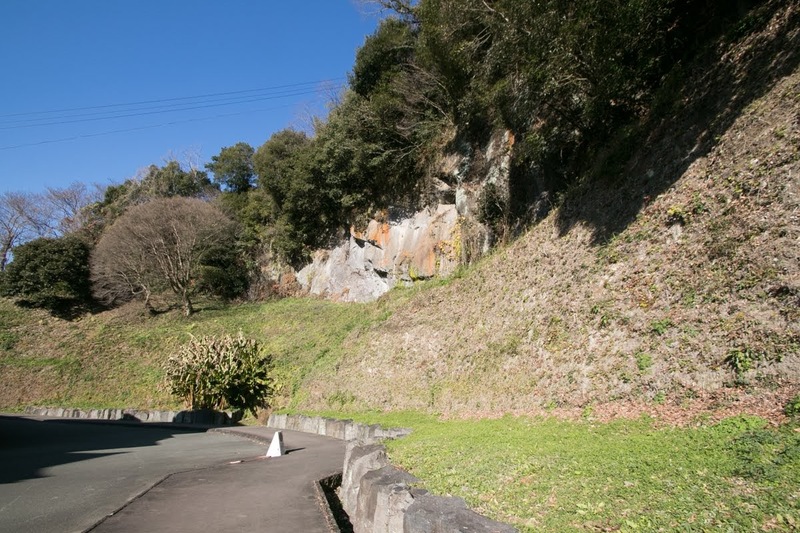 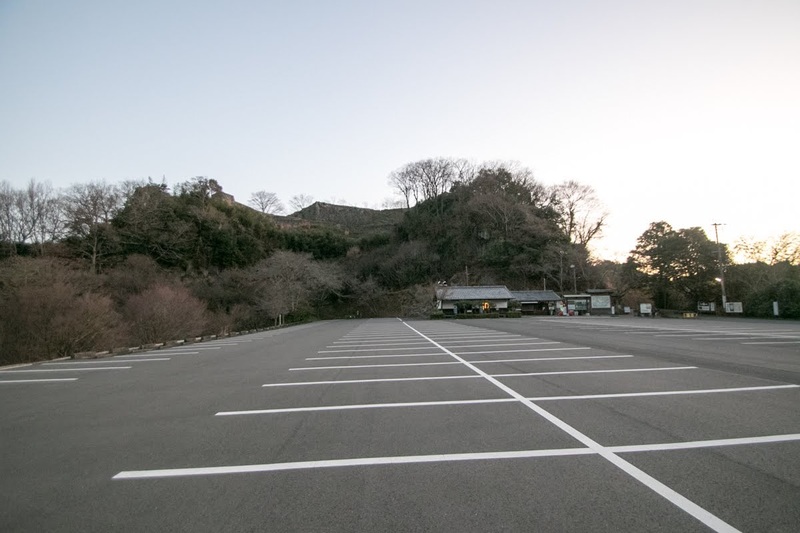 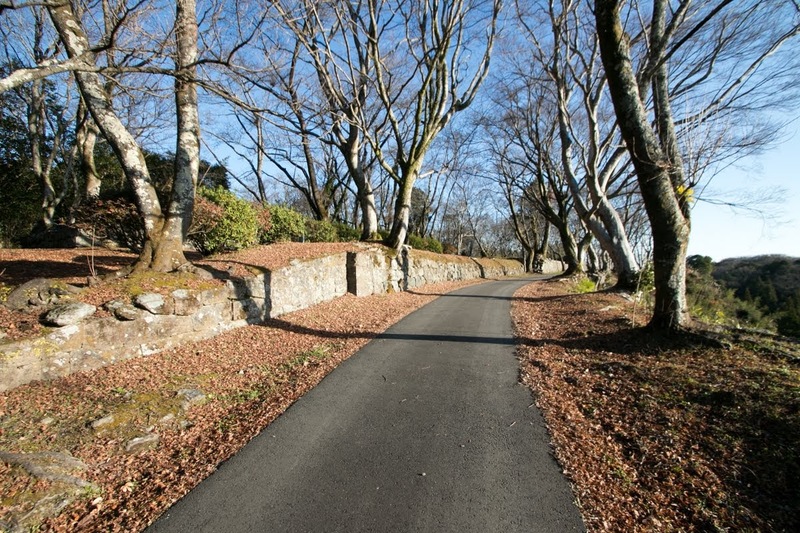 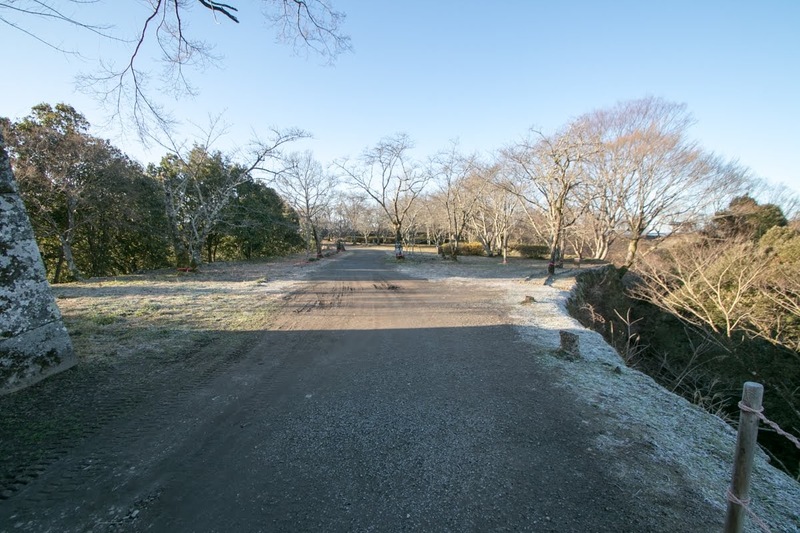 Especially broad and gentle slope from main gate to Nishinomaru palace have nearly 50 meter width and quite resembles to western palaces on the hill such as Windsor castle. Originally Chikatsugu Shiga was a Christian had a name of Don Paolo, and Hidenari Nakagawa was also said as a believer of Catholic. 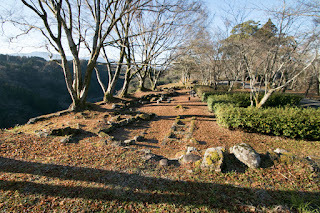 Such environment called many Christians to this area, and also brought Western culture to this place. In Oka town there was a cave church used even after banning of Catholic. 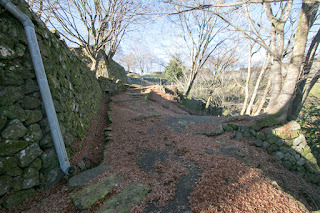 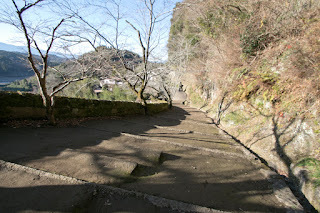 Just below the hilltop area there was a narrow terraces between mountain and river, and was used as a guardian’s place. 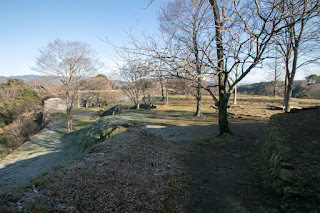 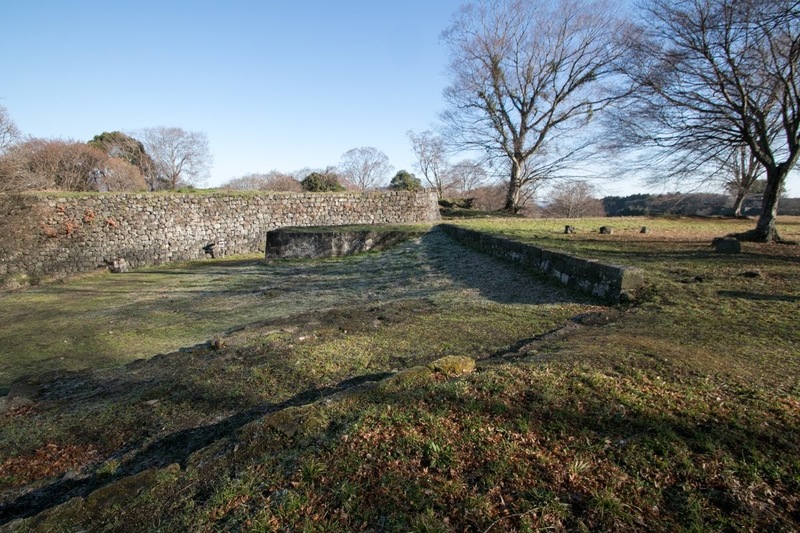 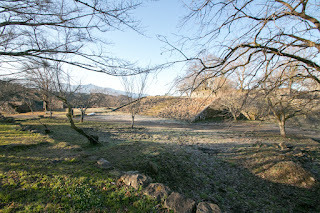 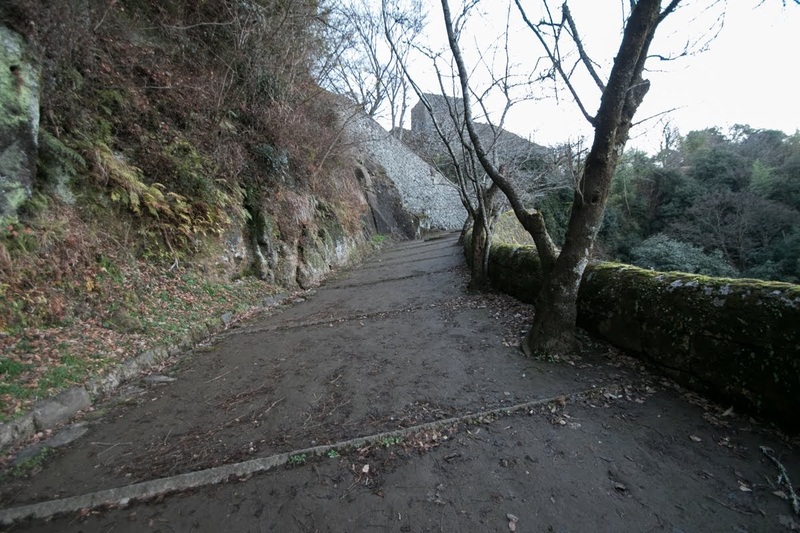 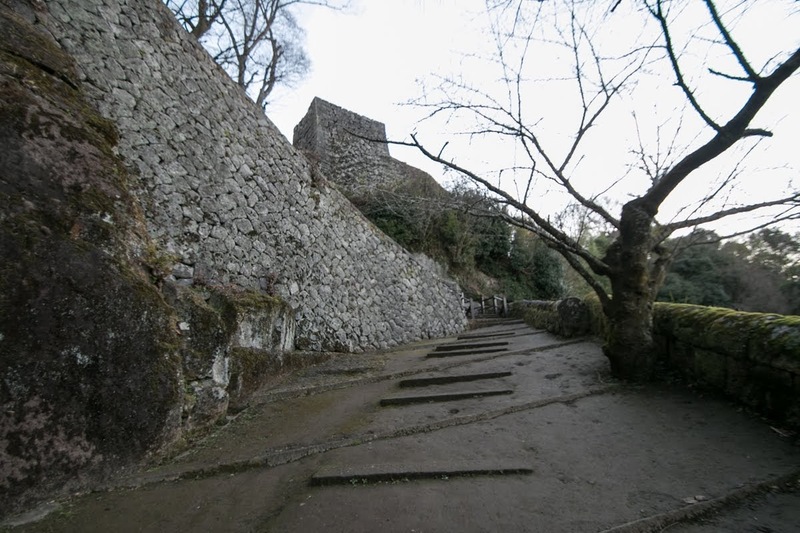 At the west of the castle, castle town was built at flat area protected by curving river. 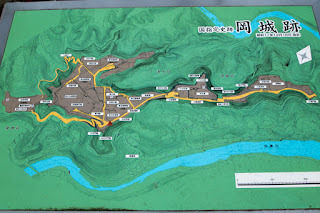 Total length of castle including castle town exceeds 1.5 kilometer, and it was equivalent to the castle of the lord which was double or triple size territory. 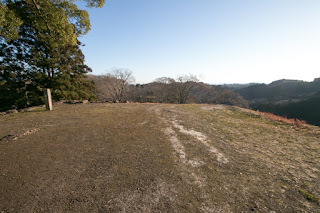 At such inland area it is mysterious why small domain could build and maintain such a huge castle, but one reason might be that the hill itself was so suitable for castle and additional ground construction was not necessary. Nakagawa clan held Oka castle by the end of Edo era. 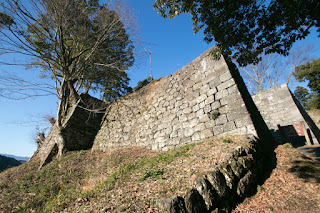 Subsequent to Meiji revolution, Oka castle was abolished and all buildngs was broken. 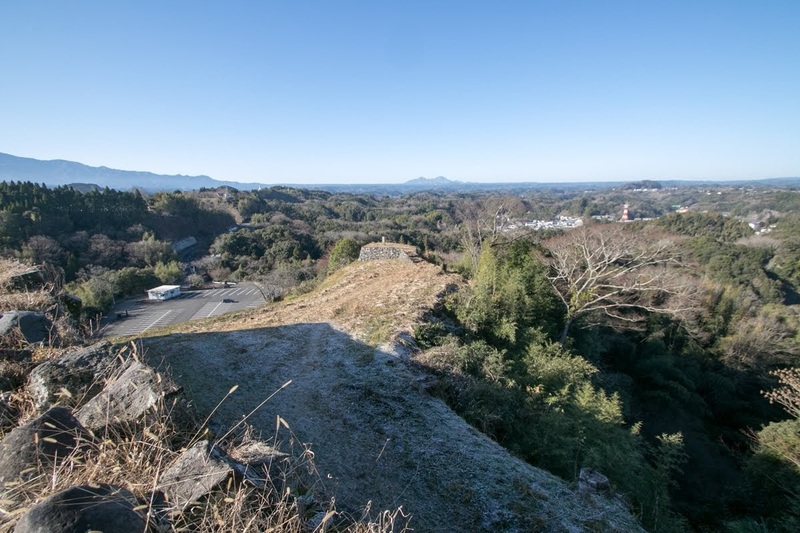 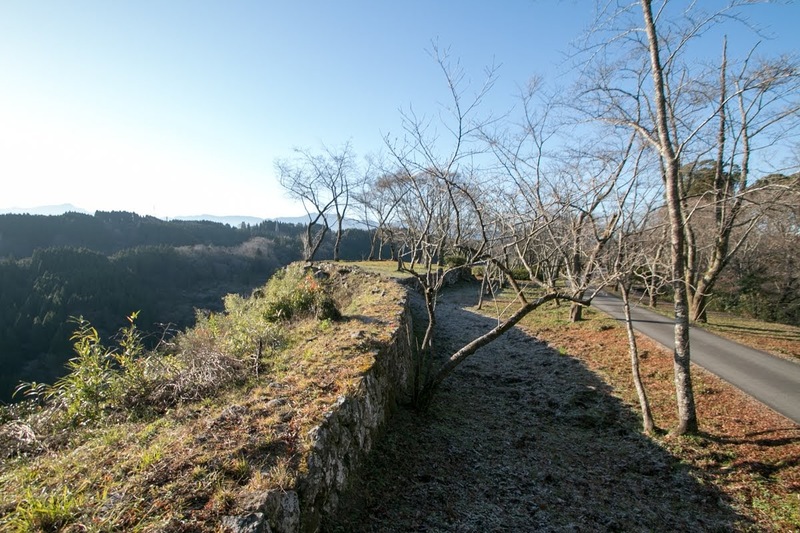 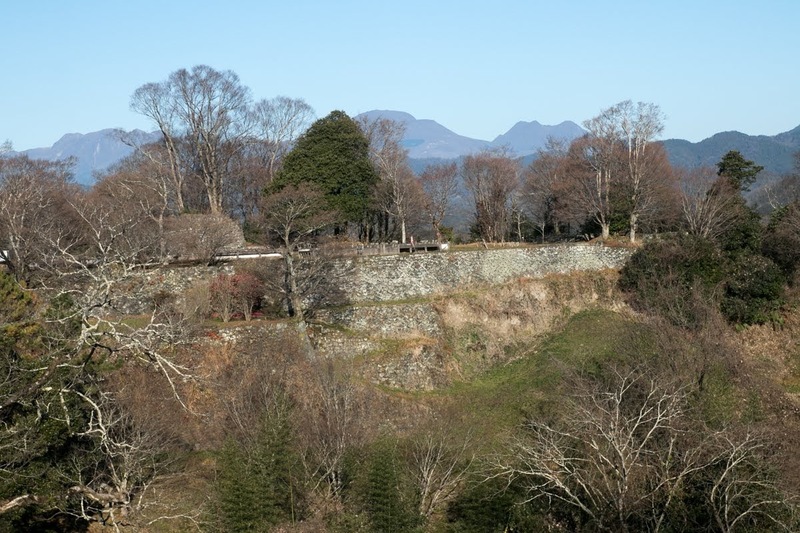 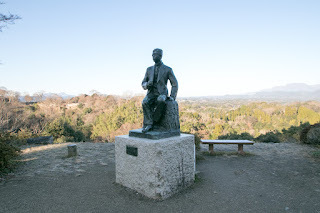 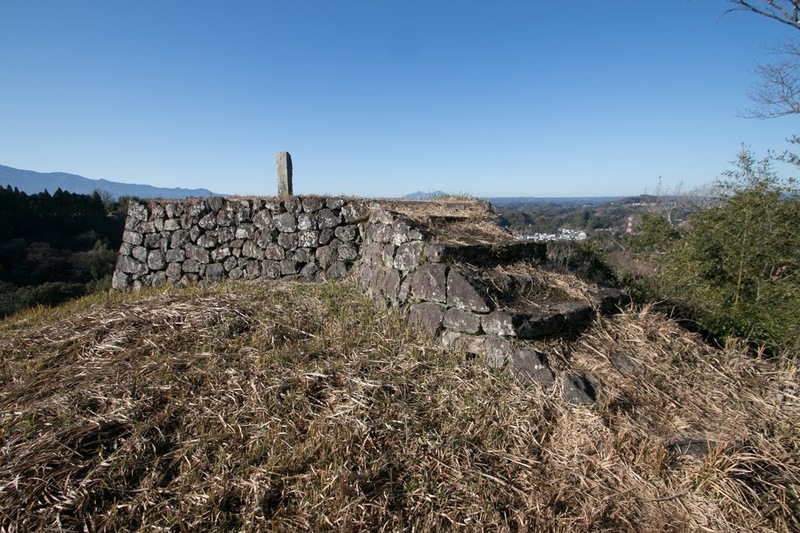 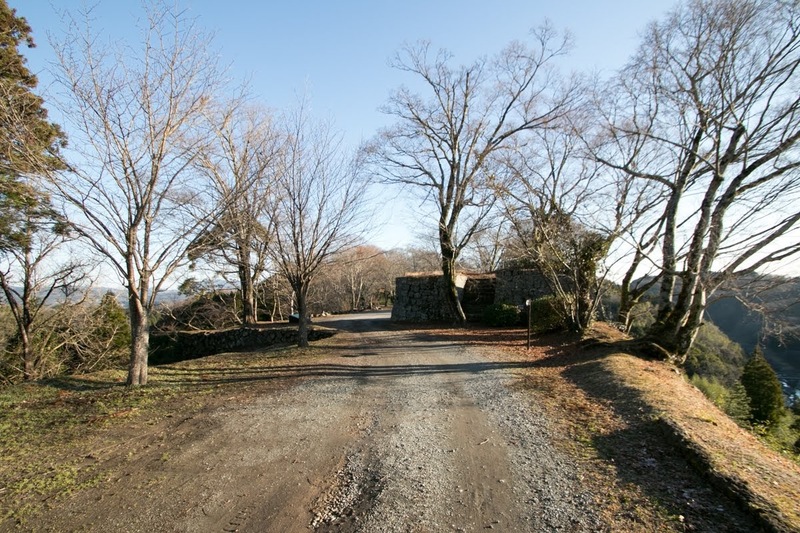 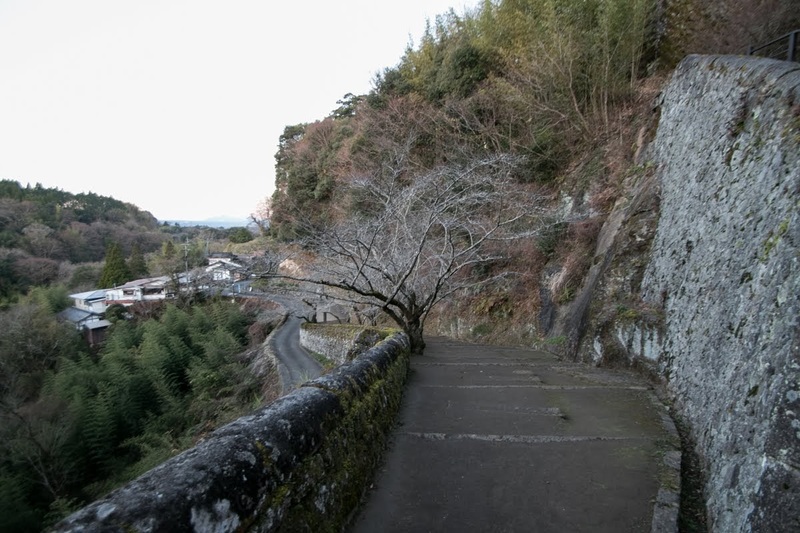 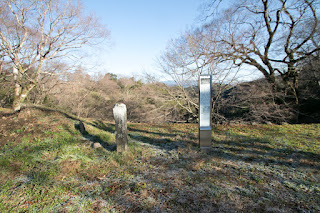 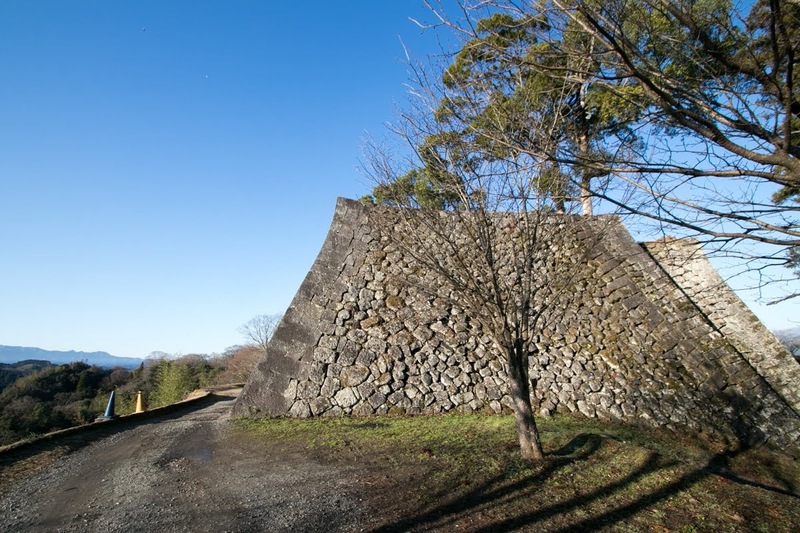 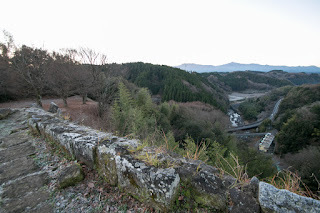 Remaining stone walls was forsaken, and Rentaro Taki (1879-1903) who was a famous composer of Meiji era grew in Oita prefecture saw this scenery and composed “Kojyo no Tsuki” (moon seen from devastated ruin of castle) using the lyrics of Bausui Doi (1871-1952). 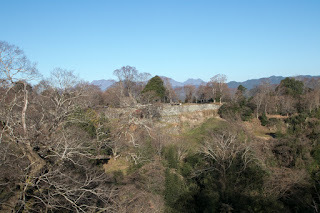 Incidentally, it is said that Bansui made this lyrics from the image of Sendai castle (Miyagi prefecture). This song became popular song taught at school because of its melancholic melody. 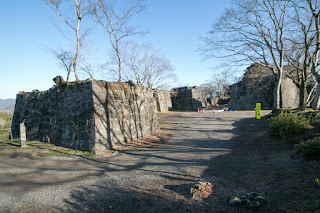 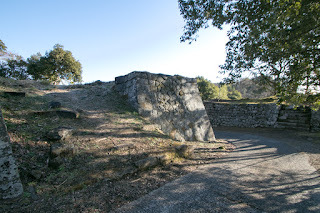 Now the castle site is well prepared as a historical park and visited by many people. 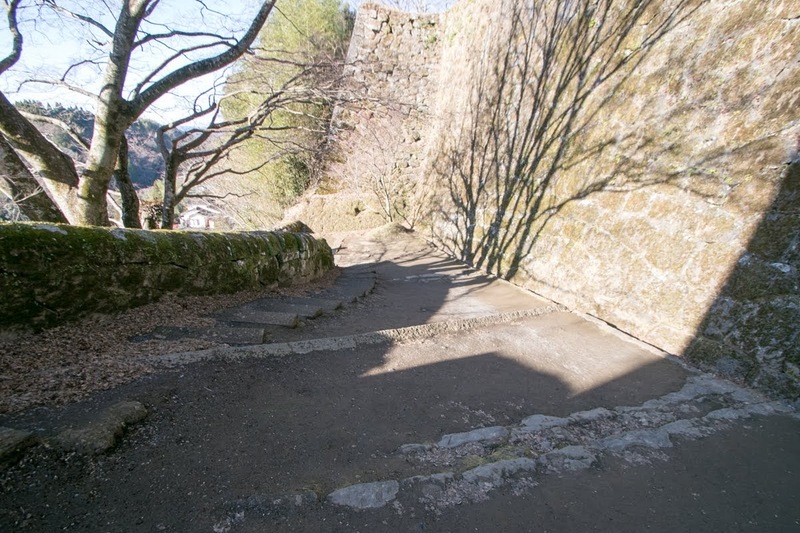 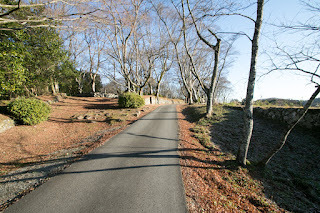 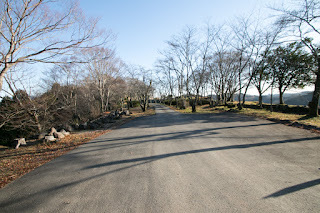 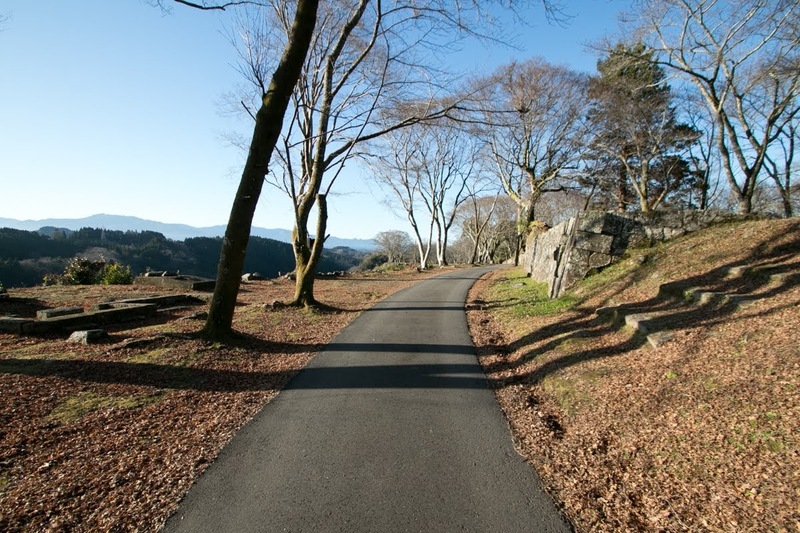 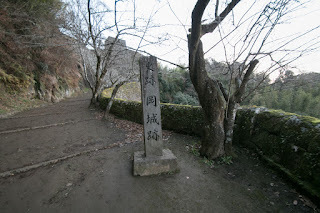 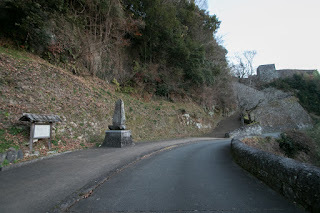 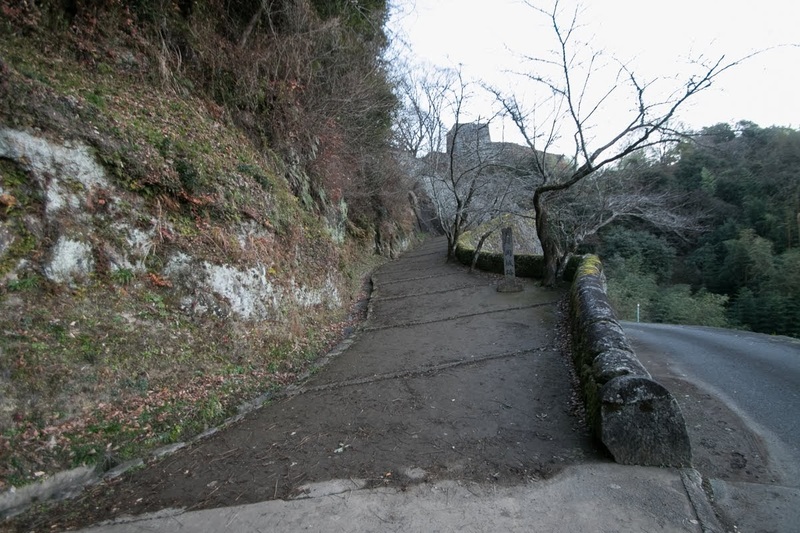 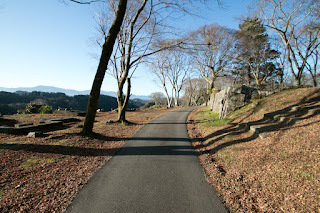 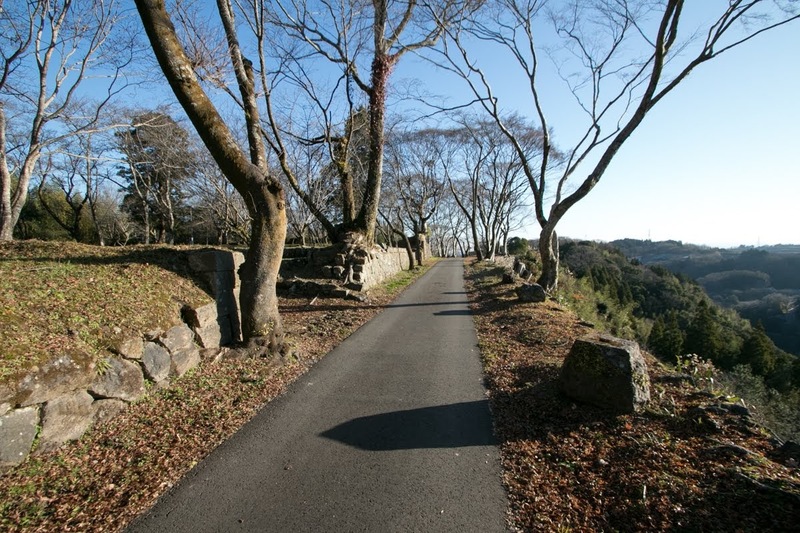 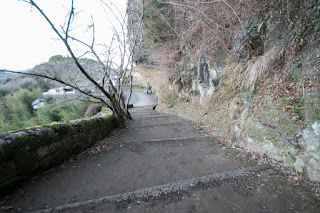 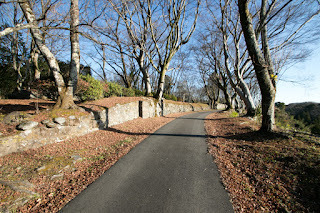 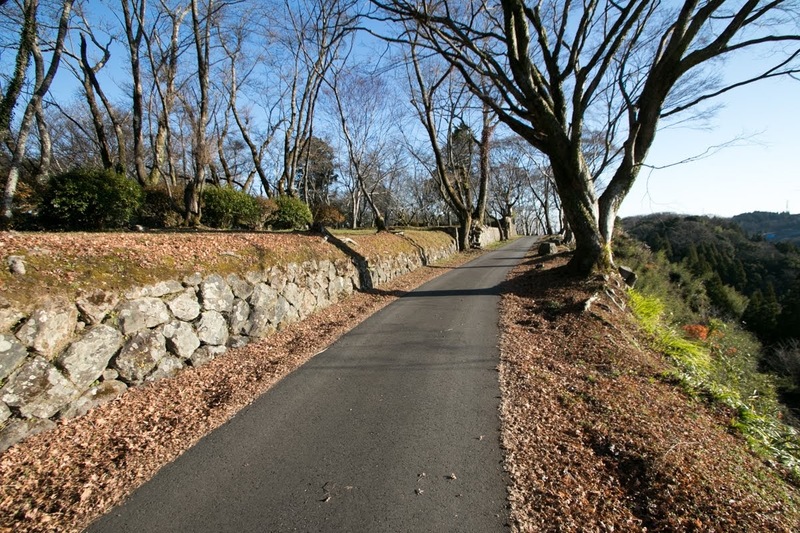 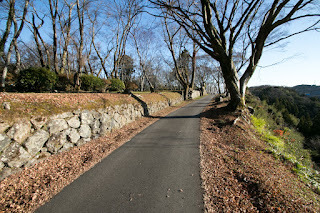 At the road just below the castle there was a special pavement, and when car passes this point, using the friction noise the melody of “Kojyo no Tsuki” is played. But regrettably most cars run too fast this point thus the melody hears uptempo totally different from the melancholic image of original song. 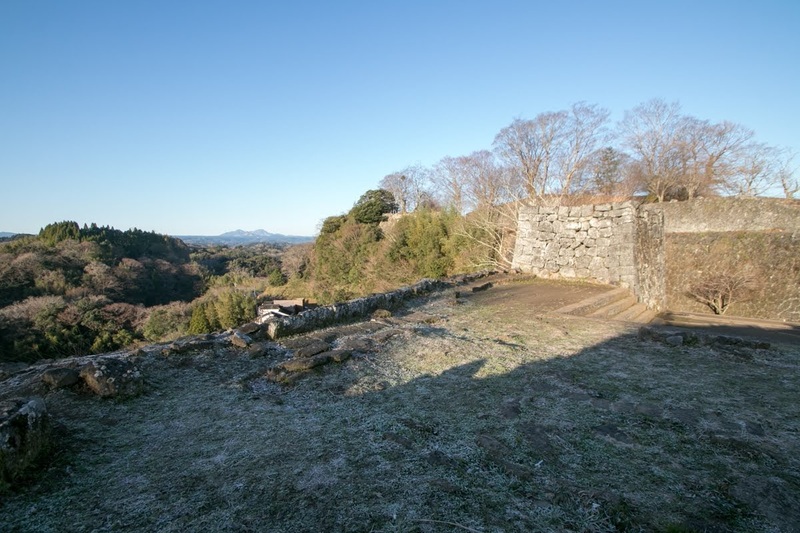 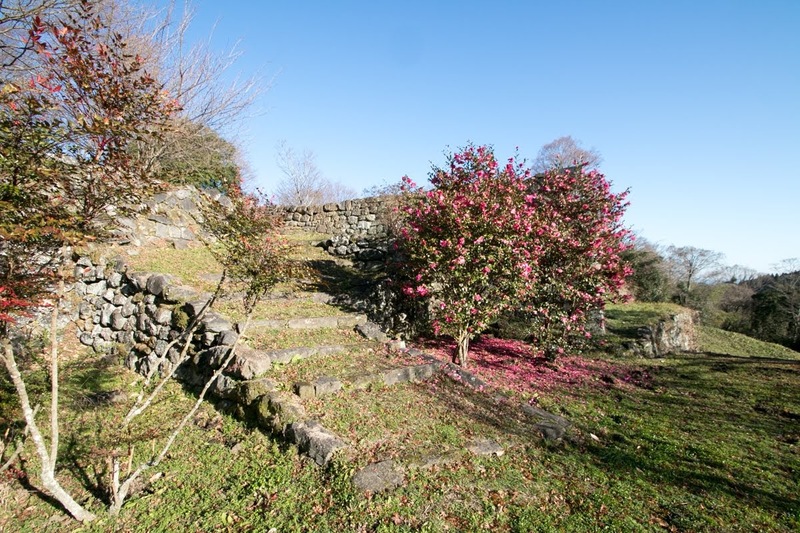 Anyway huge and magnificent castle consist of magnificent western area, secure central area with rising stone walls and traditional inner area is truly worth for visiting, even though being located at deep inland area of Kyushu island. 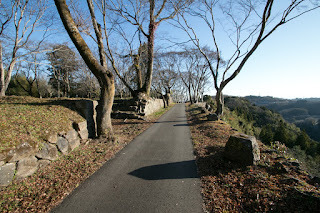 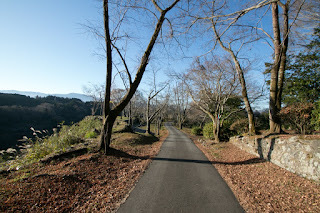 There still remain many old houses in castle town, and Takeda town is also praised as a little Kyoto in Kyushu island. 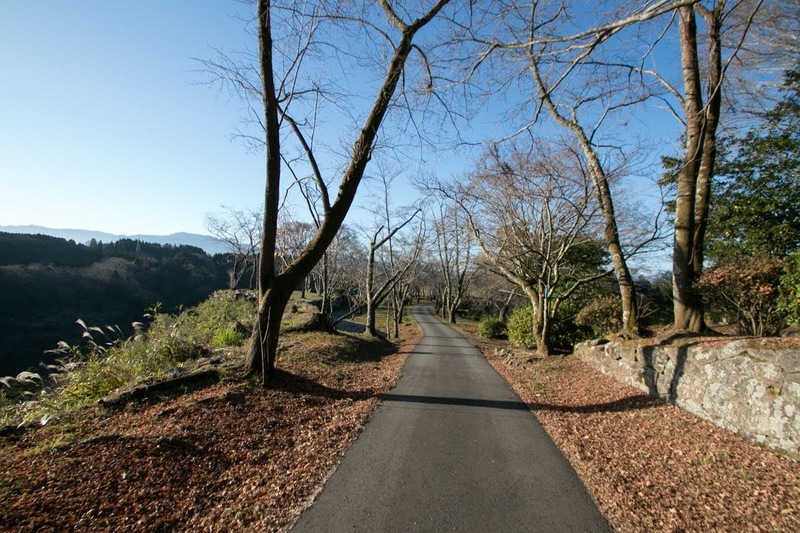 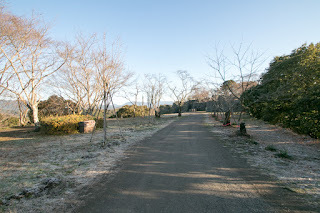 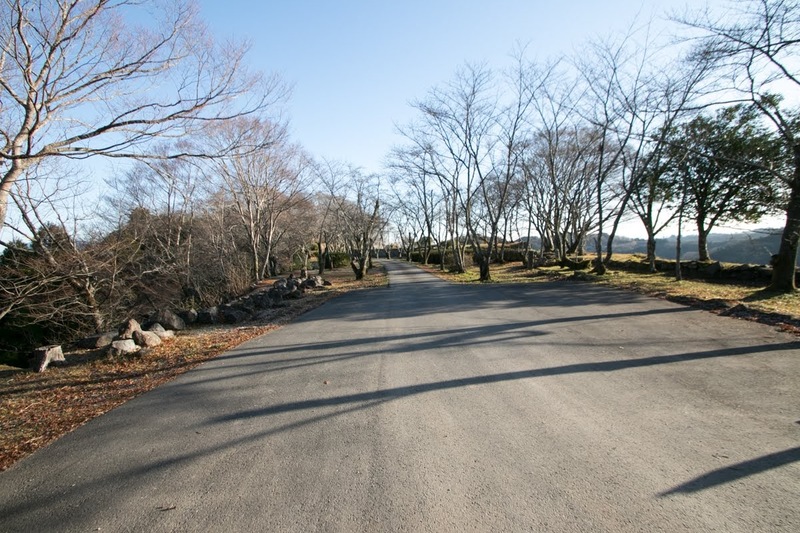 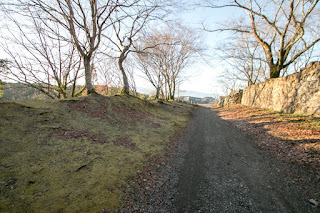 25 minutes walk from JR Kyushu Houhi Honsen line Bungo Takeda station. 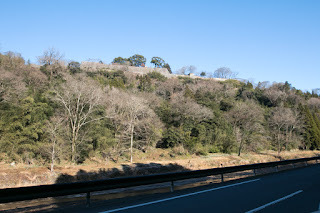 60 minutes drive via Route 10 and Route 57 from Oita city.